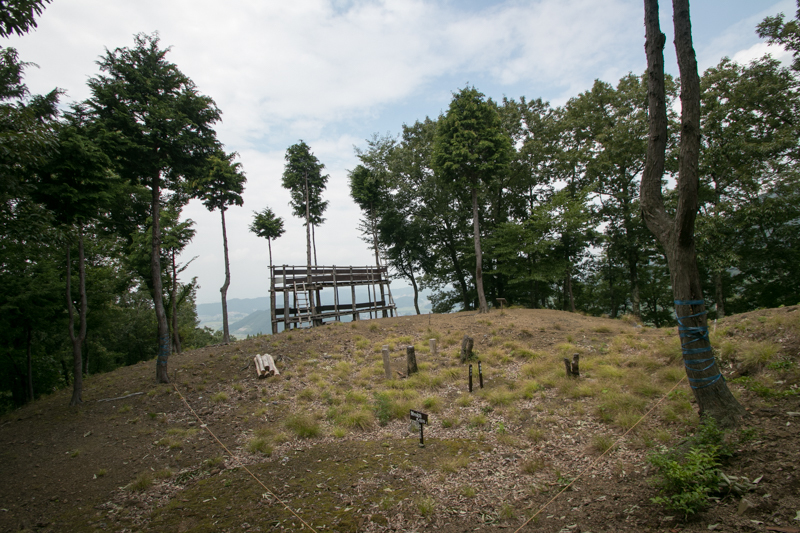 Kamaha castle (鎌刃城) is located on a ridge spreads westward from Ryozen mountains toward Banba town, about 200 meter height from hillside. 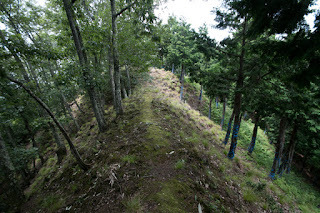 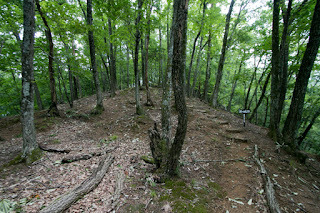 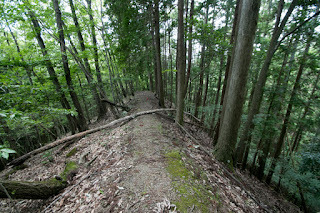 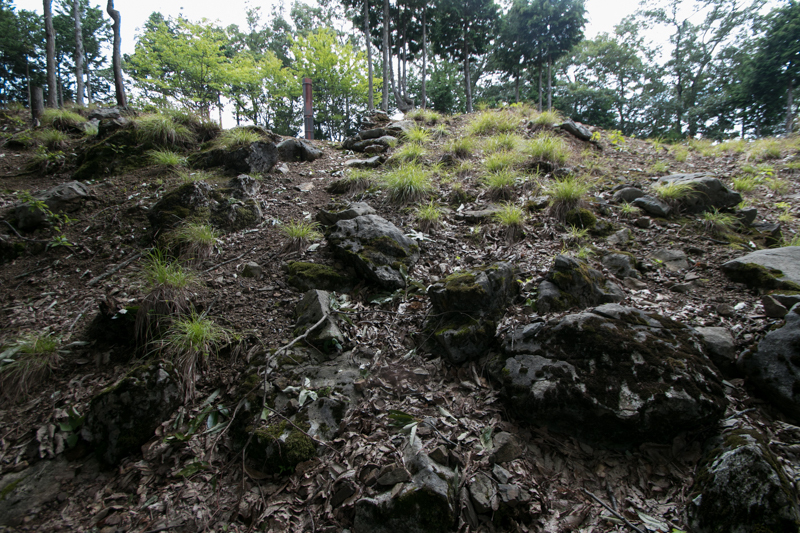 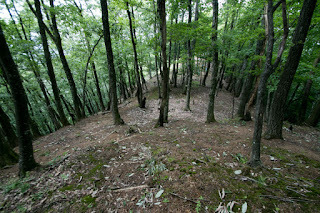 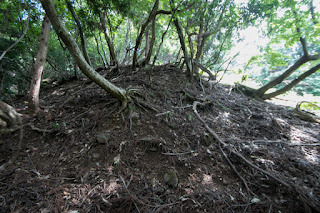 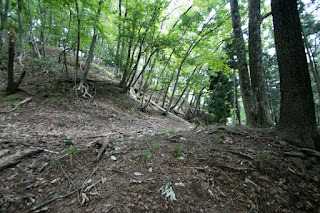 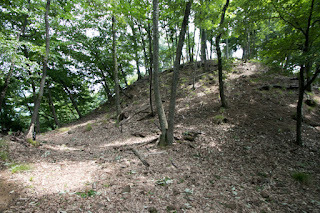 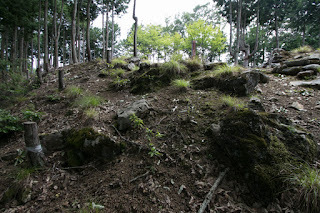 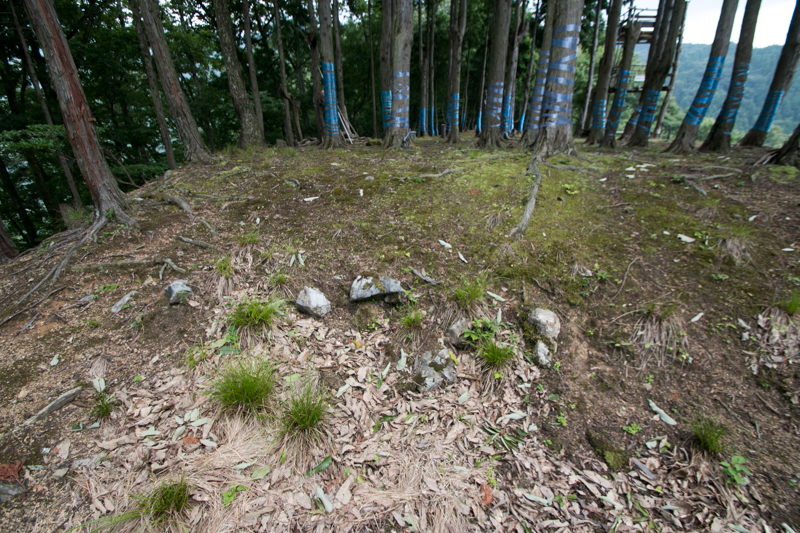 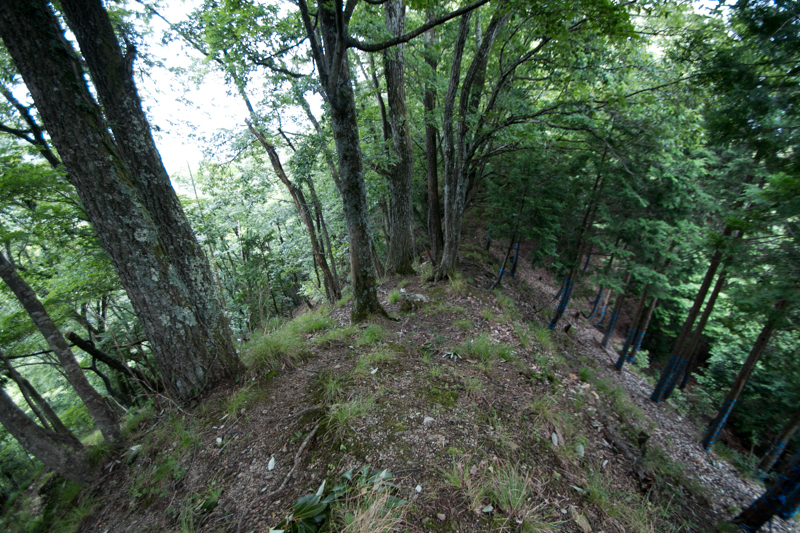 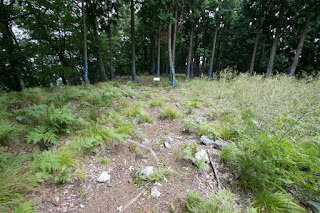 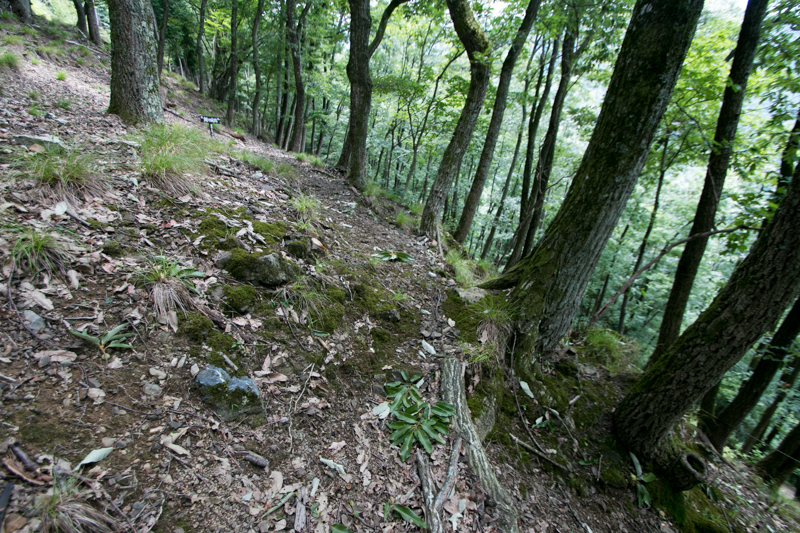 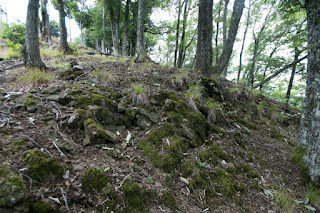 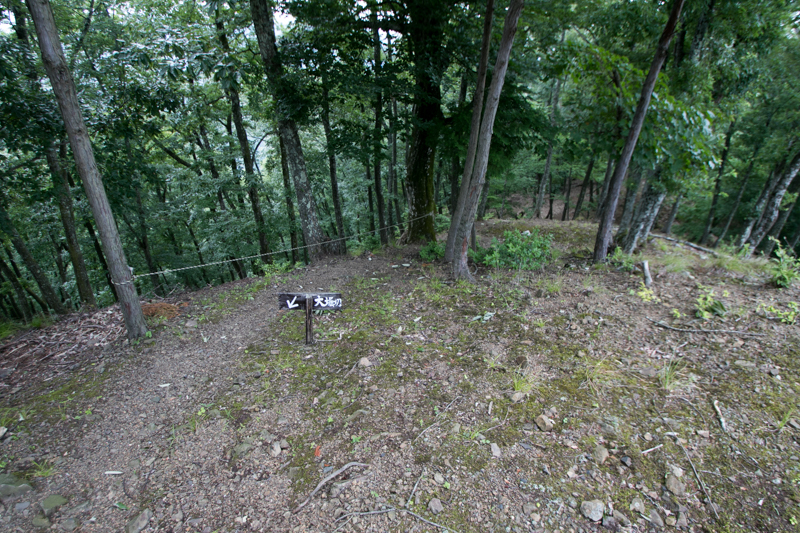 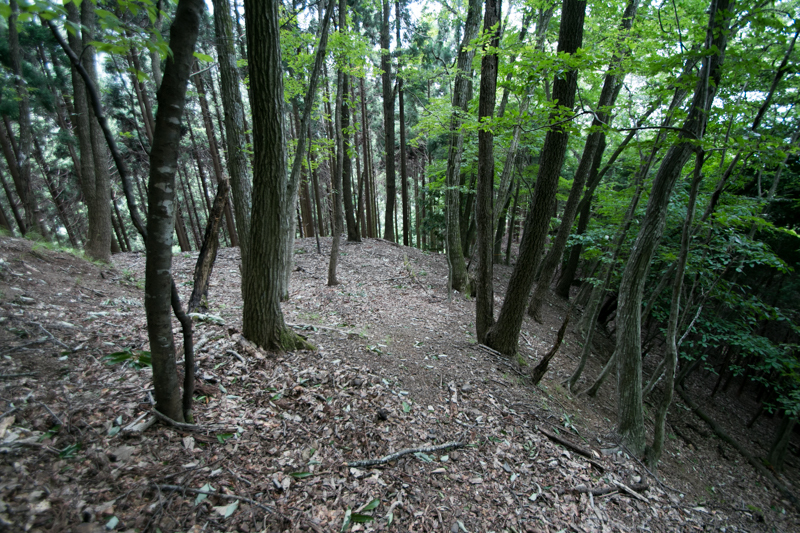 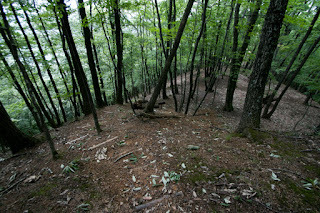 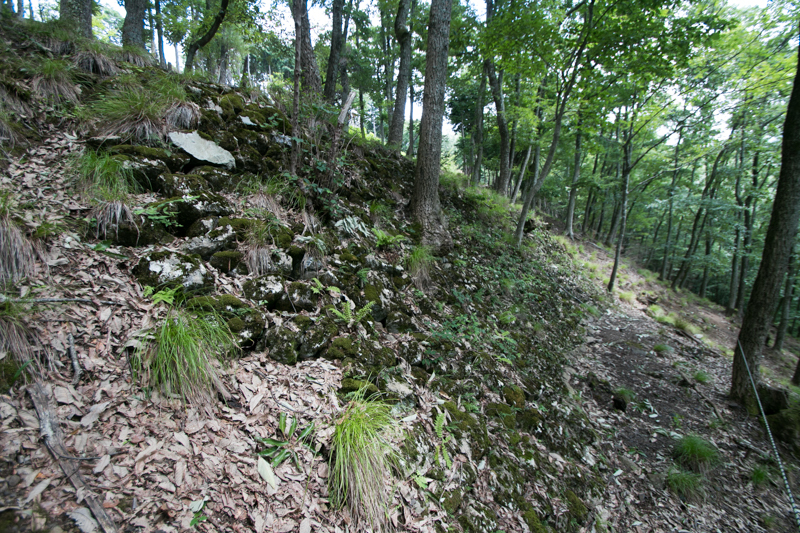 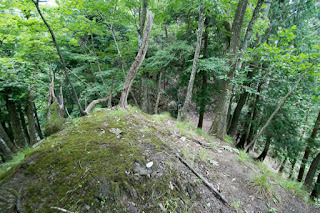 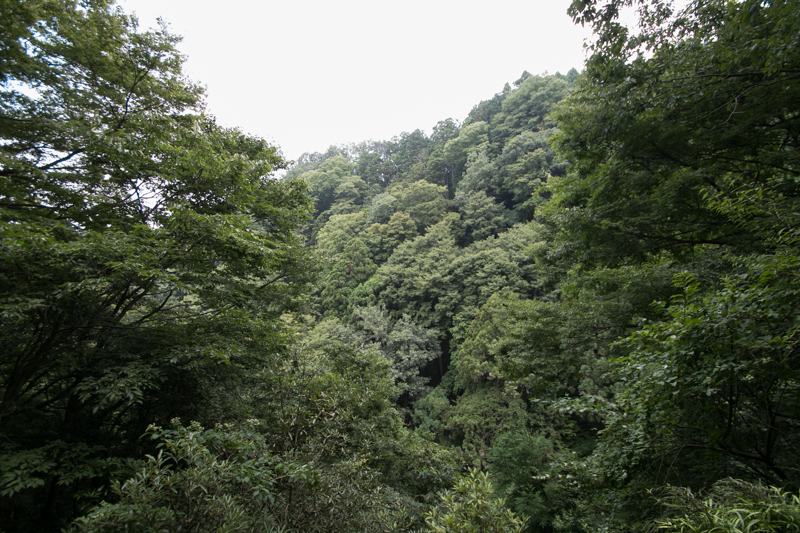 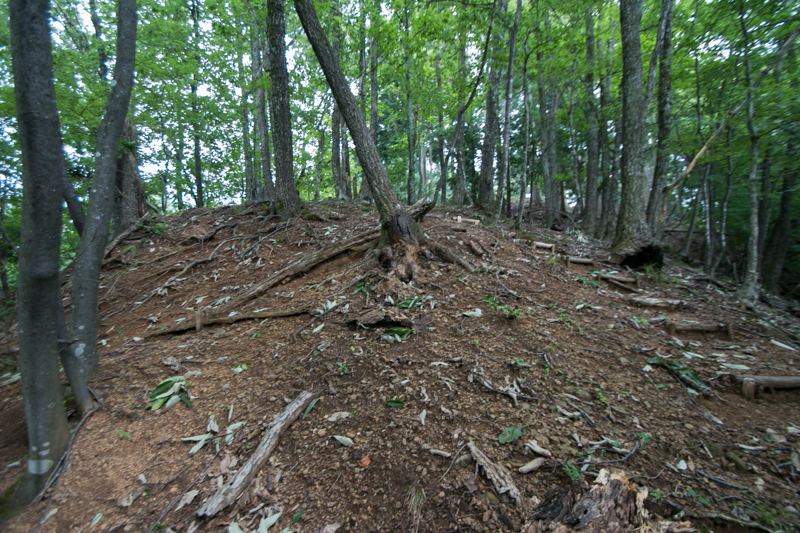 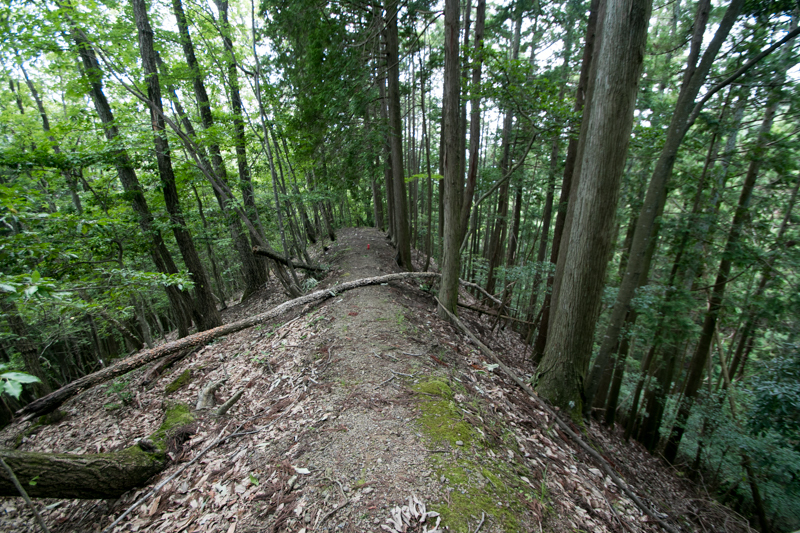 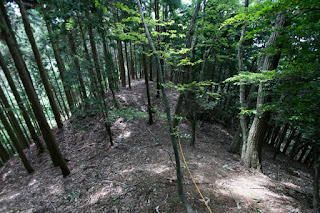 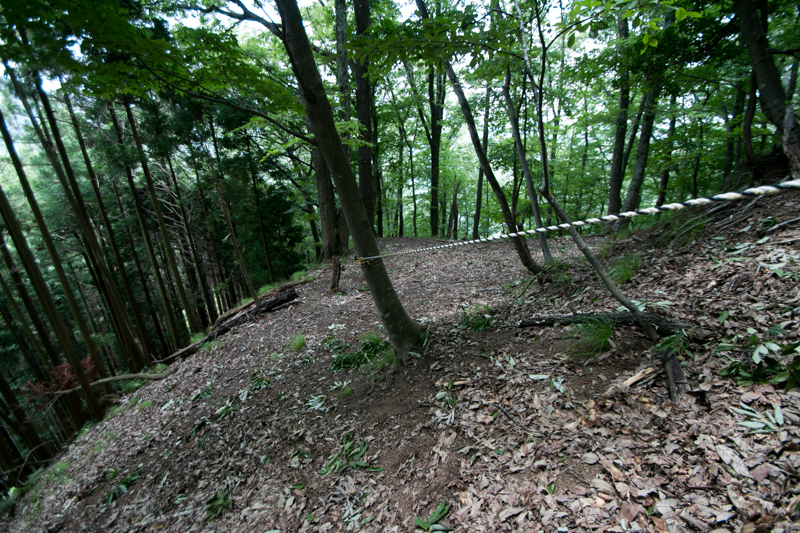 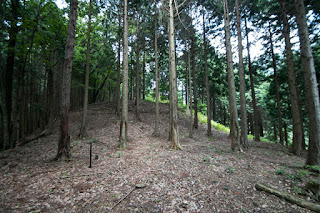 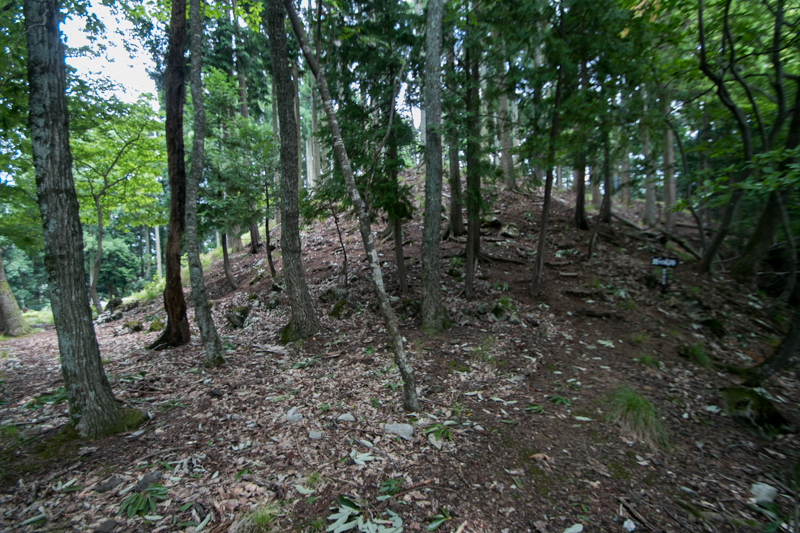 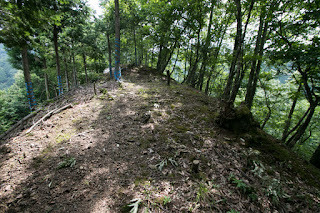 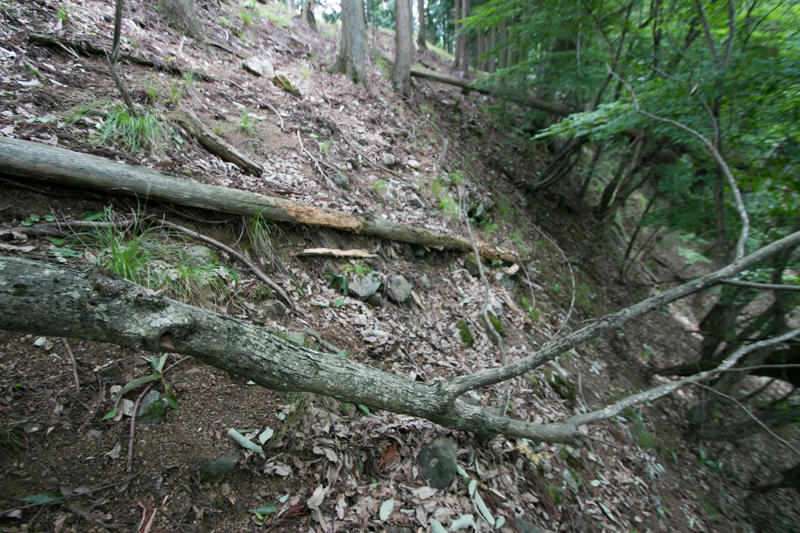 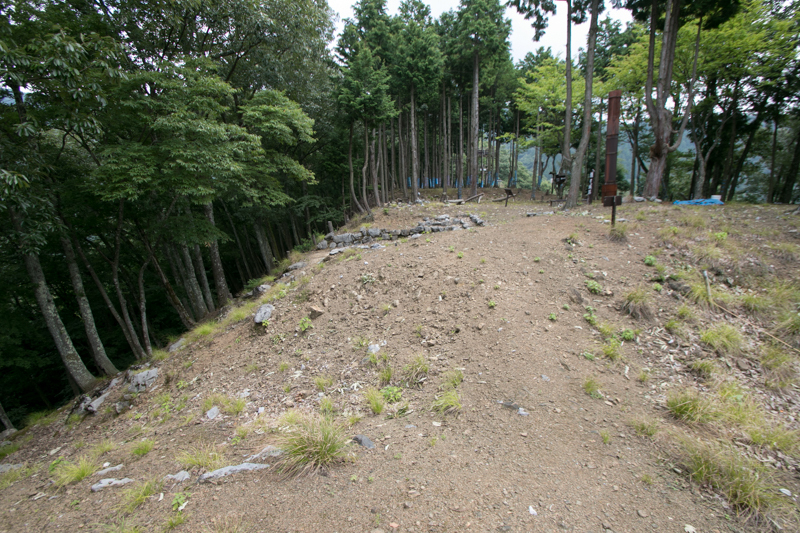 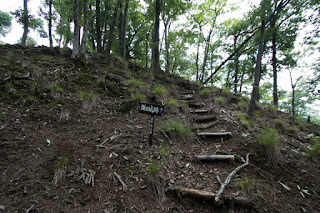 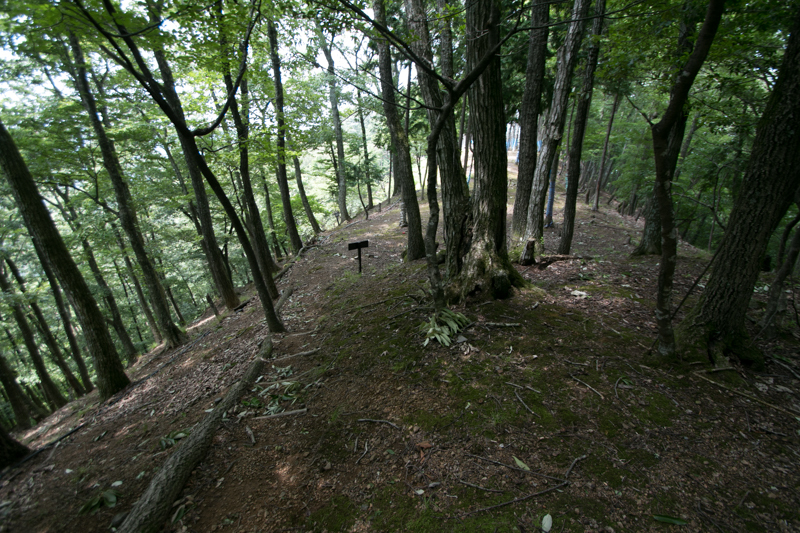 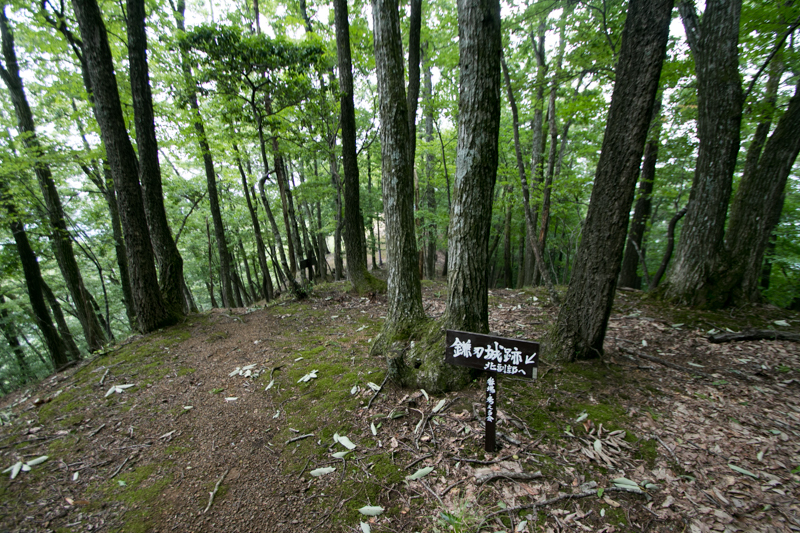 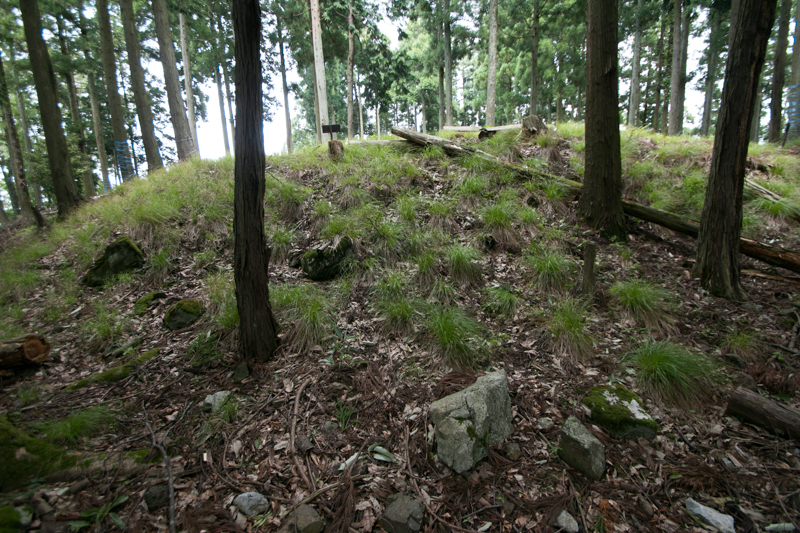 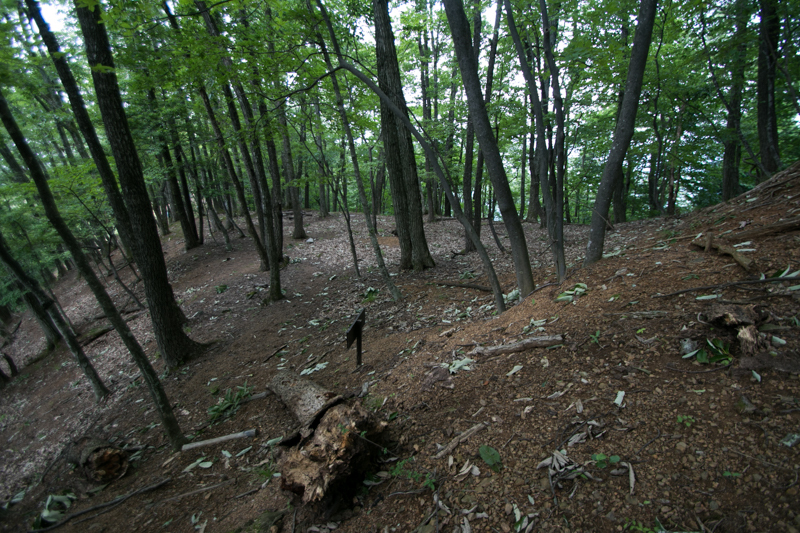 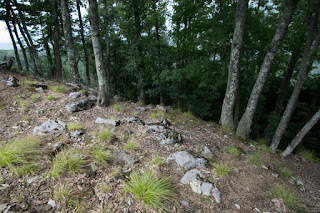 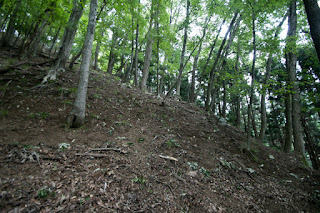 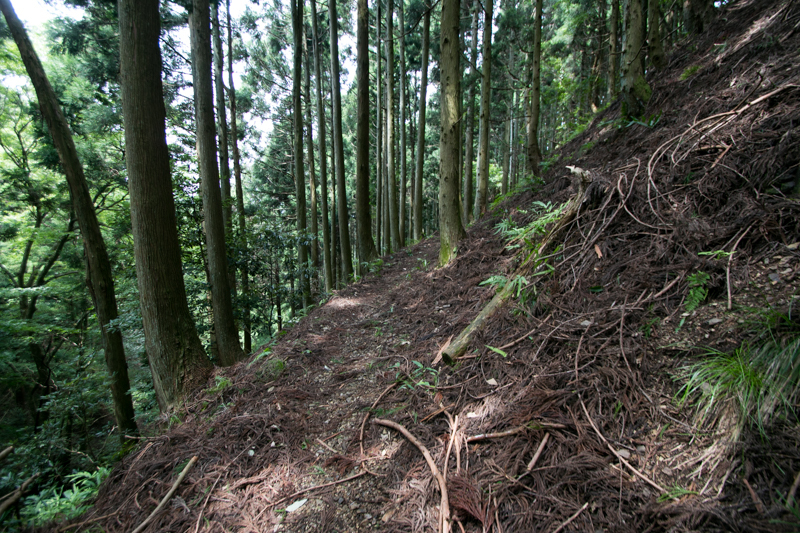 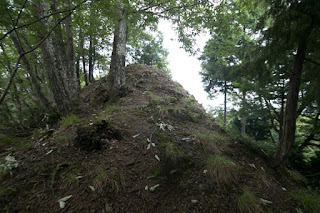 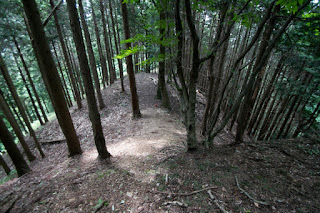 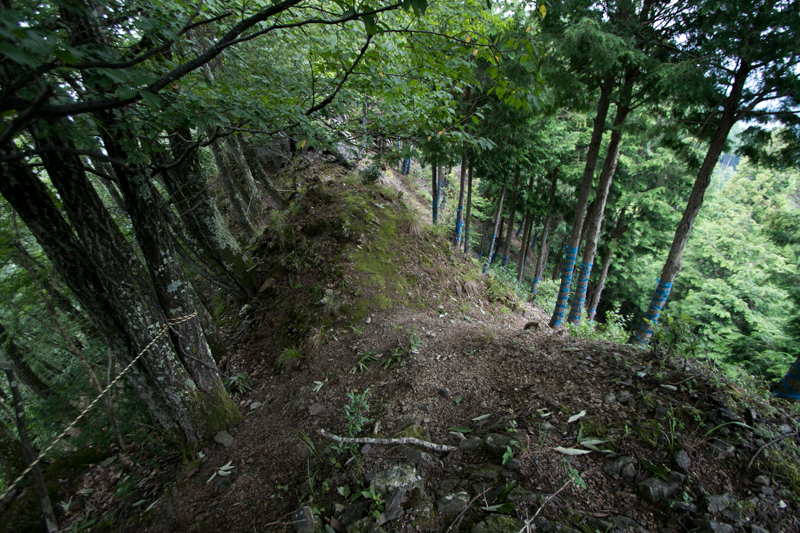 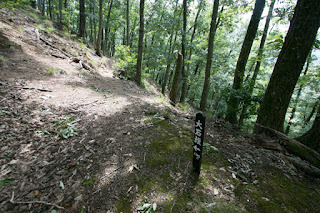 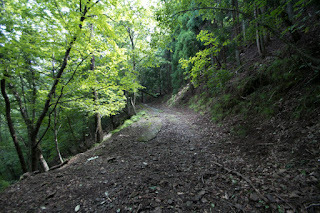 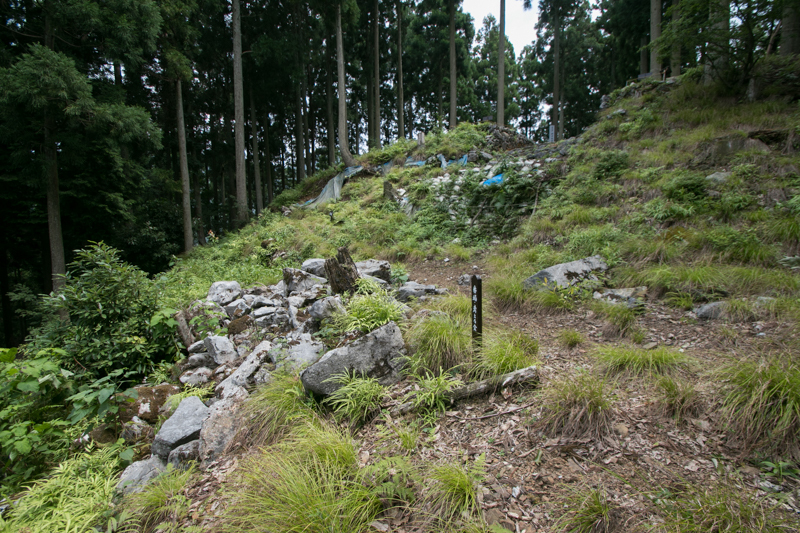 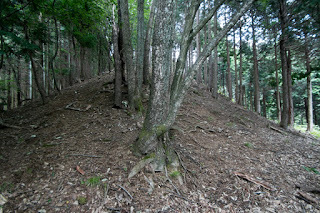 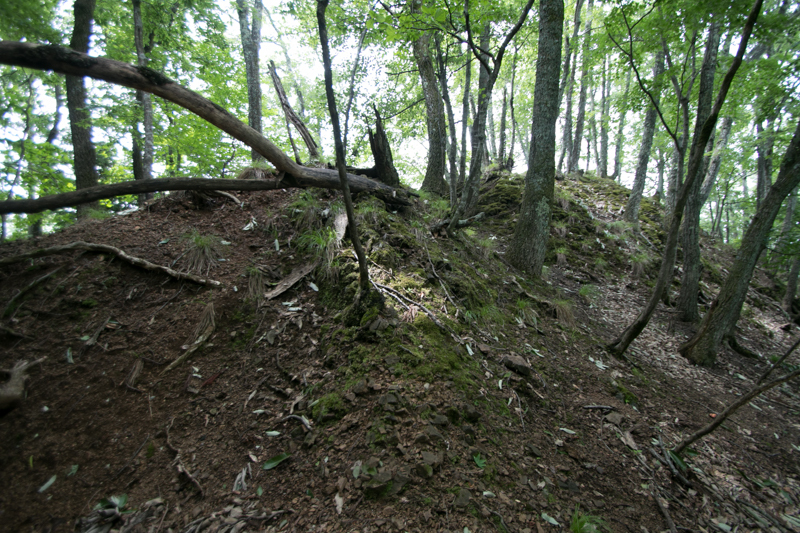 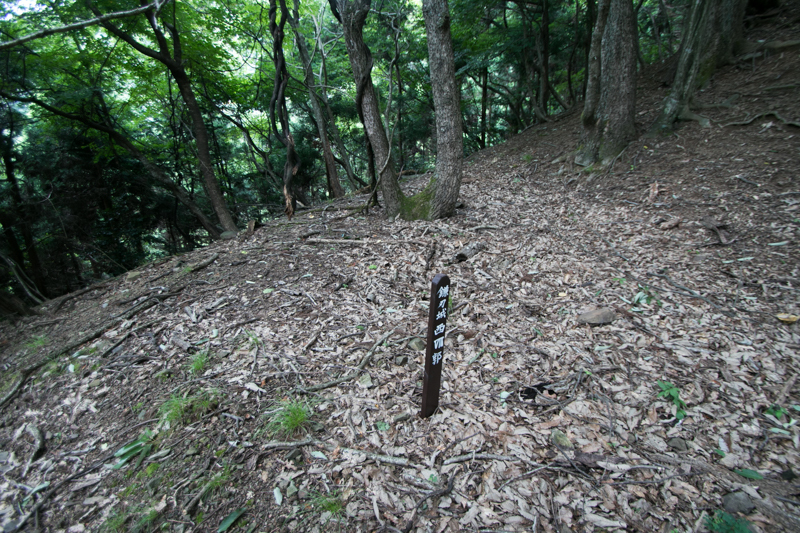 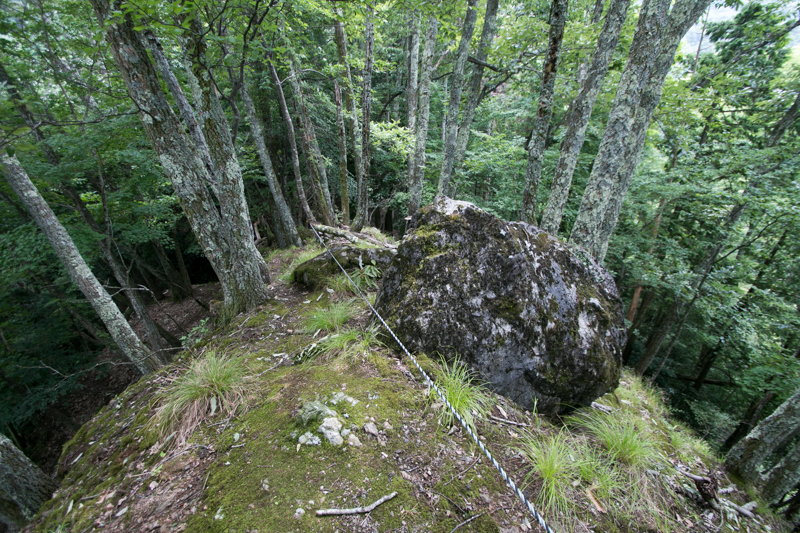 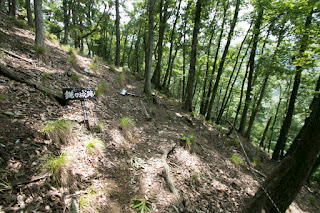 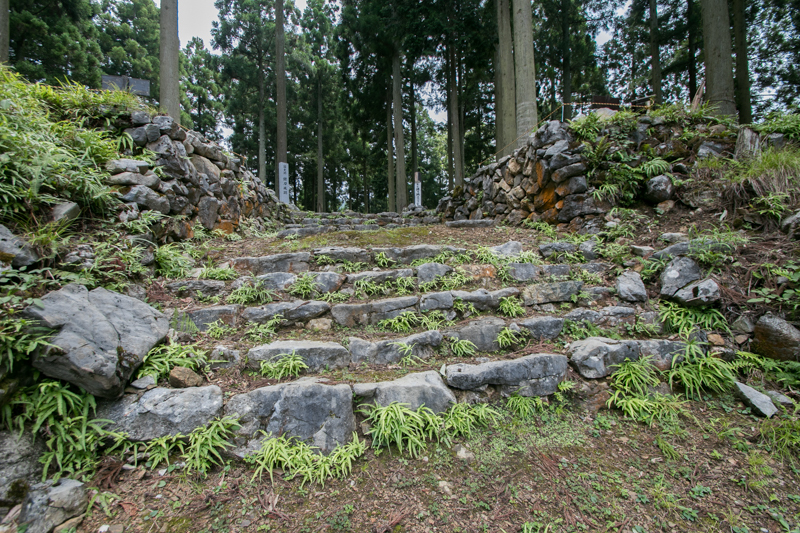 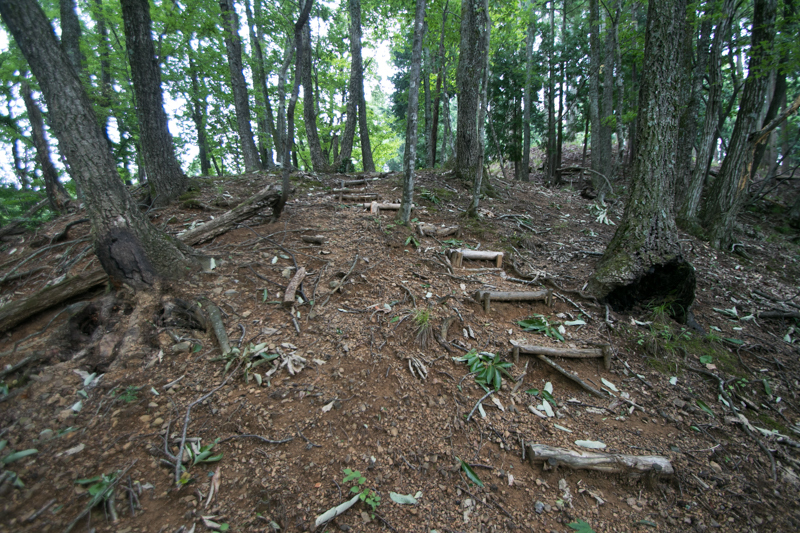 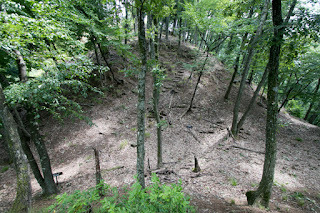 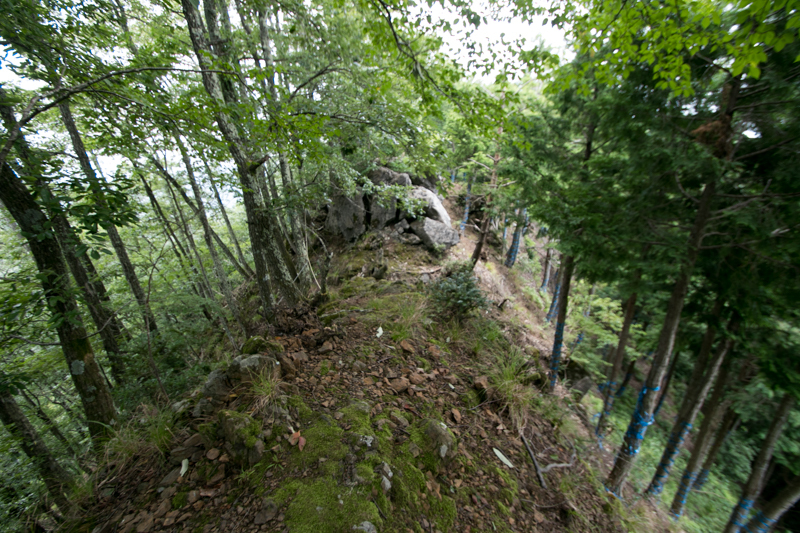 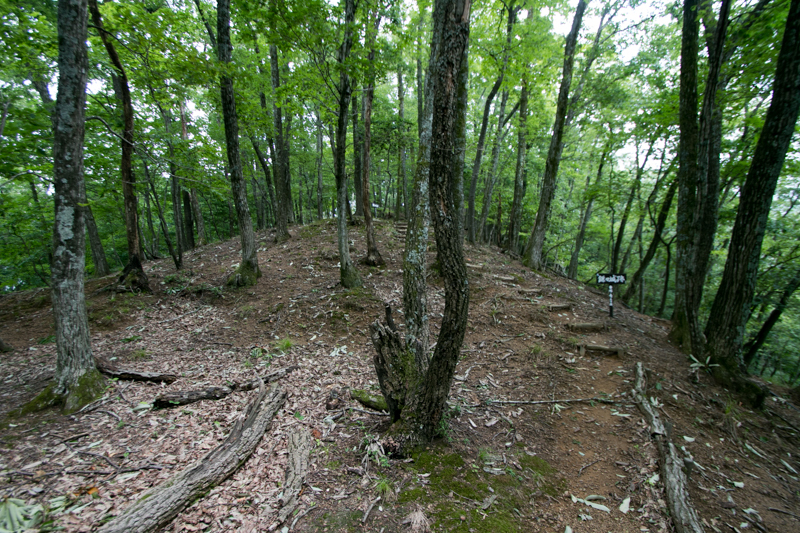 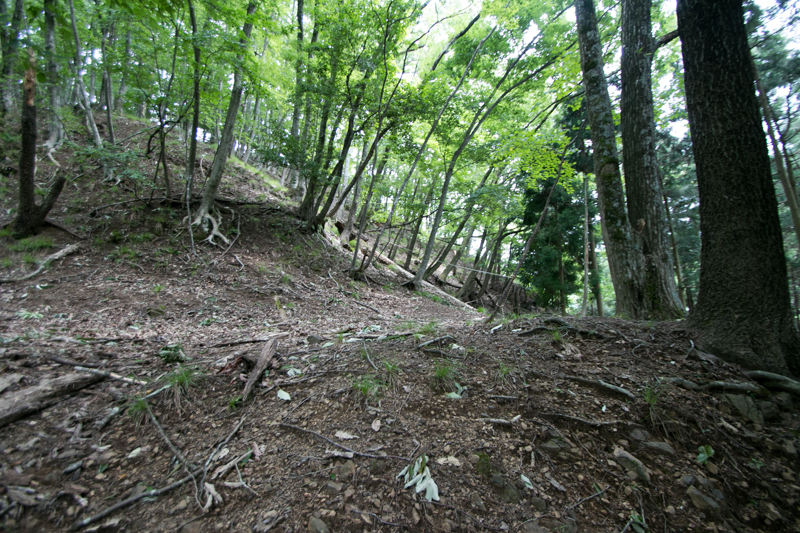 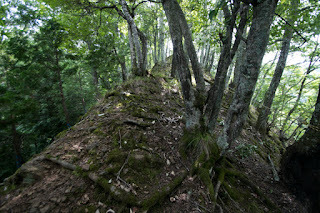 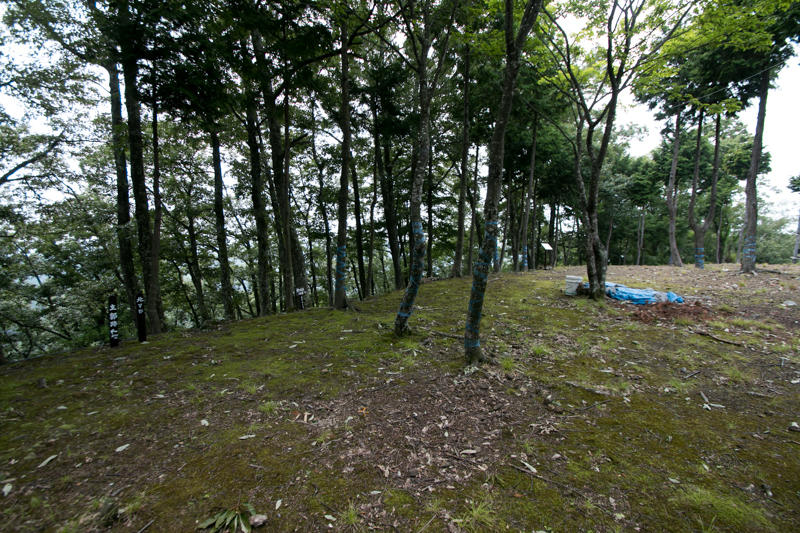 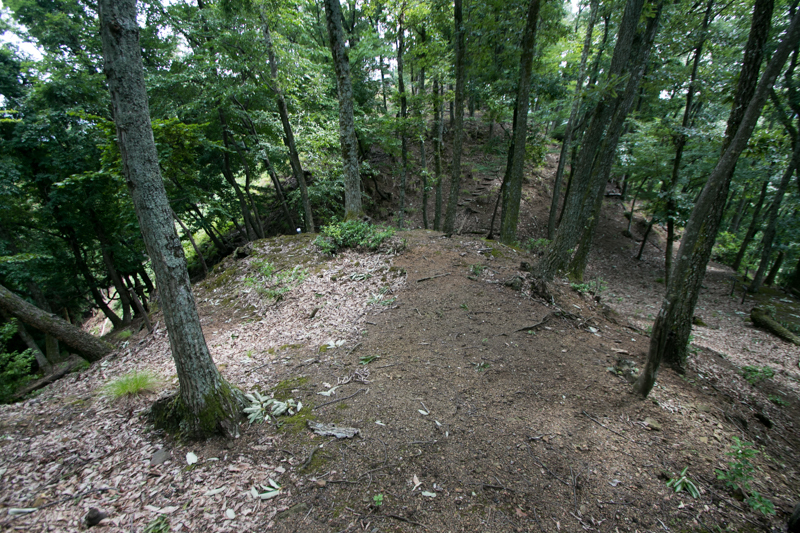 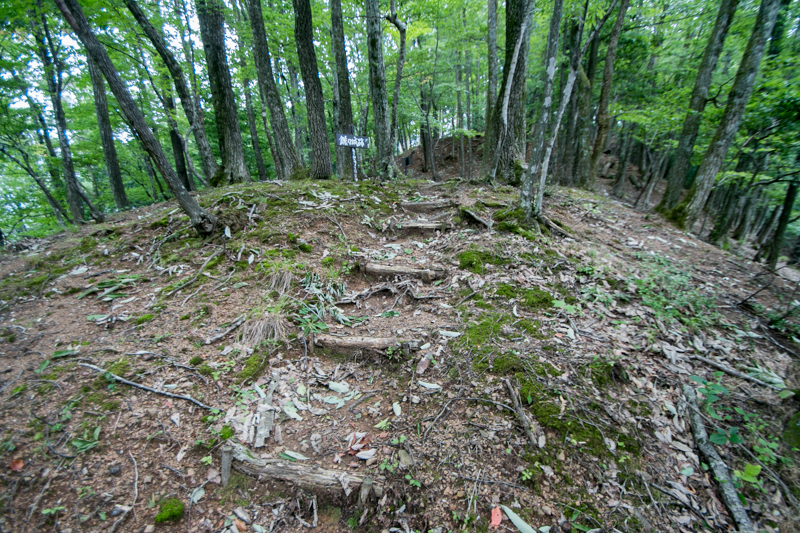 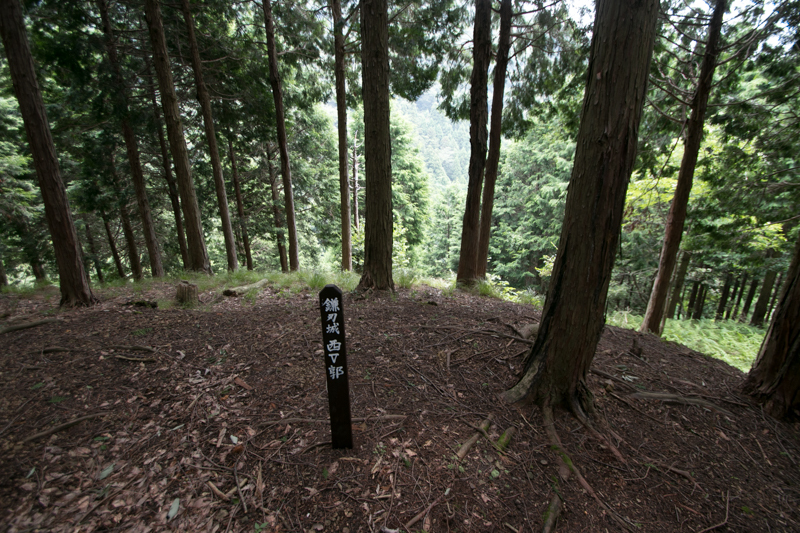 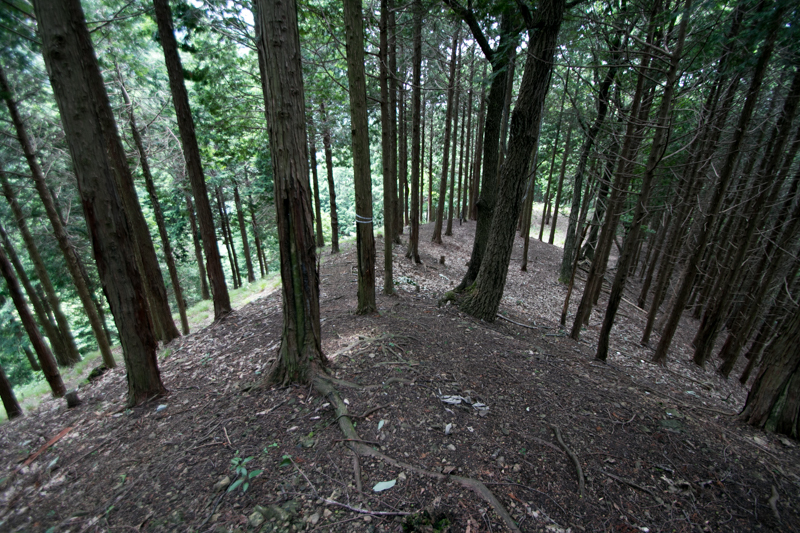 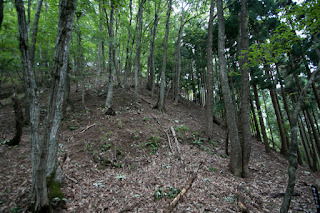 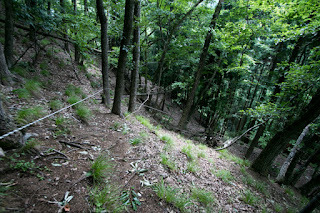 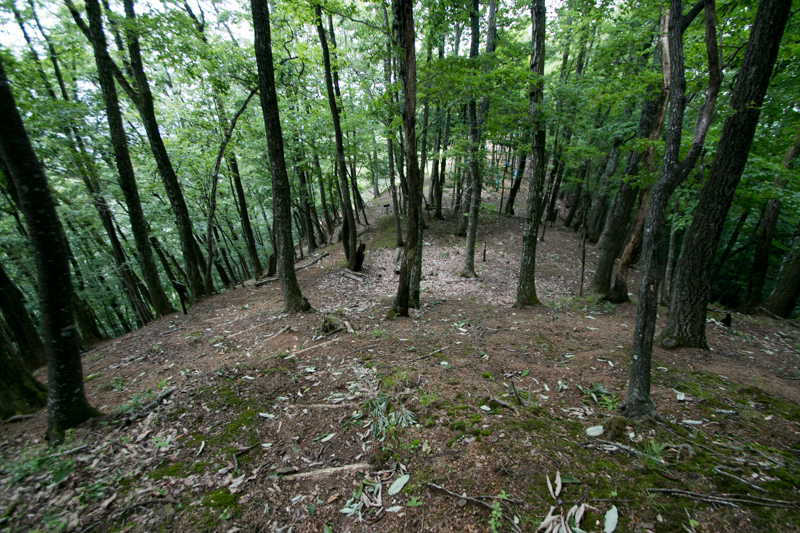 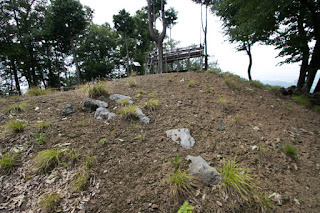 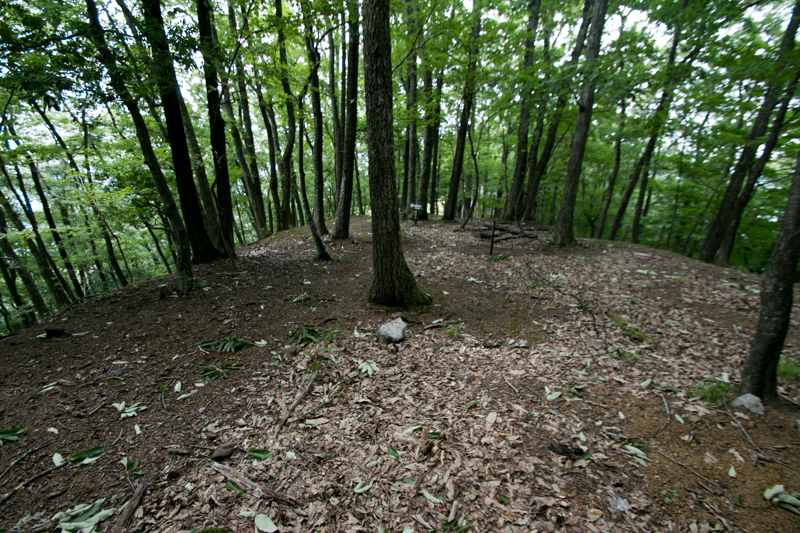 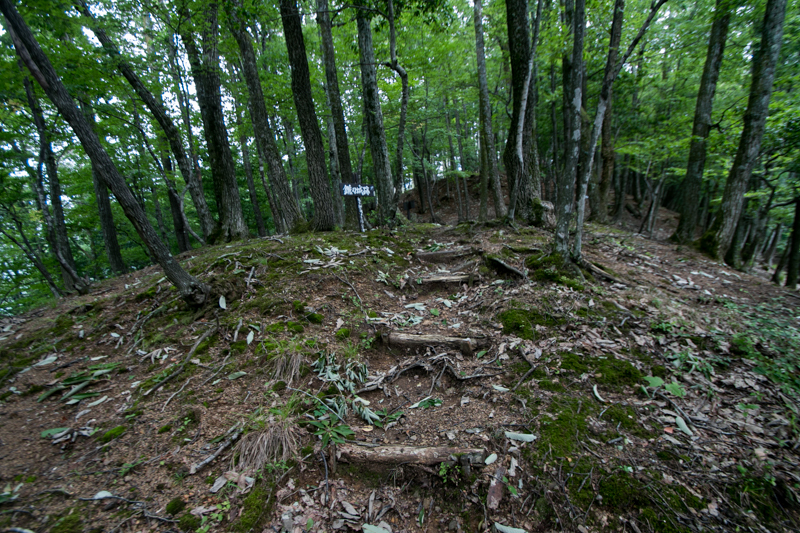 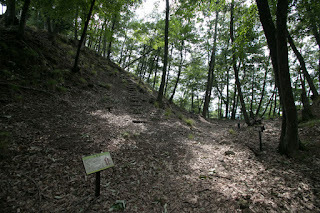 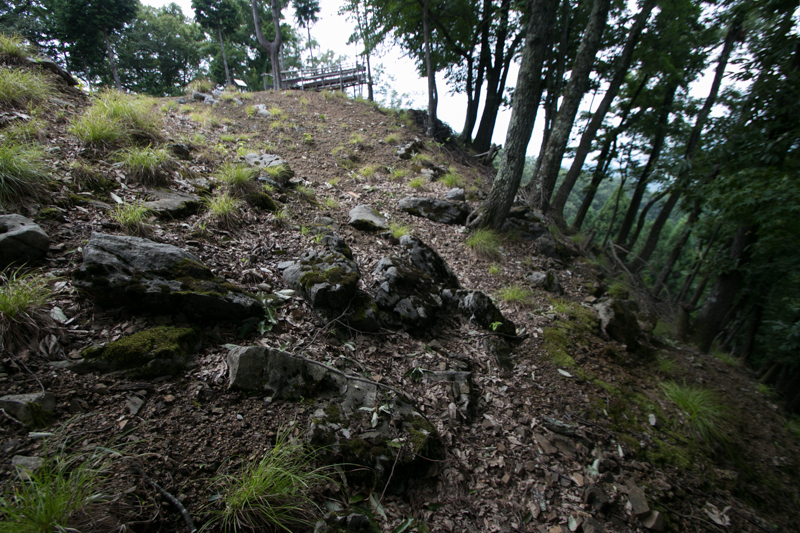 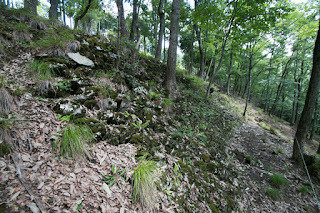 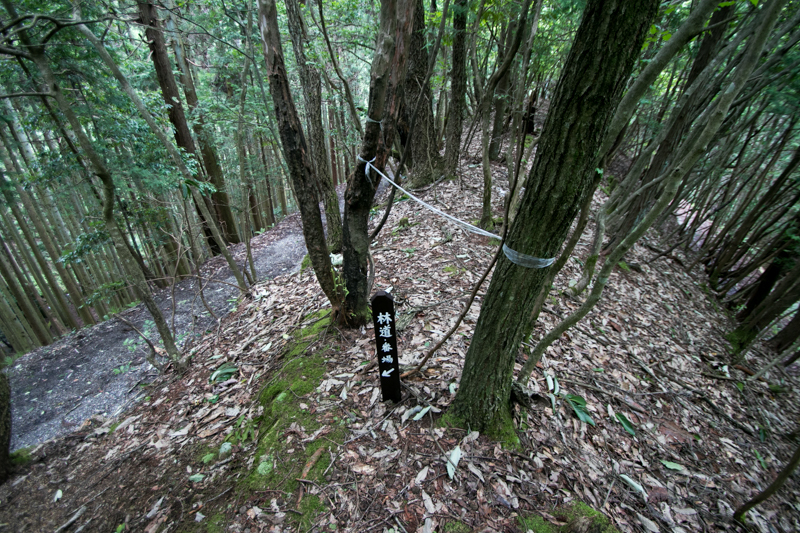 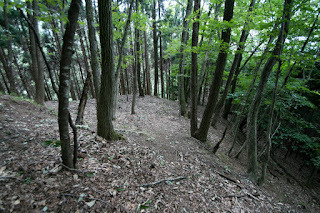 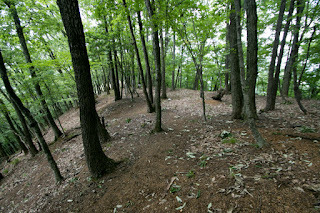 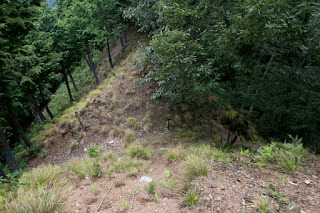 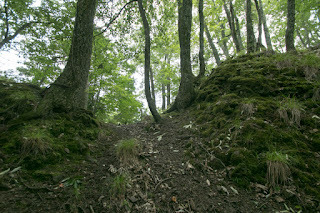 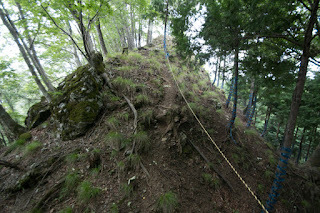 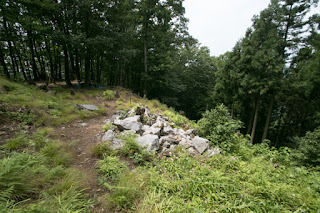 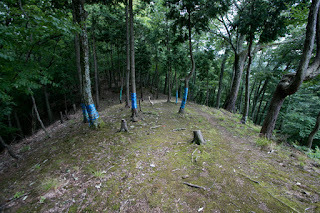 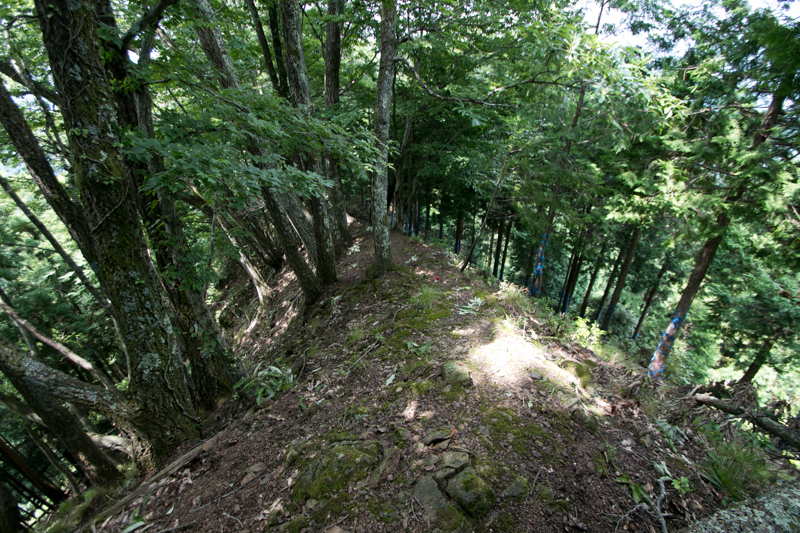 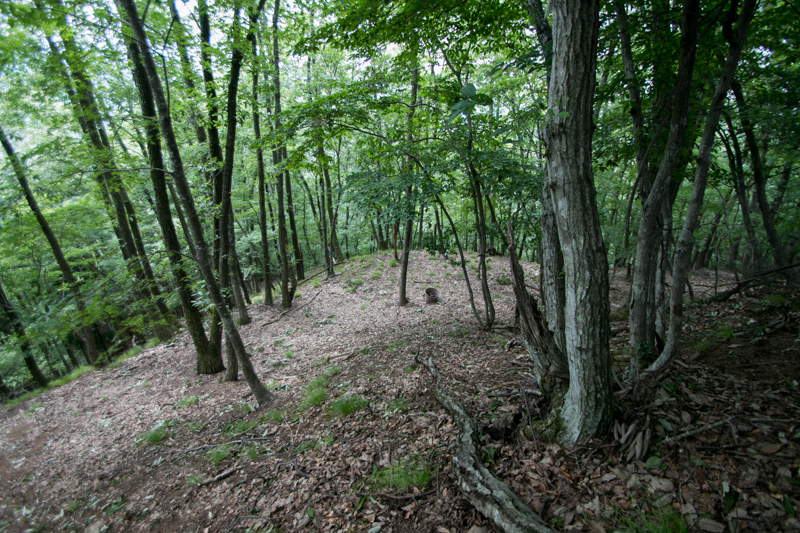 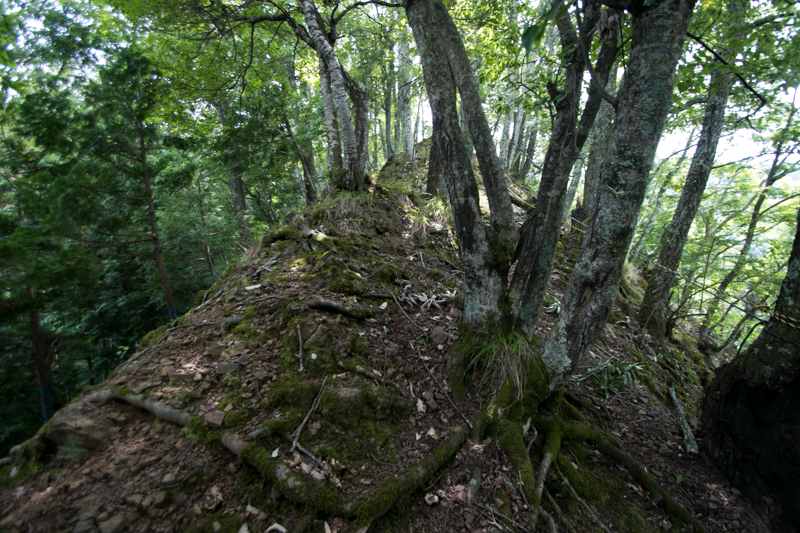 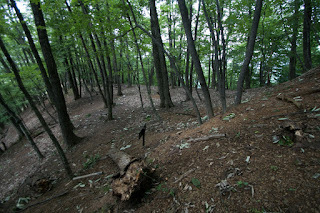 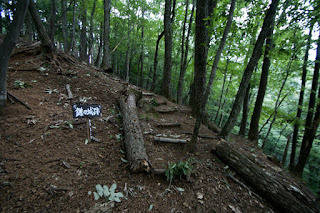 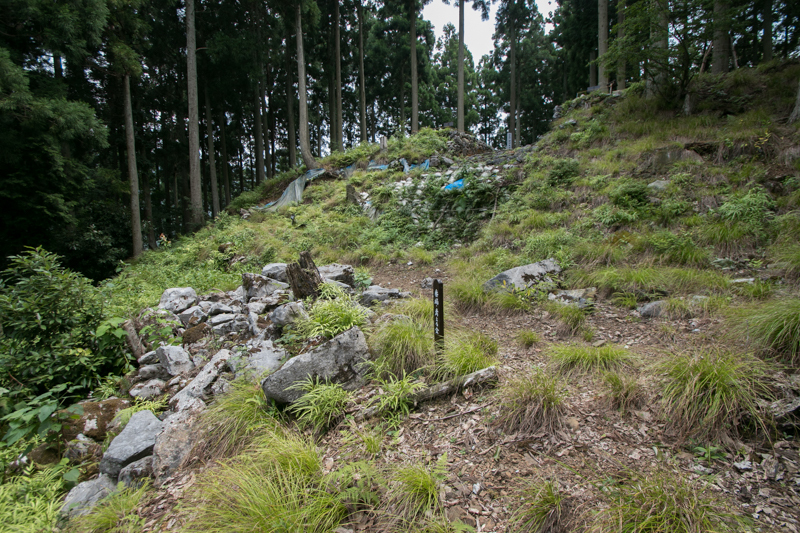 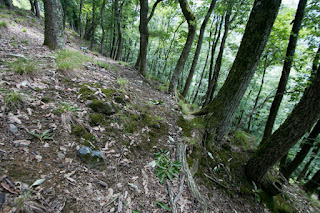 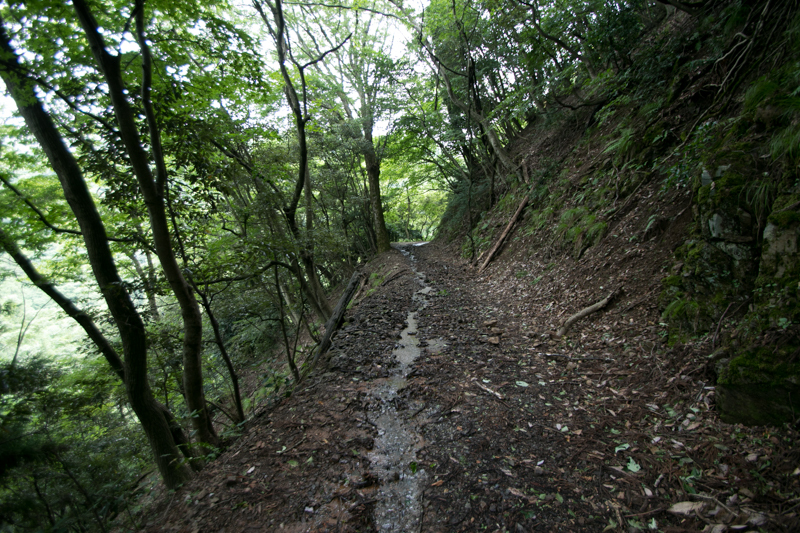 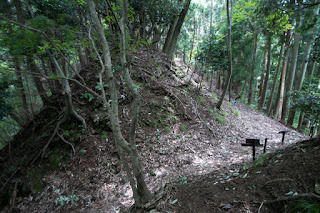 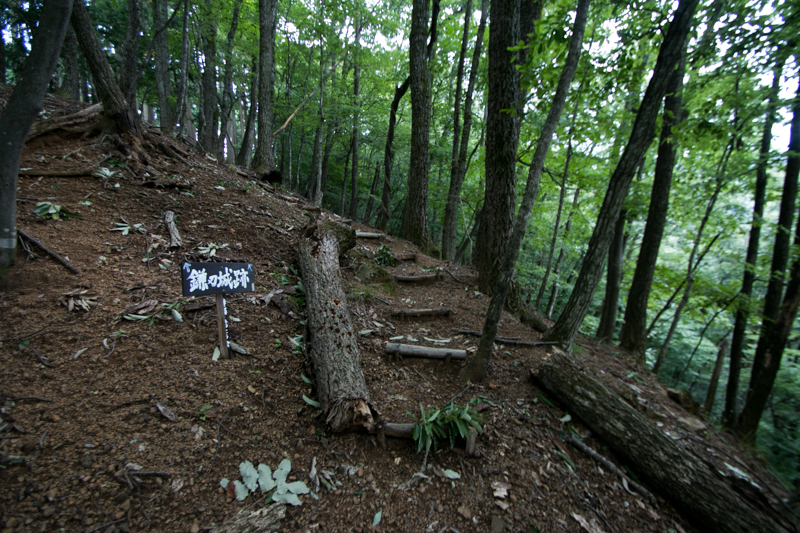 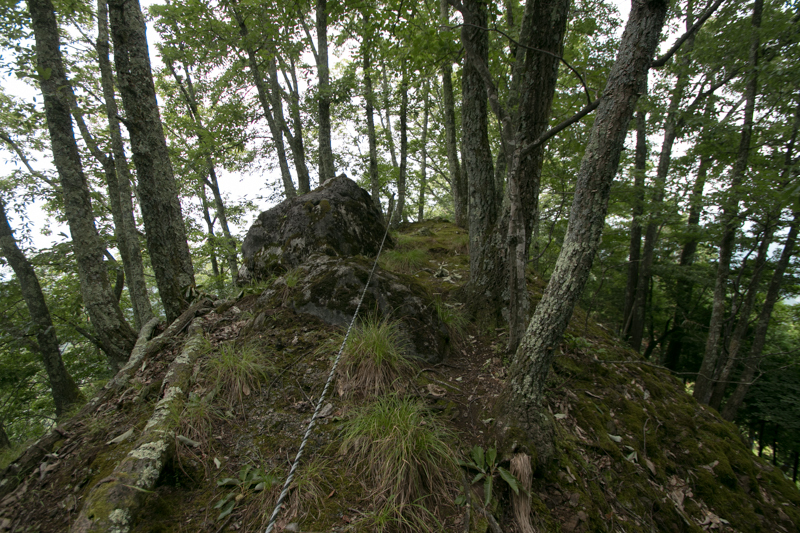 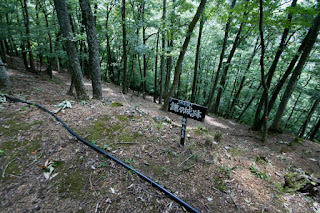 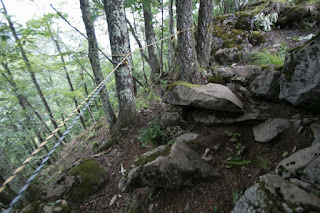 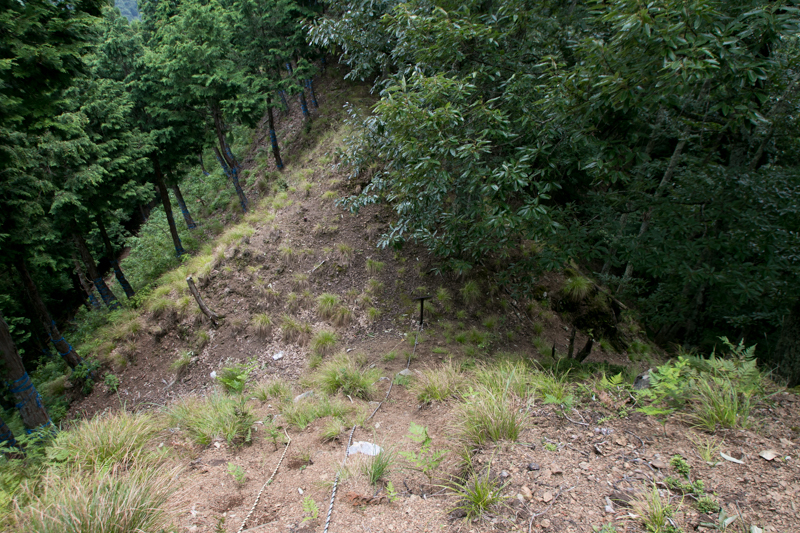 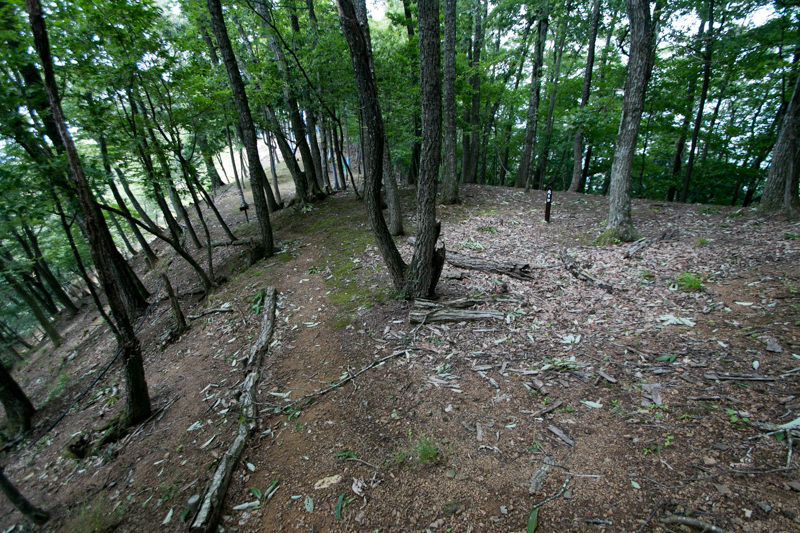 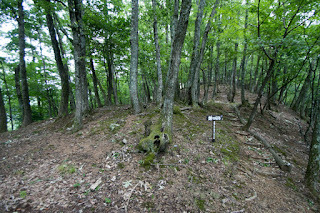 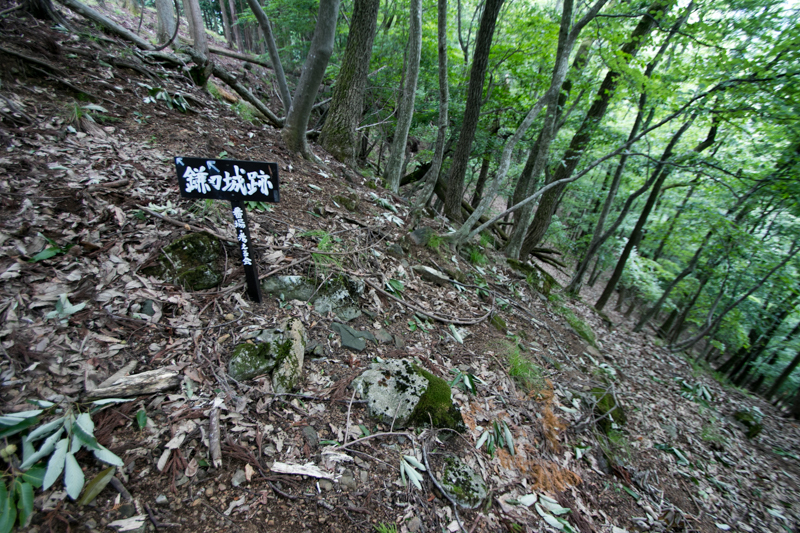 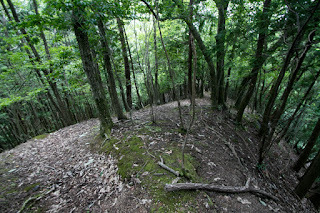 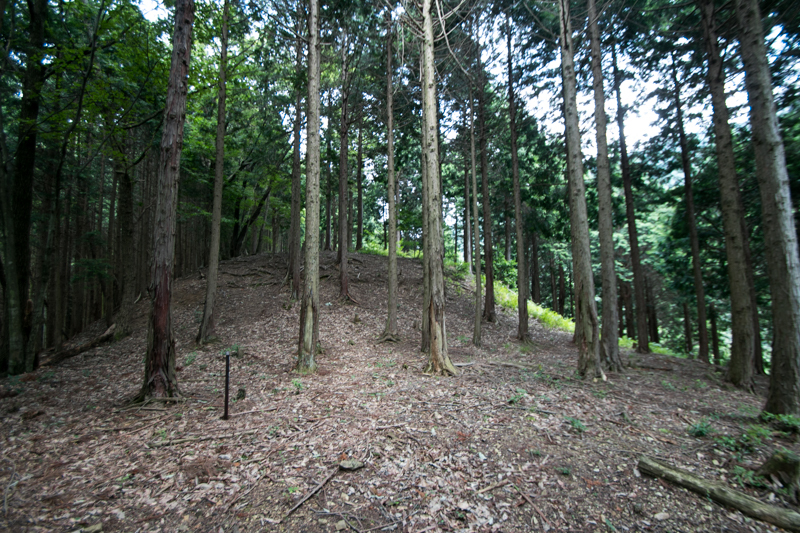 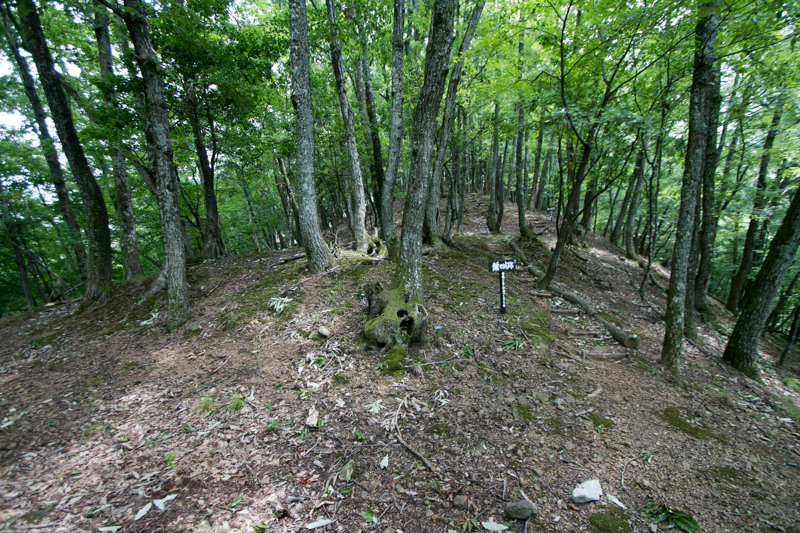 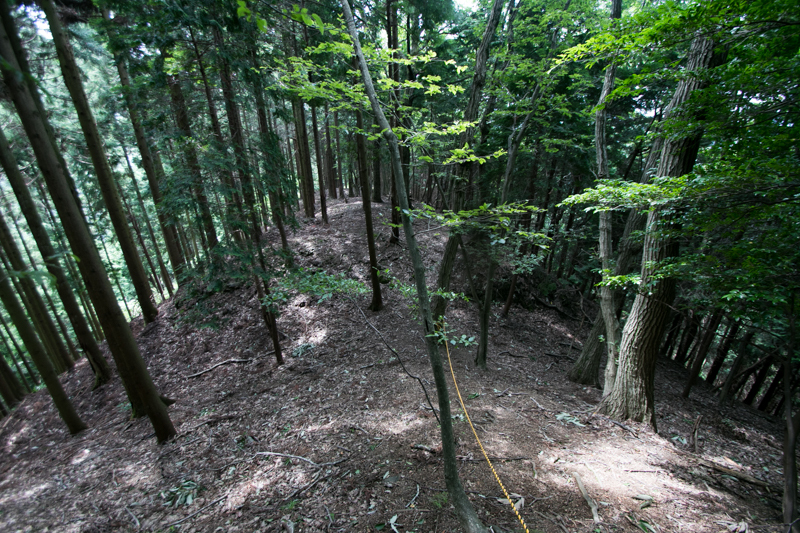 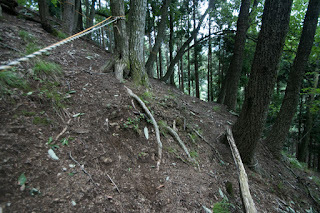 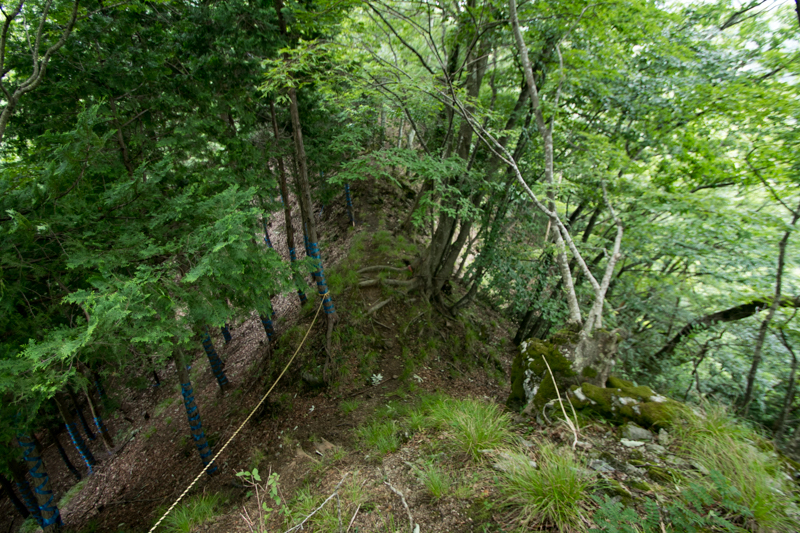 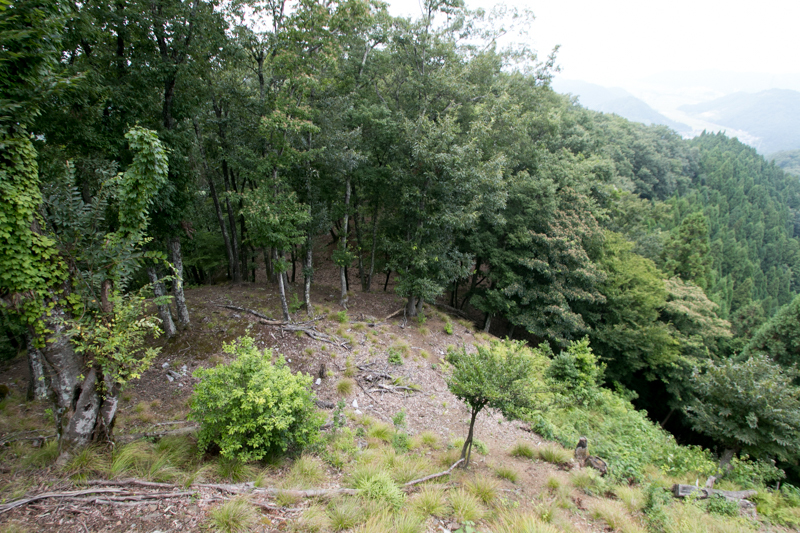 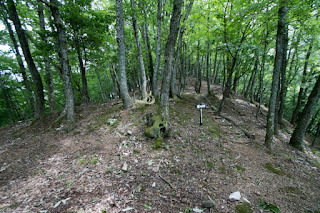 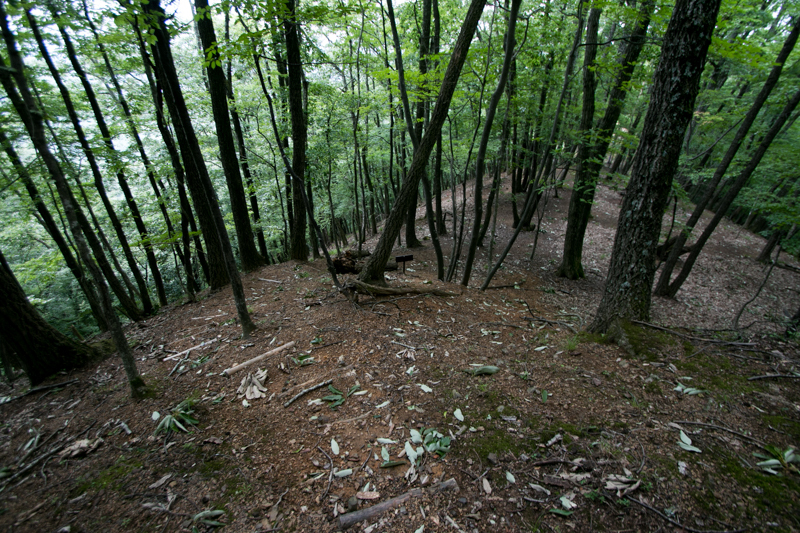 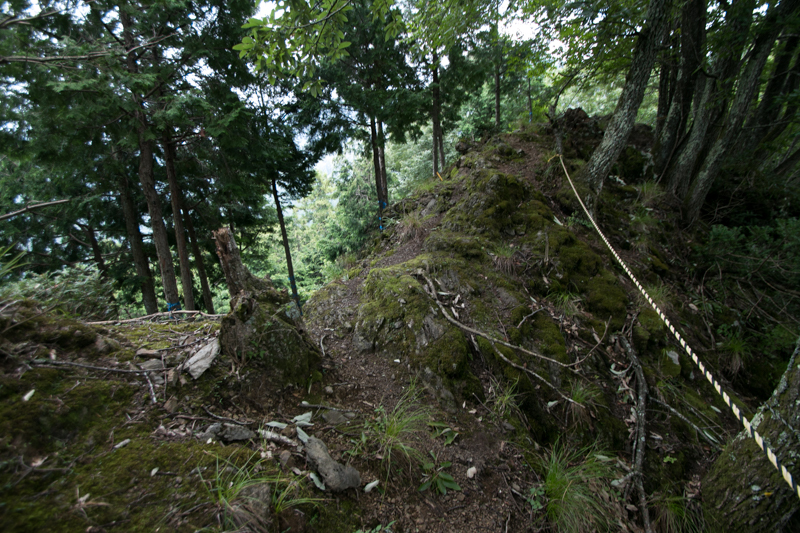 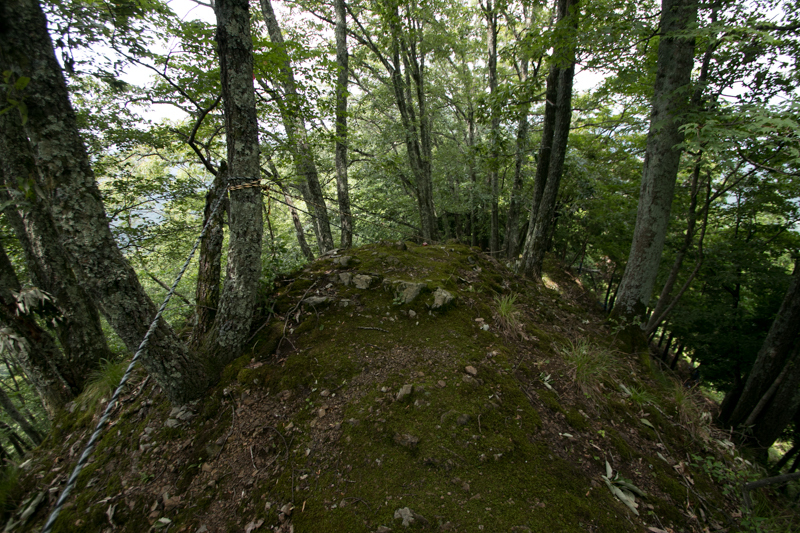 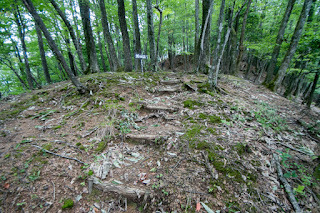 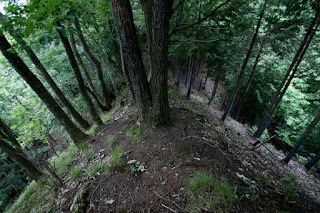 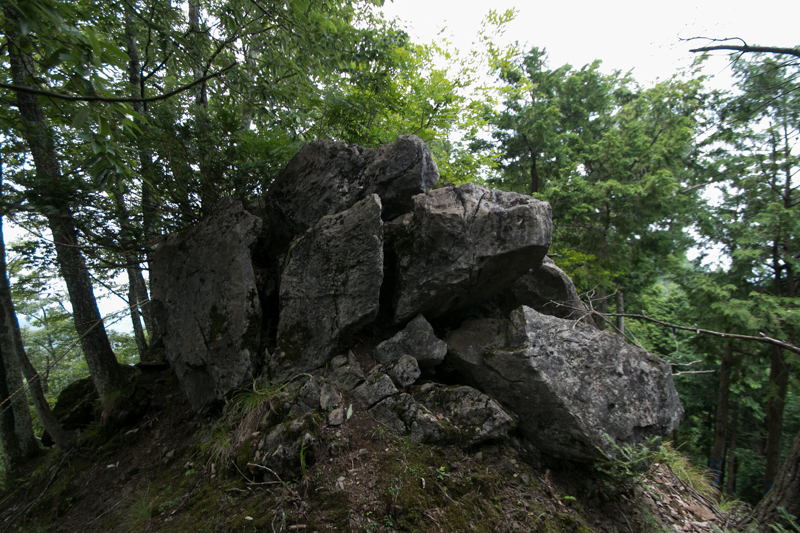 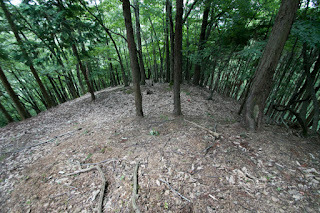 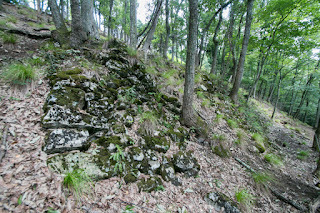 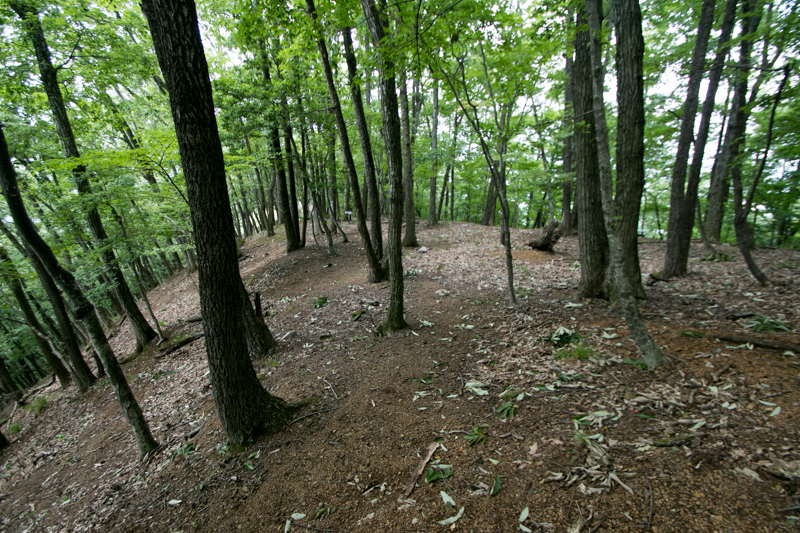 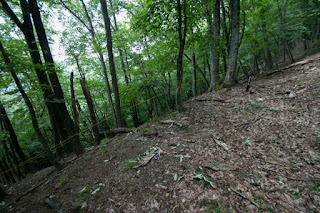 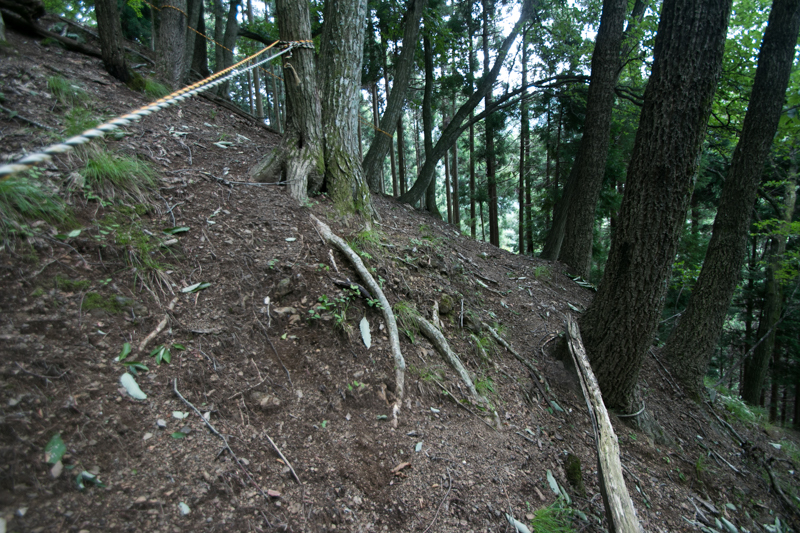 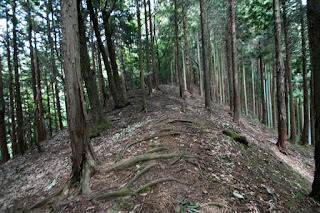 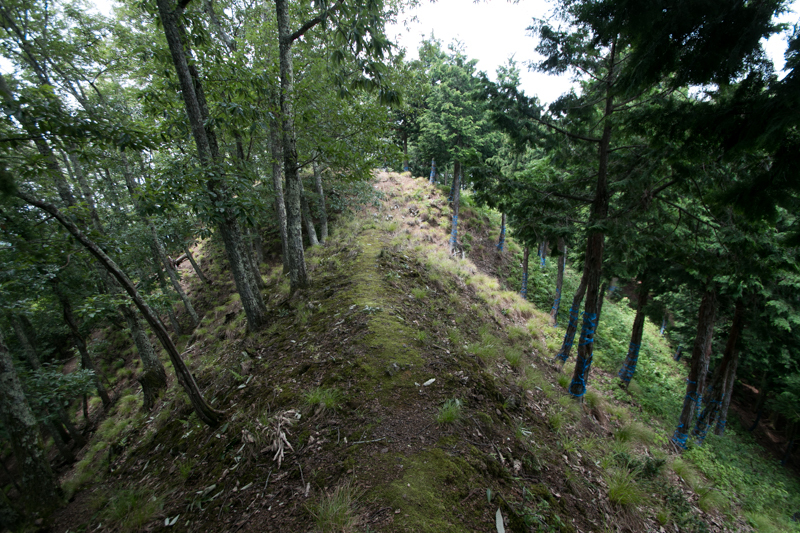 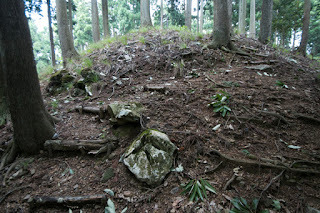 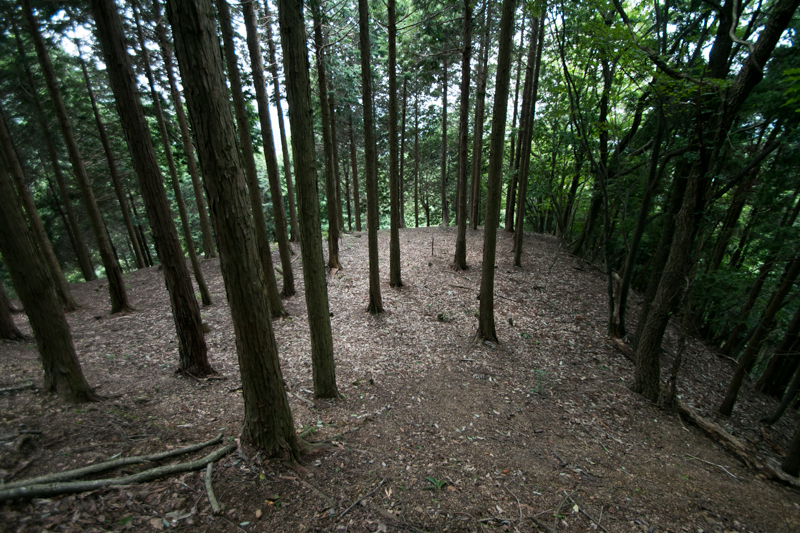 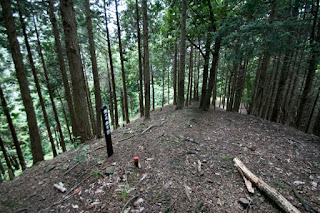 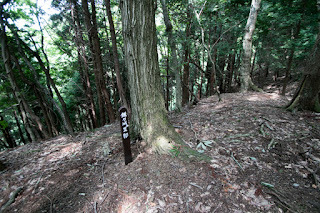 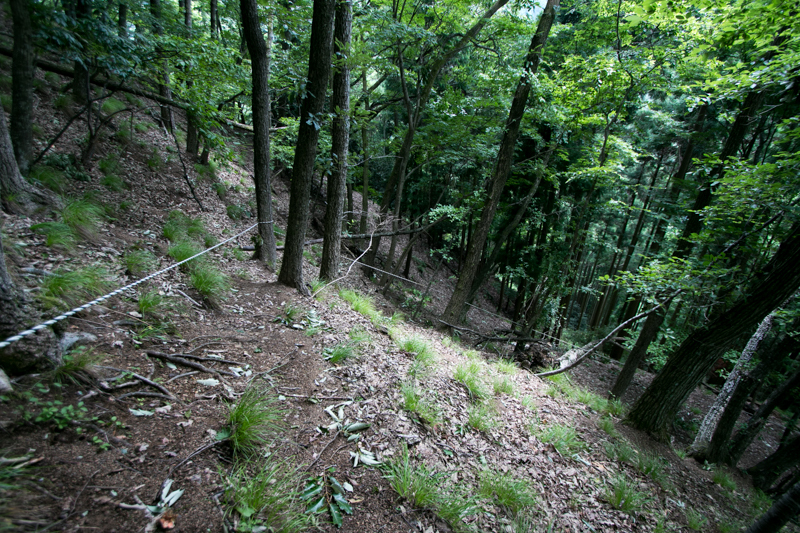 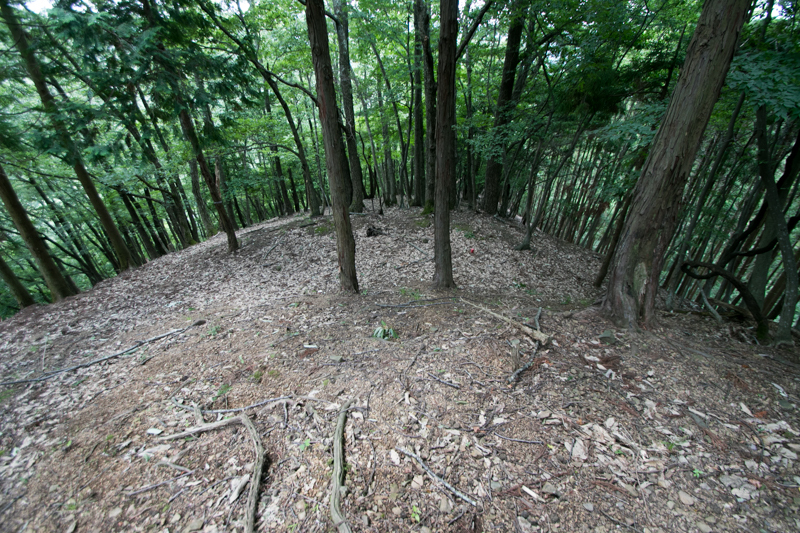 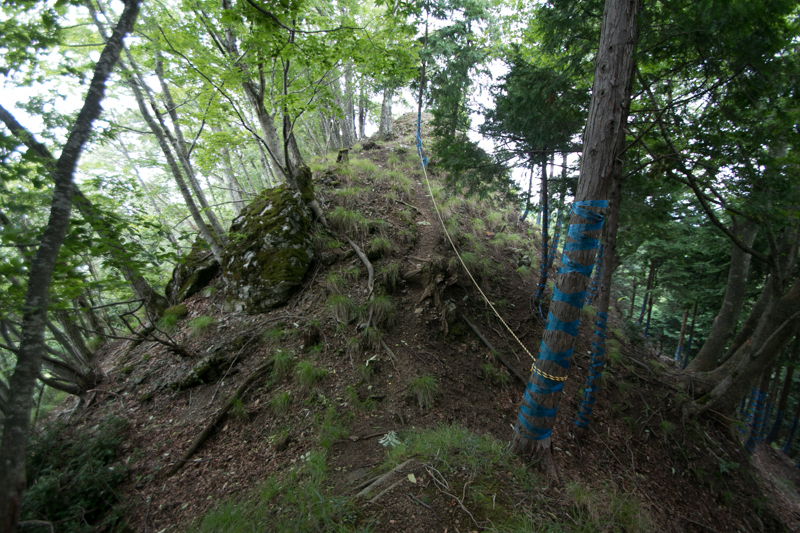 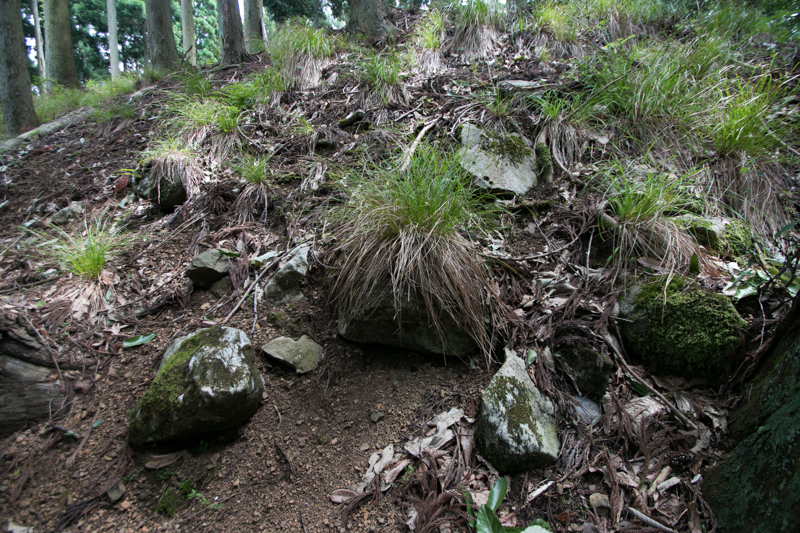 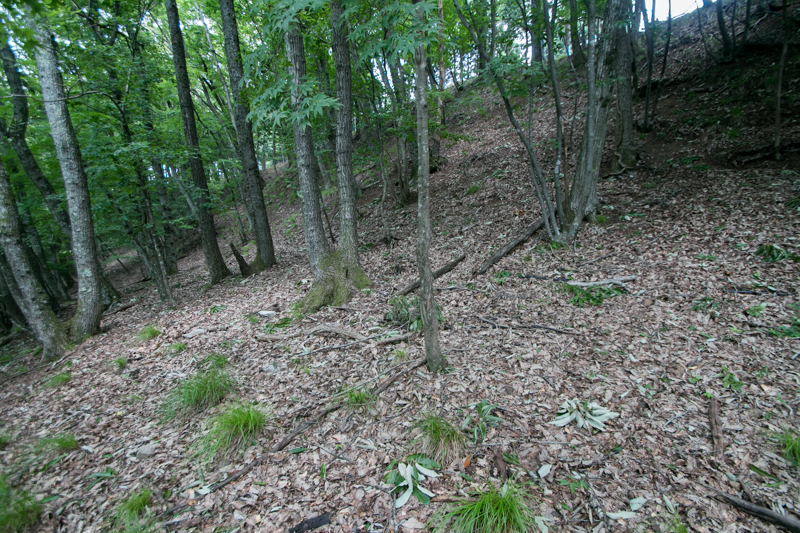 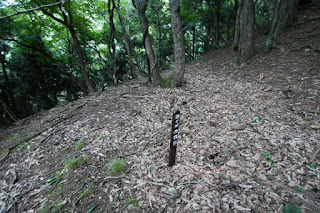 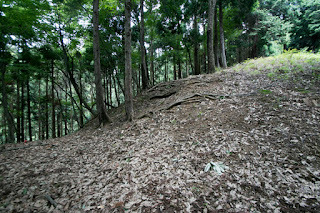 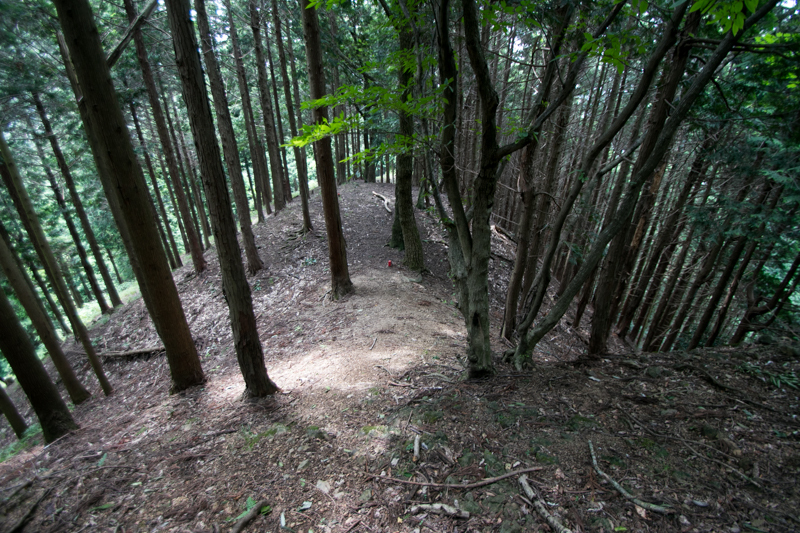 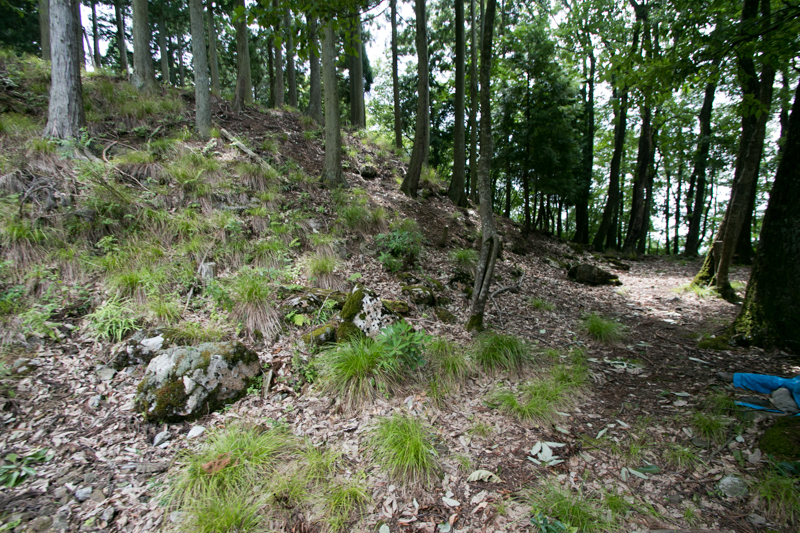 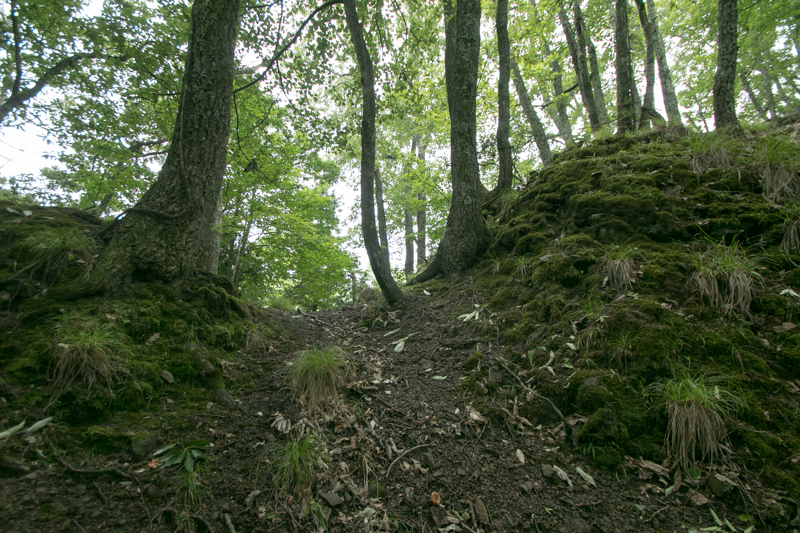 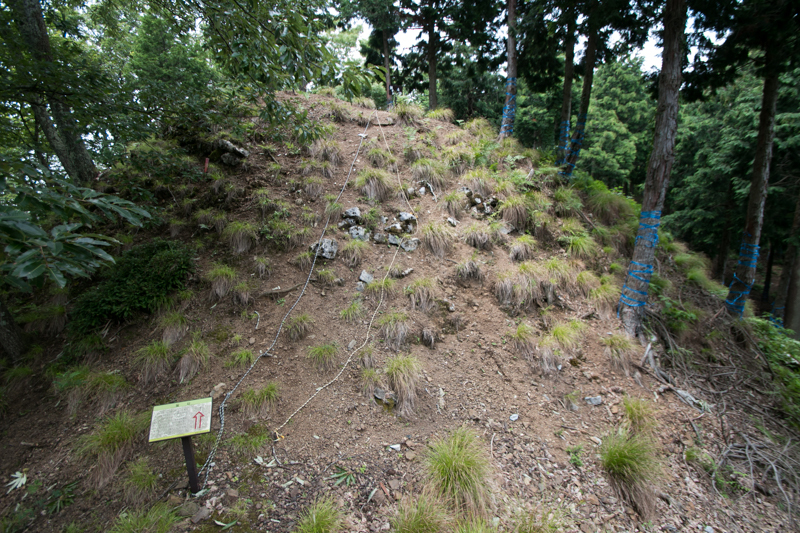 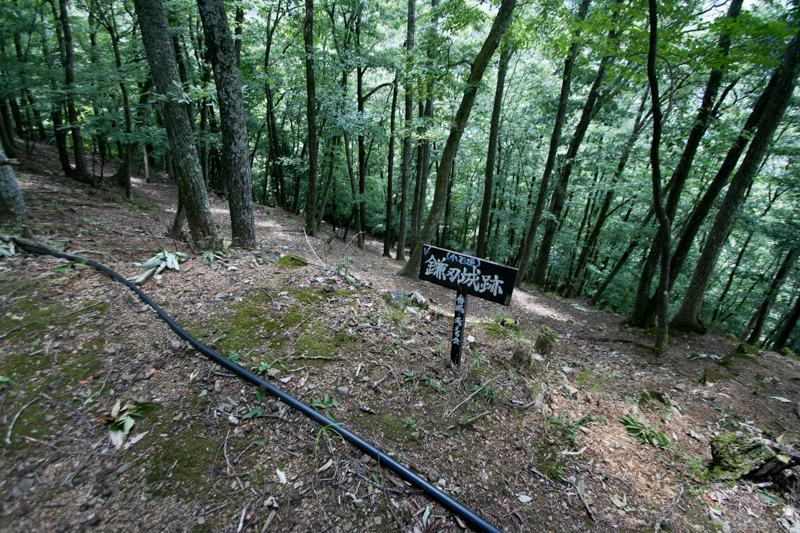 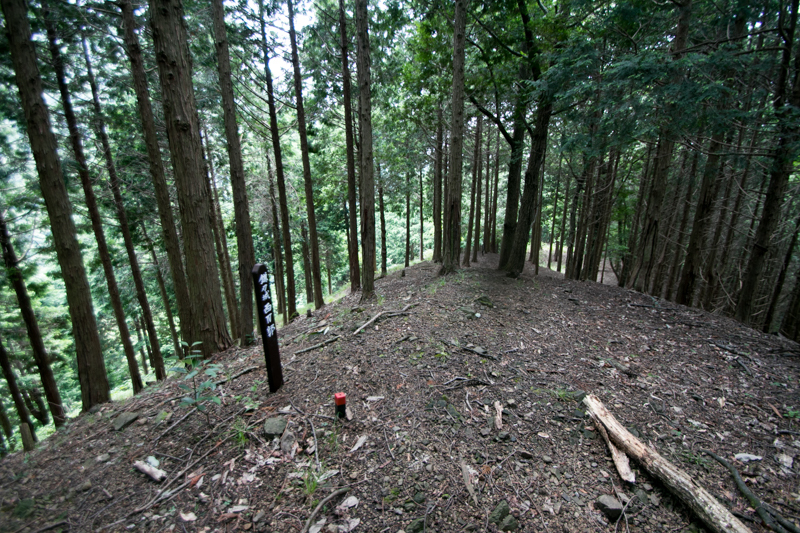 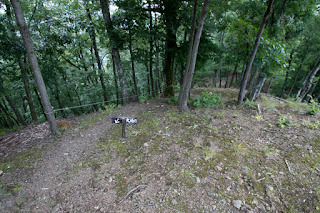 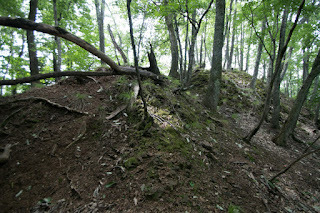 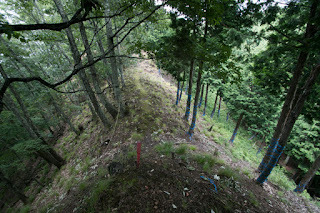 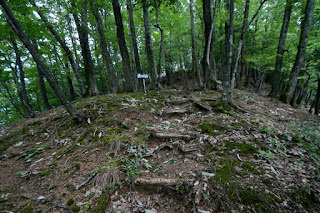 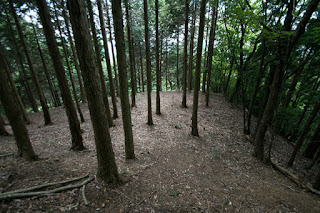 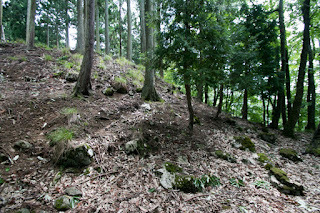 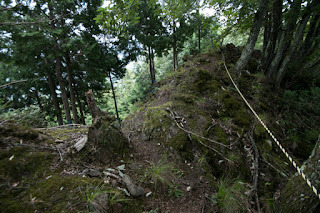 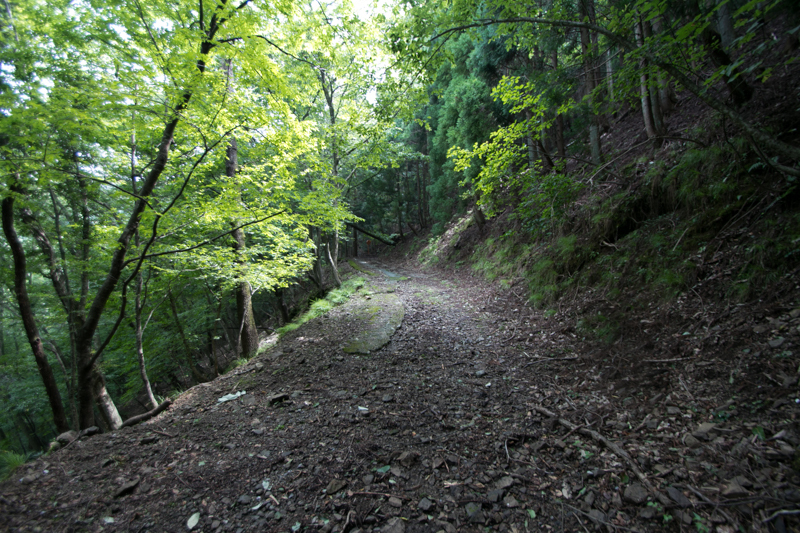 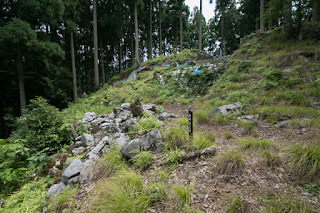 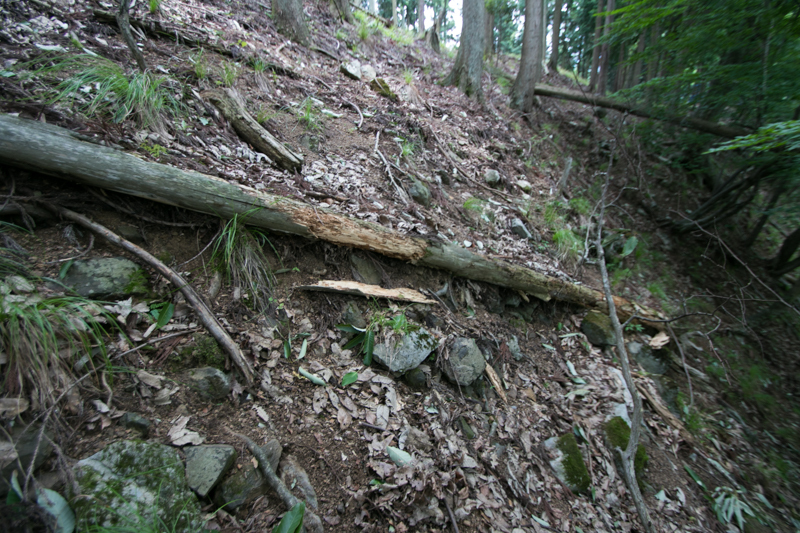 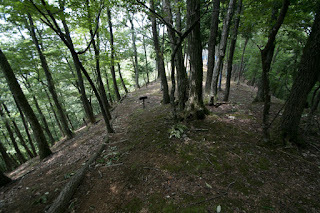 The ridge of Kamaha castle is a narrow and sharp one sandwiched by steep slope, and becomes a source of the name Kamaha, which means edge of sickle. 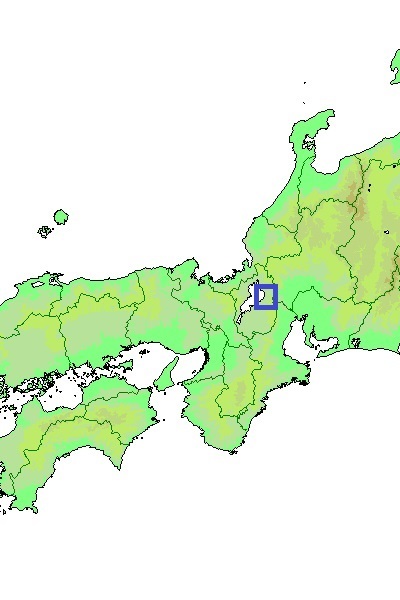 Current Shiga prefecture spreads whole direction of Lake Biwako, but east side of the lake is divided by narrow path from Hikone city to Maibara city. Currently major transportations such as Shinkansen train or Route 8 passes lakeside Maibara area, and Banba area is a quiet valley town. 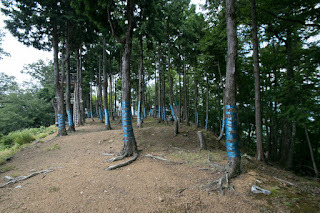 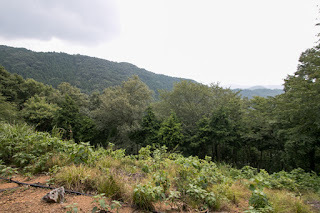 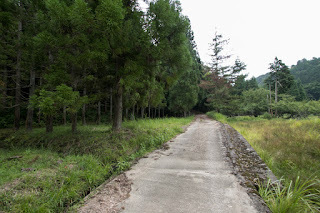 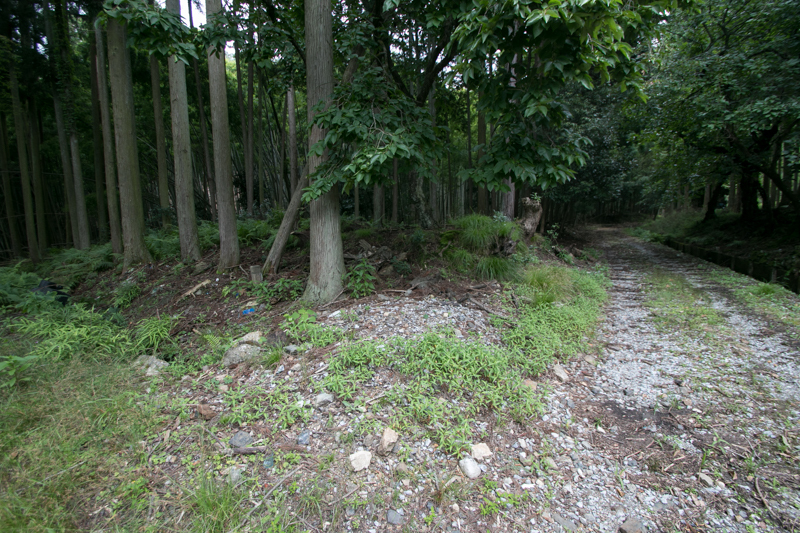 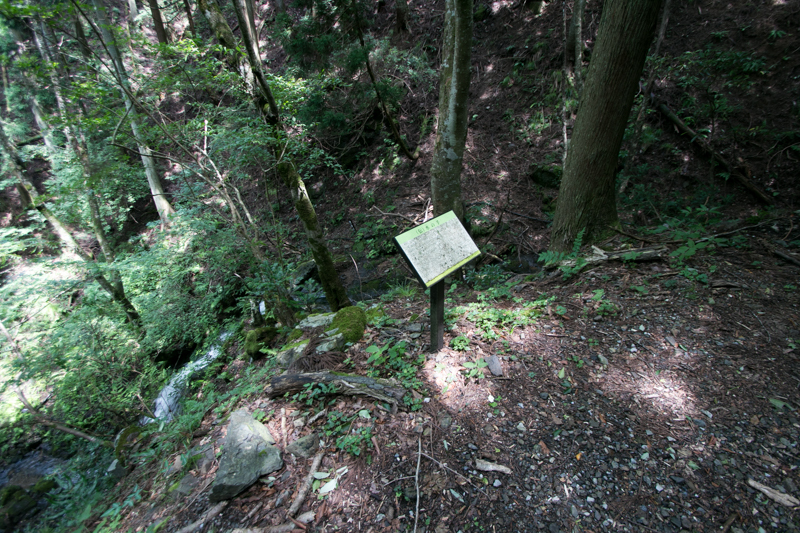 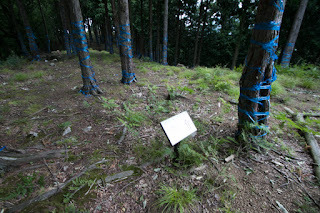 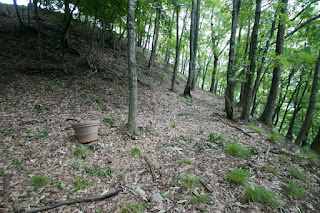 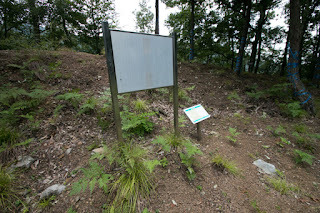 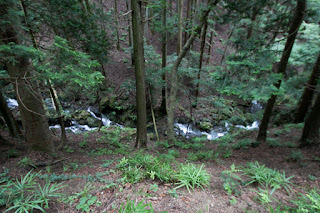 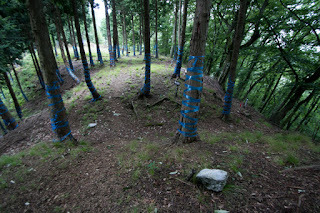 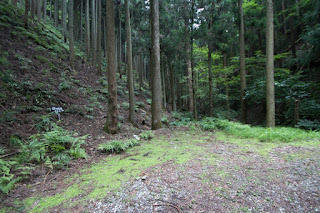 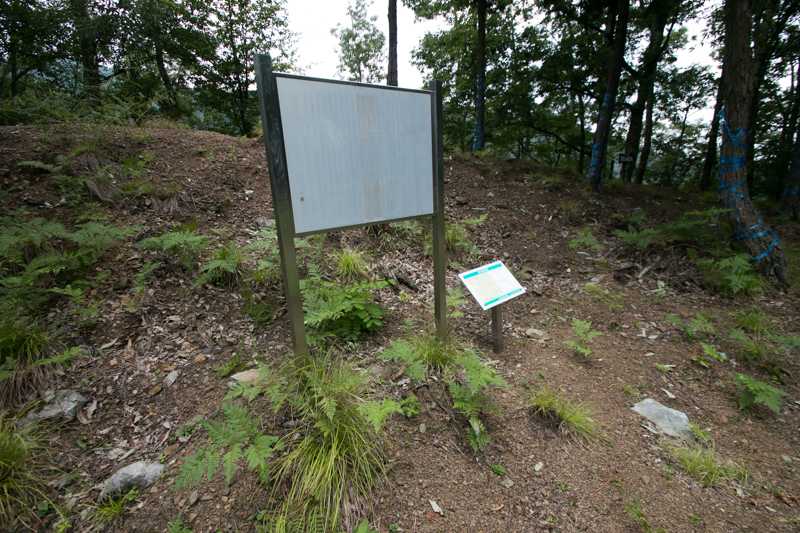 But formerly an inlet of Lake Biwako spread from backside of Sawayama mountain to Maibara area, thus Nakasendo road, which was one of the major road connected Kyoto city and Kanto region, crossed Surihari-Toge pass and entered into the valley of Banba, then directly ran toward Sekigahara area. 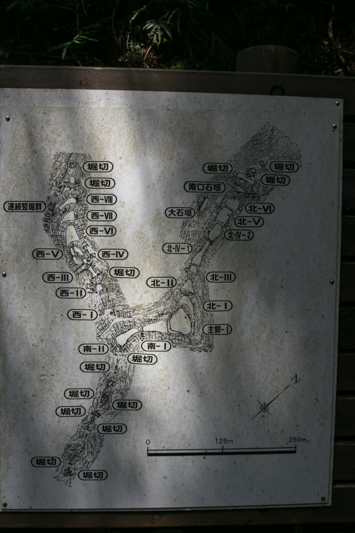 Banba town was one of the 69 posting town of Nakasendo road, and even now Meishin Expressway runs same route. 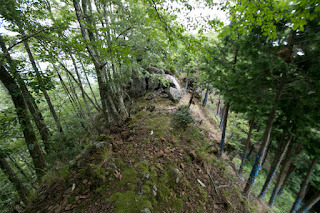 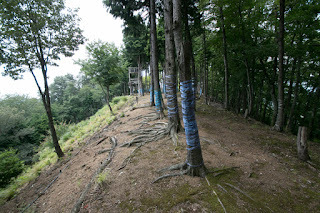 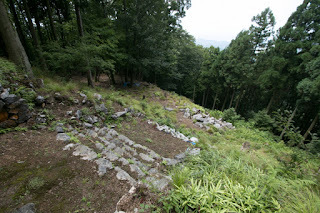 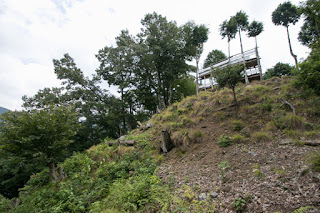 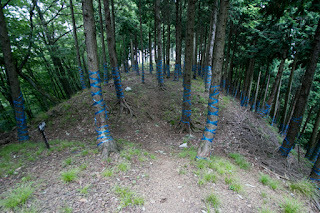 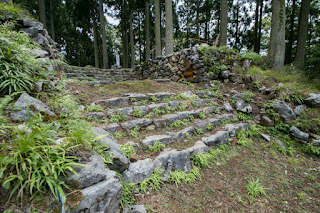 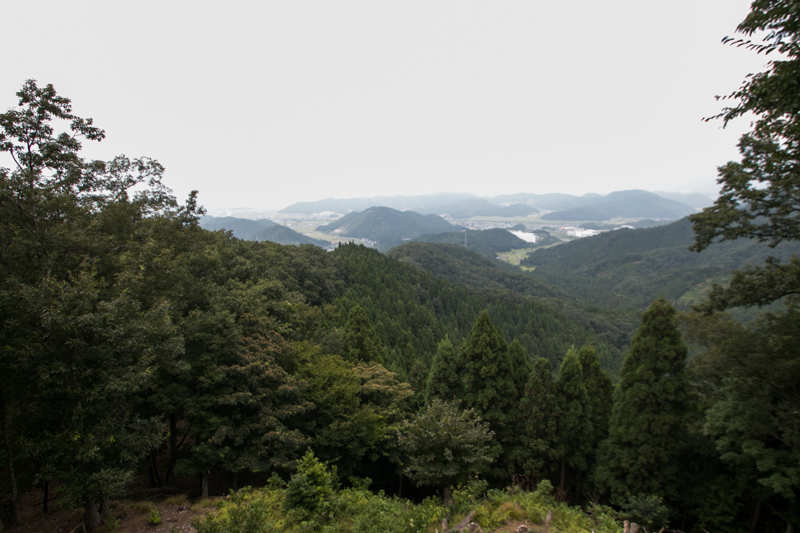 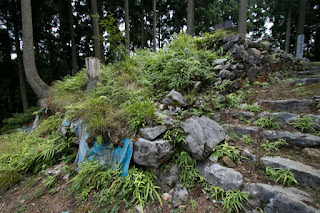 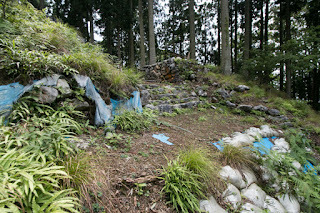 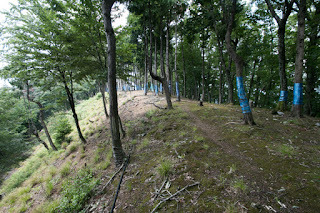 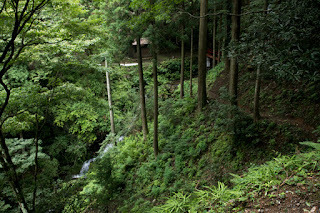 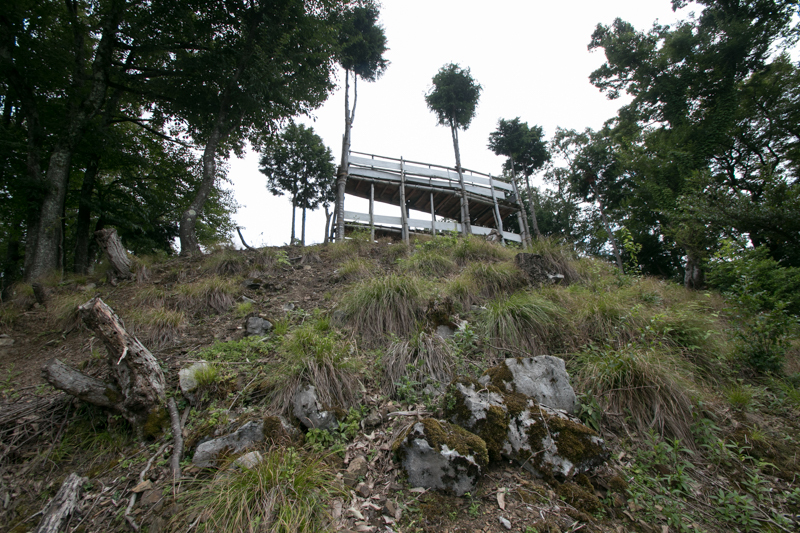 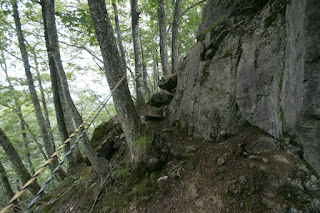 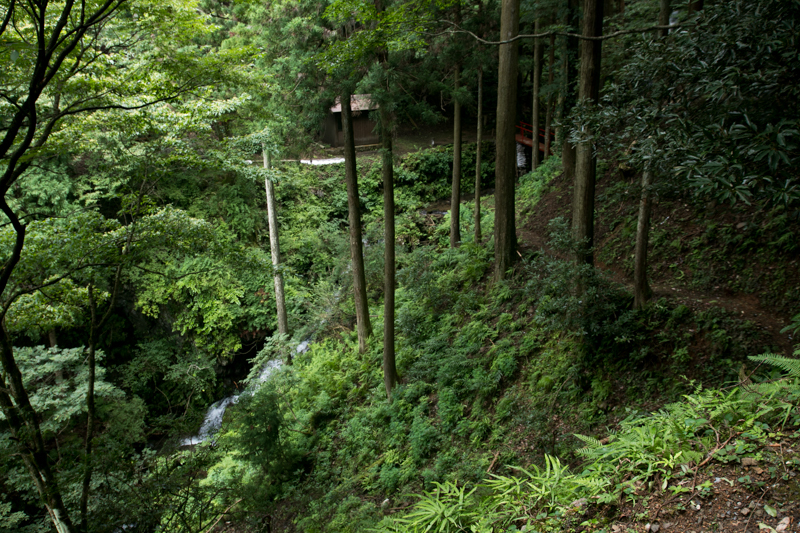 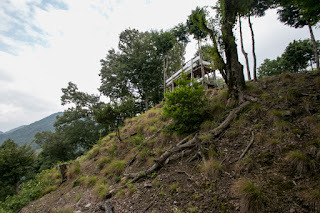 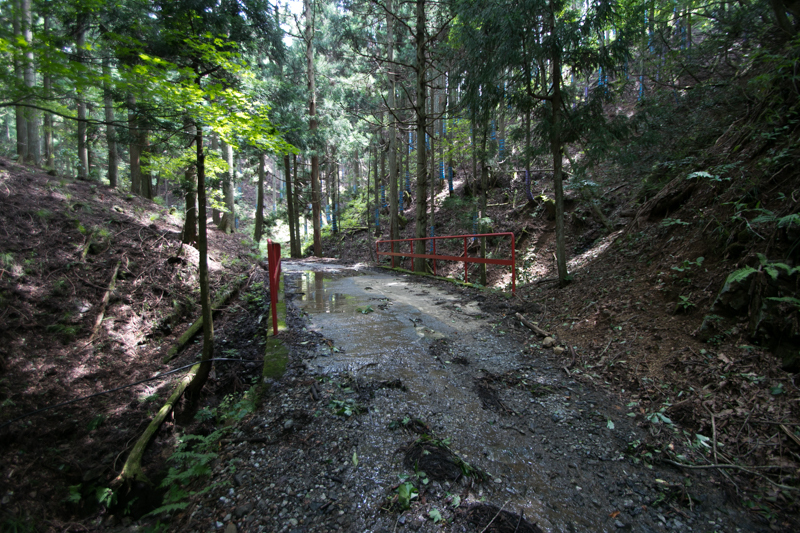 Furthermore, the backside of Kamaha castle is a connecting point of mountainous road which run around Ryozen mountains from Samegai valley to Taga area. 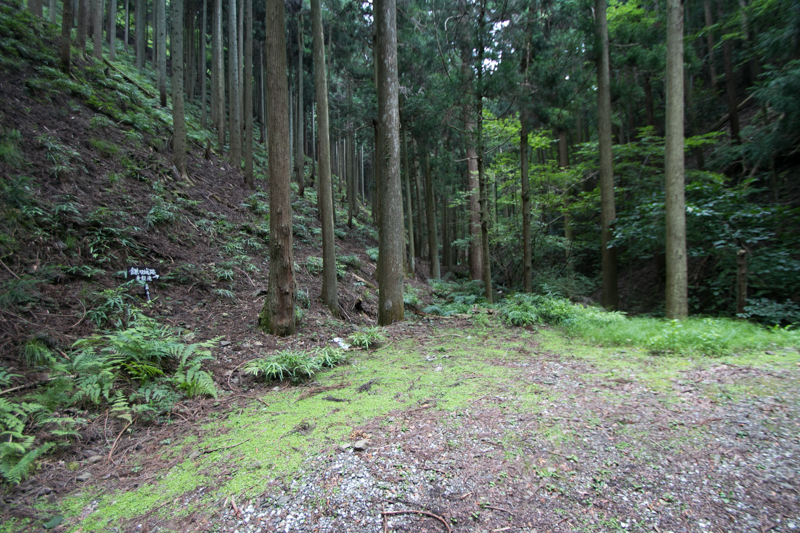 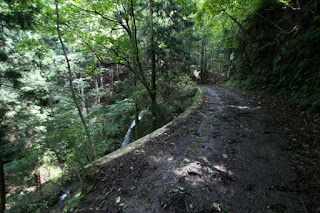 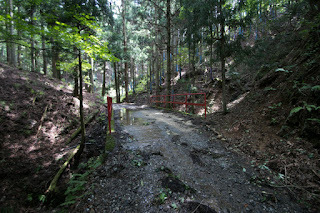 As these mountainous roads worked by-pass route of Nakasendo main road, Kamaha castle was an important point to control communication between north half and south half of Omi province (Shiga prefecture), and Mino province (Gifu prefecture), along with Sawayama castle (Shiga prefecture) at lakeside. 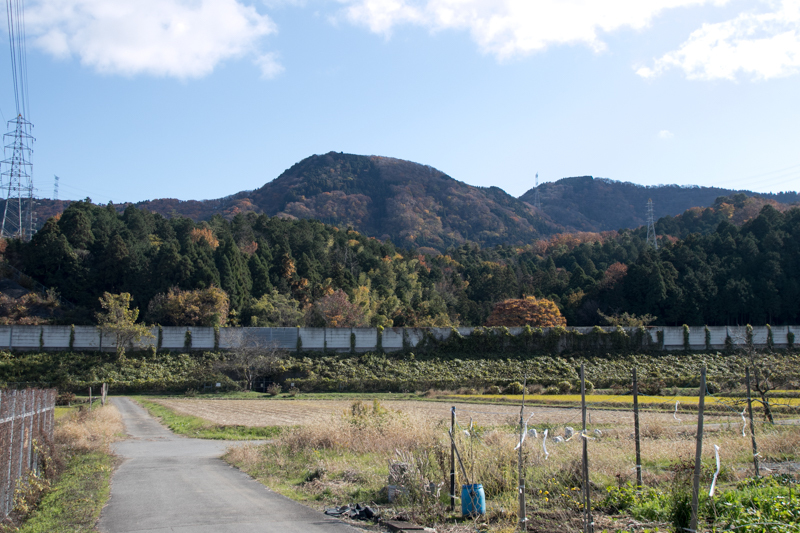 In Muromachi era, south half of Omi province and northeastern part of province were governed by Rokkaku clan and Kyogoku clan, both were descendants of Sasaki clan. 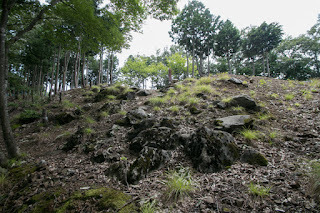 After the battle of Onin occurred from 1467 to 1477, Rokkaku clan gradually grew their power rejecting subjugation by Muromachi Shogunate, and in the former half of 16th century prospered as a strong warlord under Sadayori Rokkaku (1495-1552). 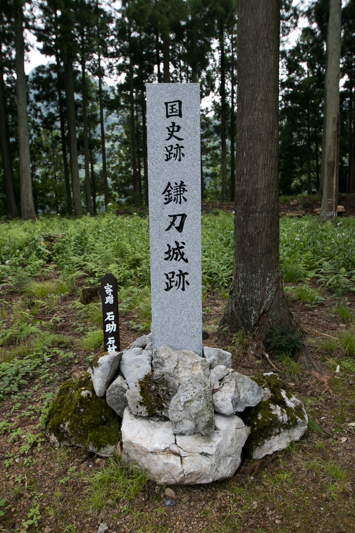 On the other hand, Kyogoku clan once prospered by activation of Doyo Sasaki (1296-1373), who was known as Basara Lord because of splendid and unconventional behavior, and achieved the governor of Izumo province and Oki province (Shimane prefecture) and Hida province (northeastern part of Gifu prefecture). 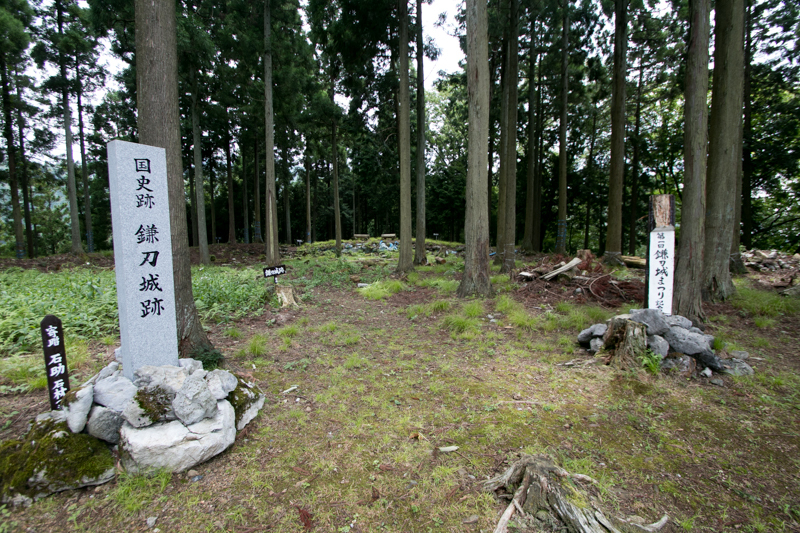 But after the battle of Onin, contrary to Rokkaku clan, Kyogoku clan significantly lost their power because of internal conflicts. 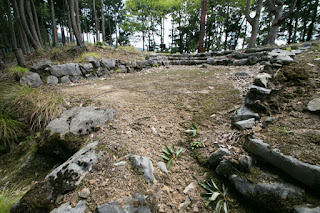 Izumo province was deprived by deputy governor Tsunehisa Amago (1458-1541), and main family lived at Omi province also faced alliance of local lord lead by Sukemasa Azai (1491-1542) who was the lord of Odani castle (Shiga prefecture). In 1524, Sukemasa Azai and his ally expelled the leader of Kyogoku clan then seized northeastern part of Omi province. 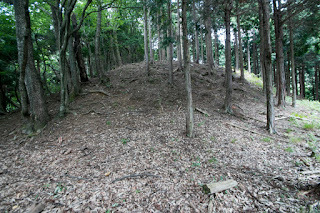 Being supported by Asakura clan which was the warlord of Echizen province (Fukui prefecture), Azai clan nominally supported the person of Kyogoku clan as the governor but substantially governed their territory. 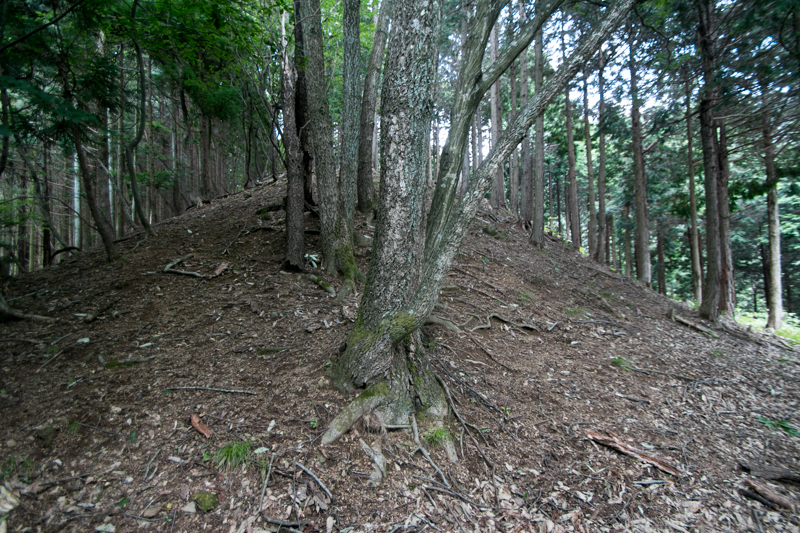 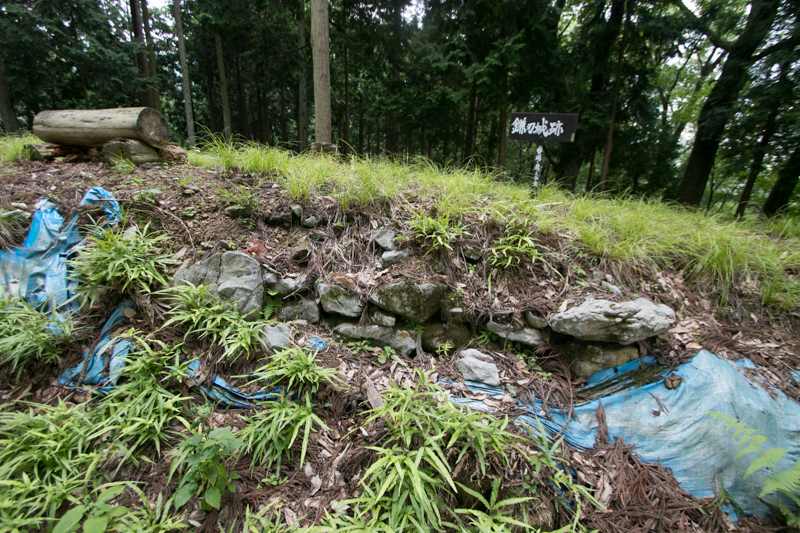 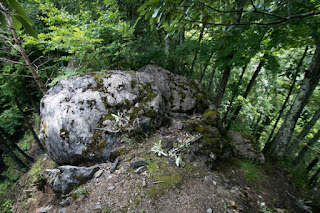 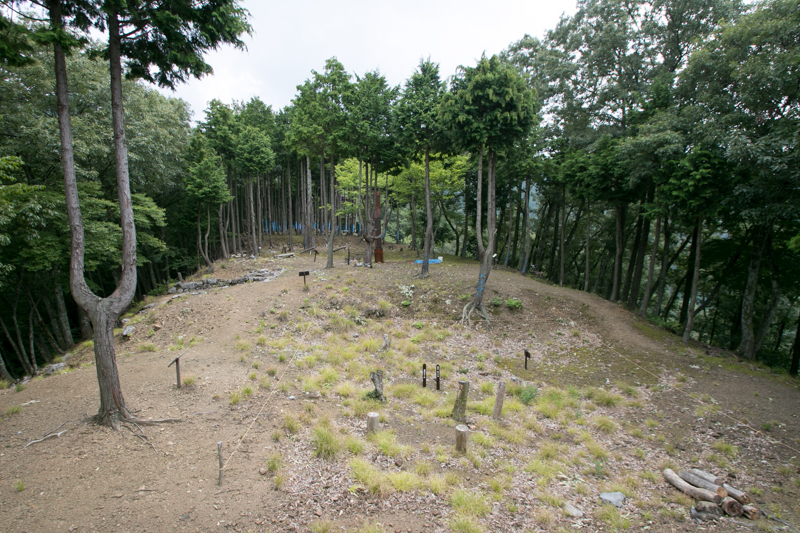 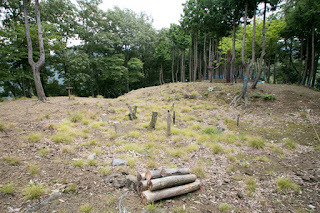 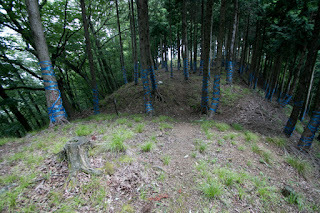 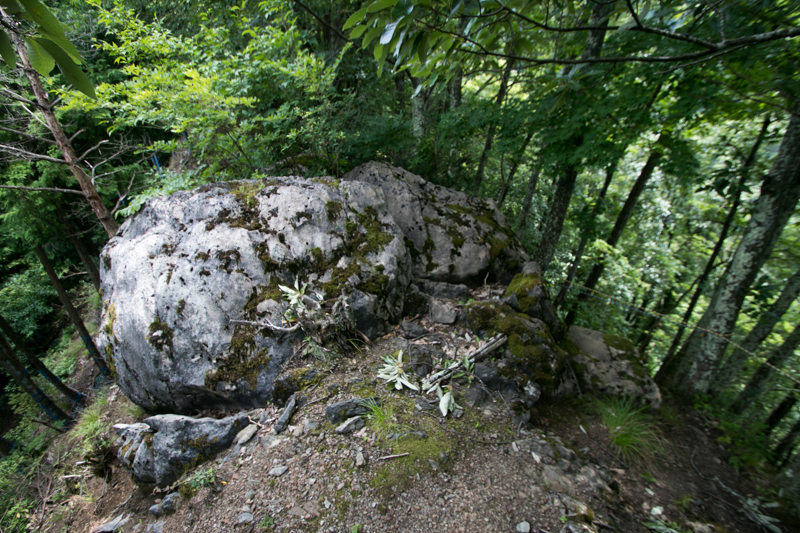 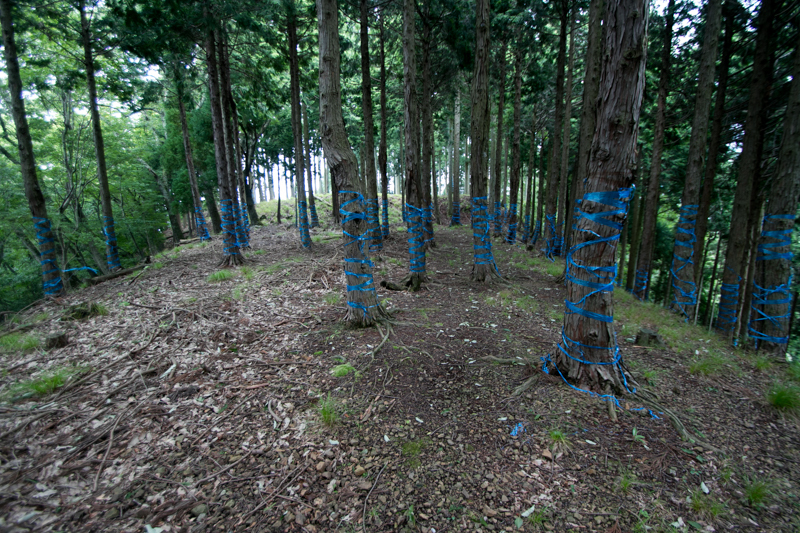 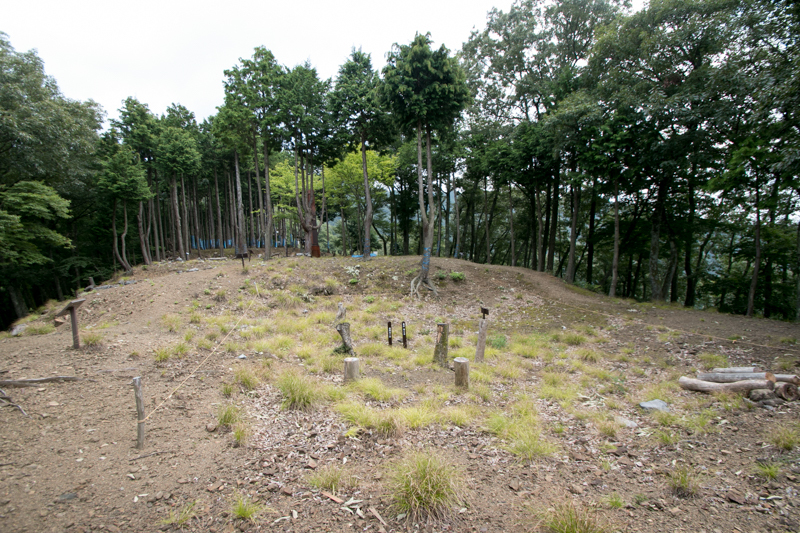 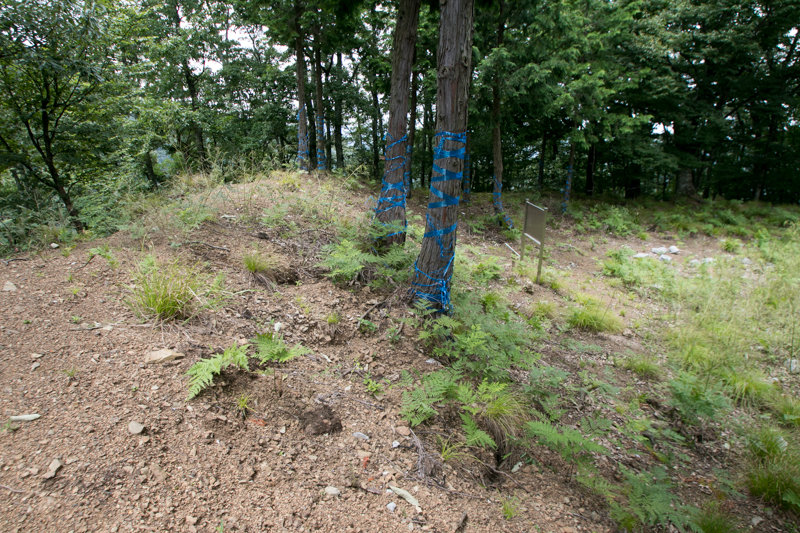 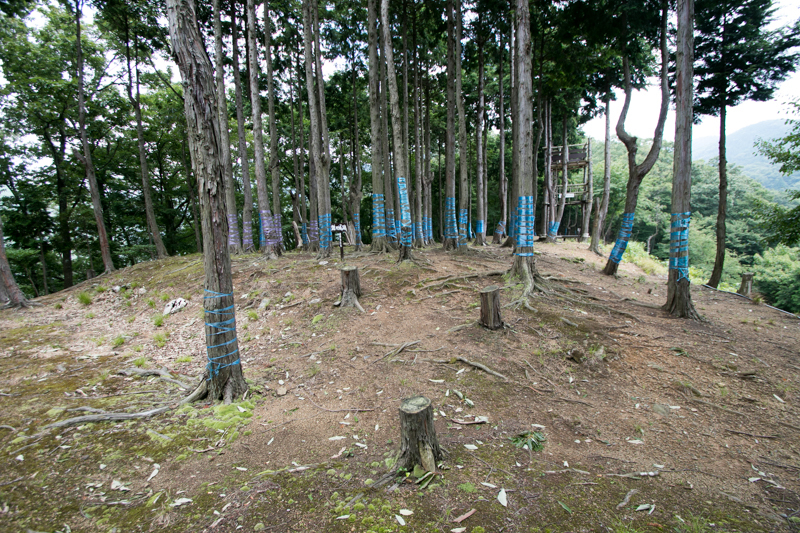 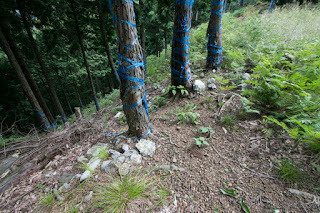 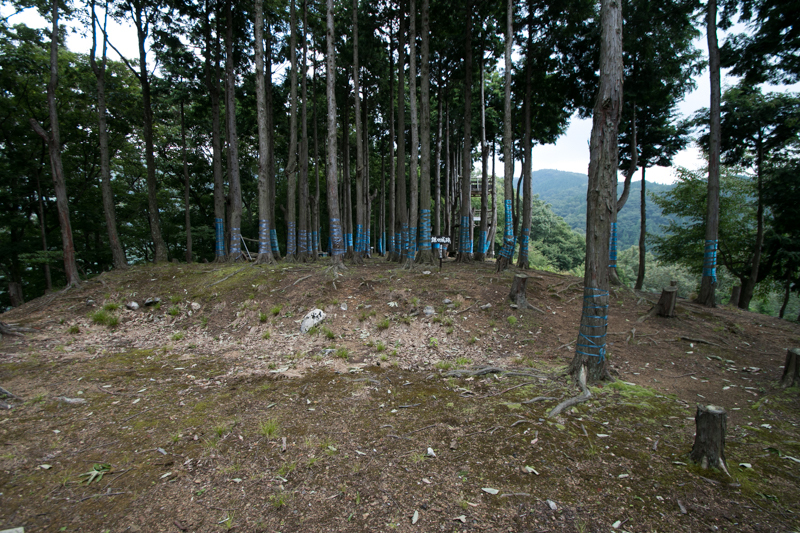 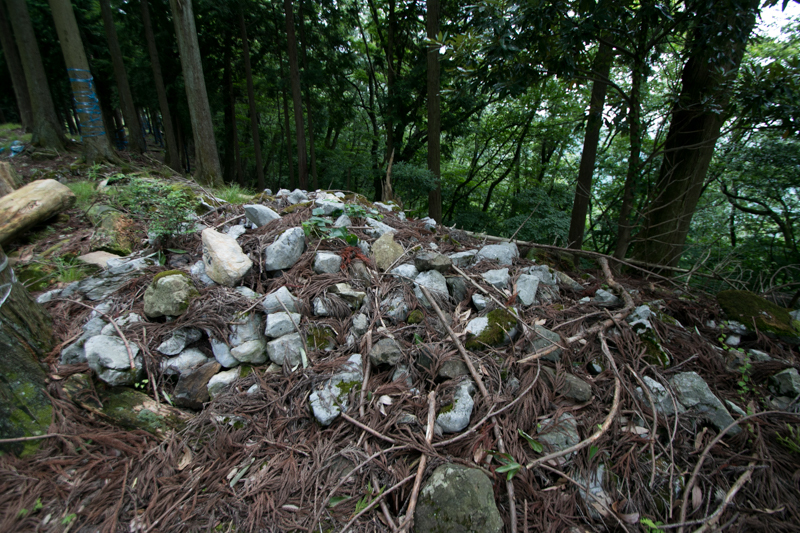 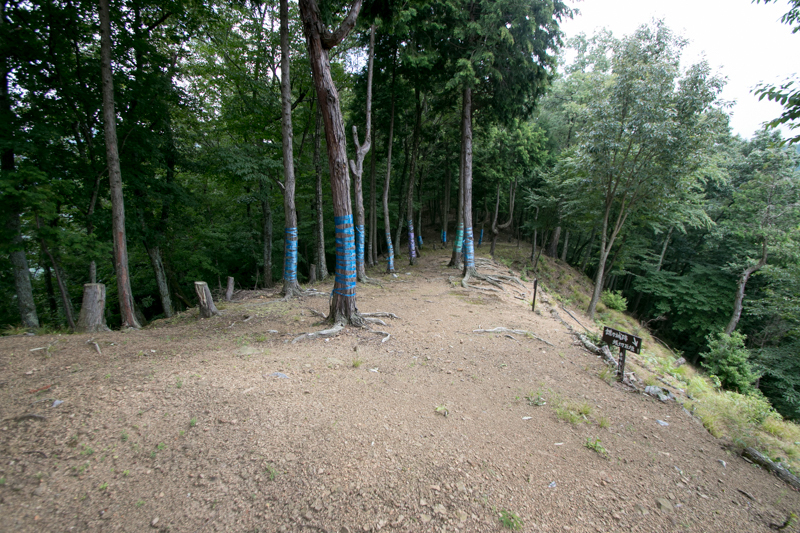 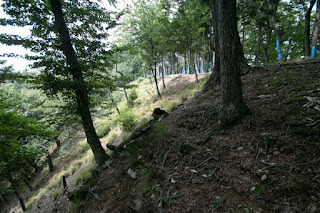 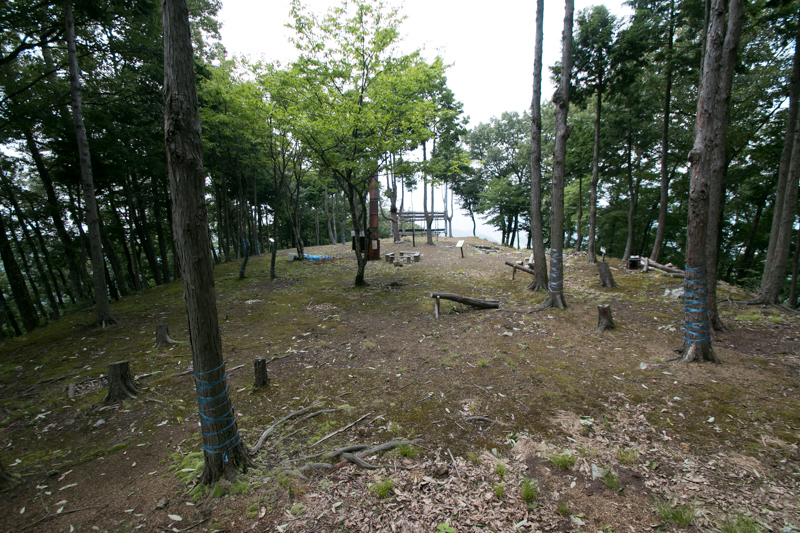 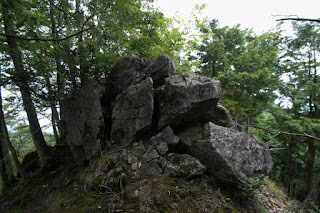 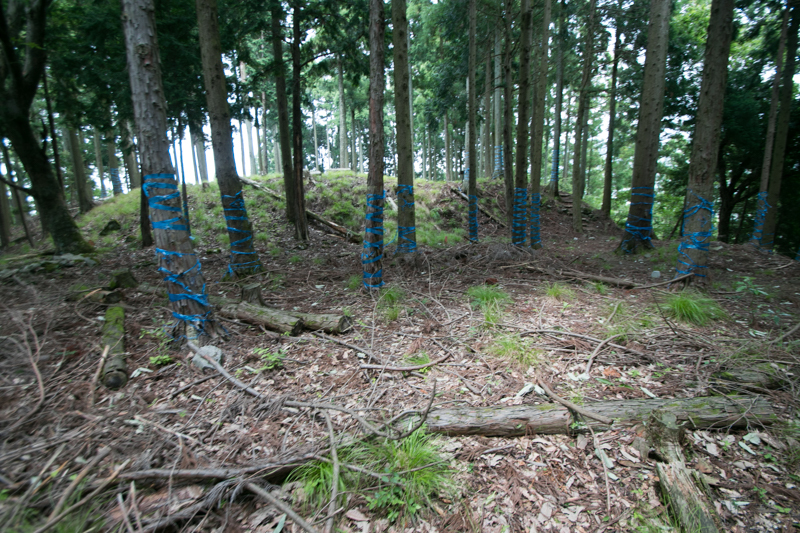 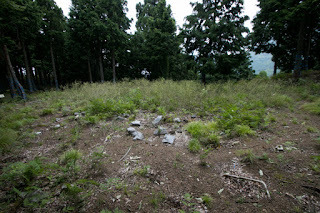 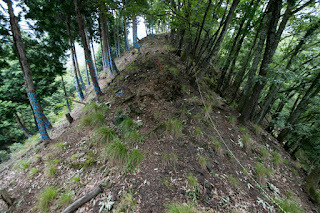 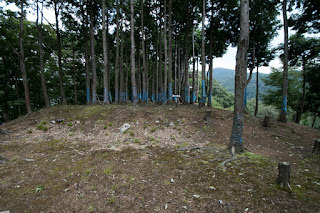 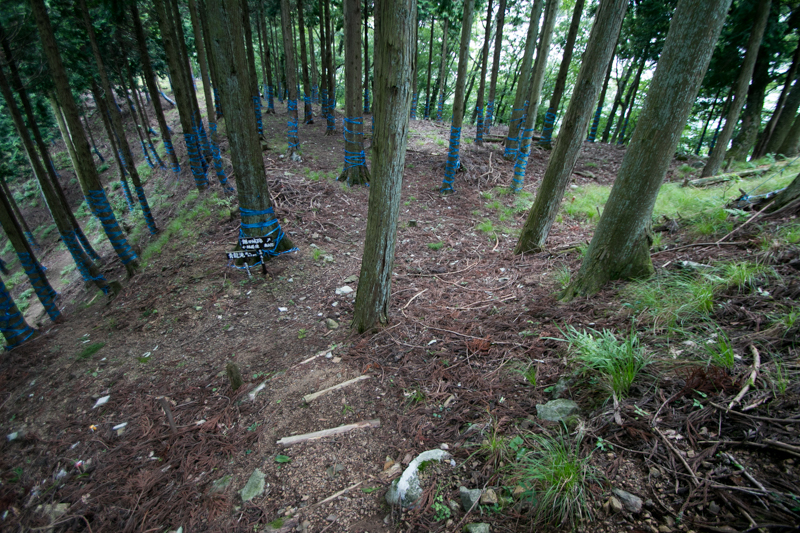 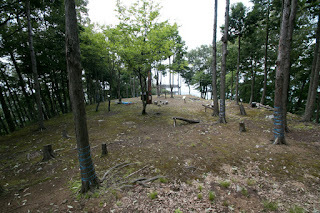 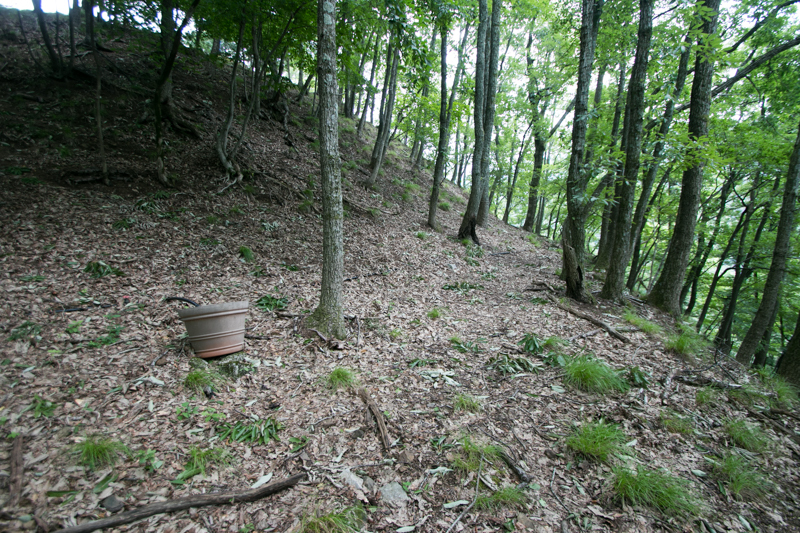 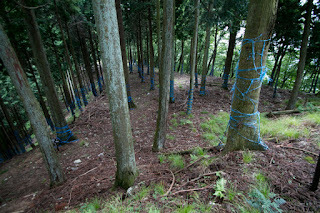 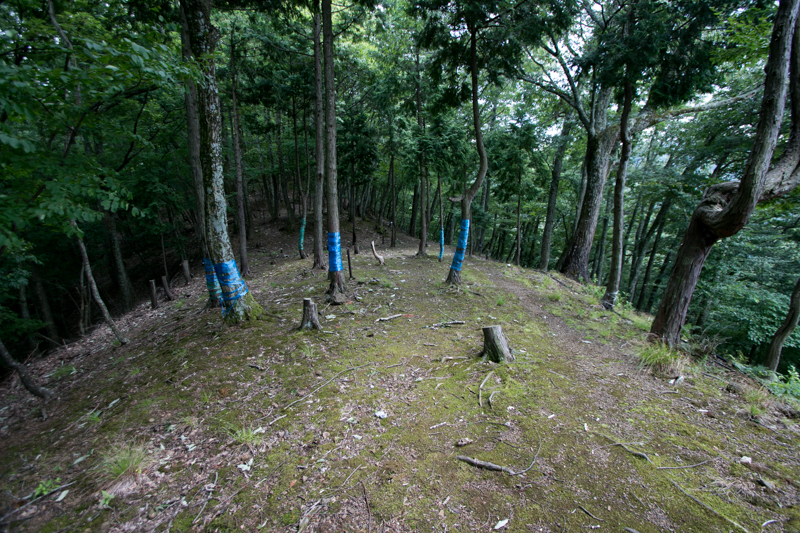 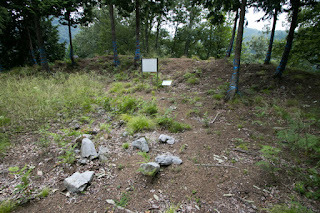 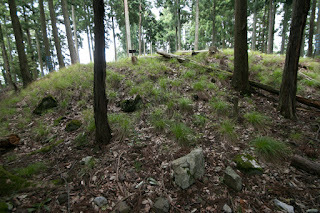 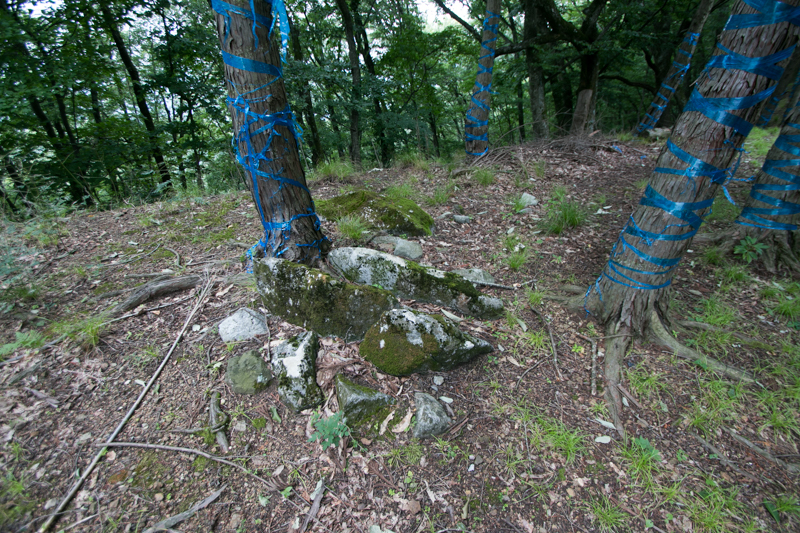 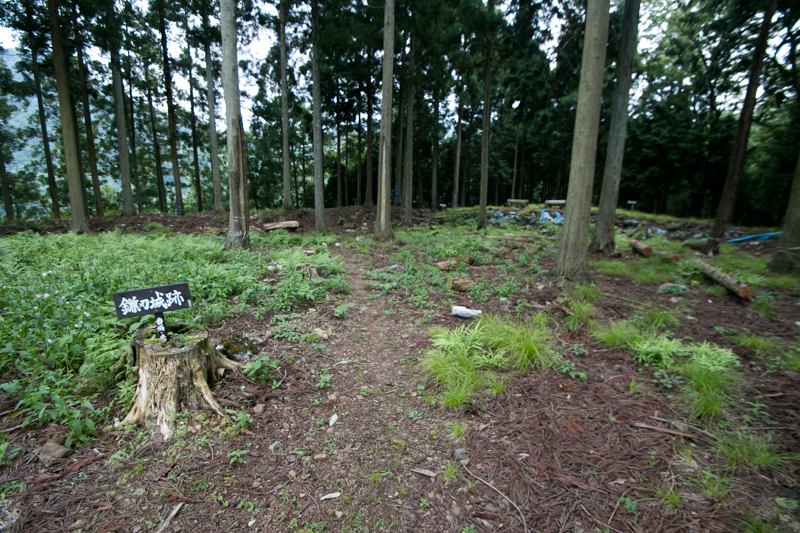 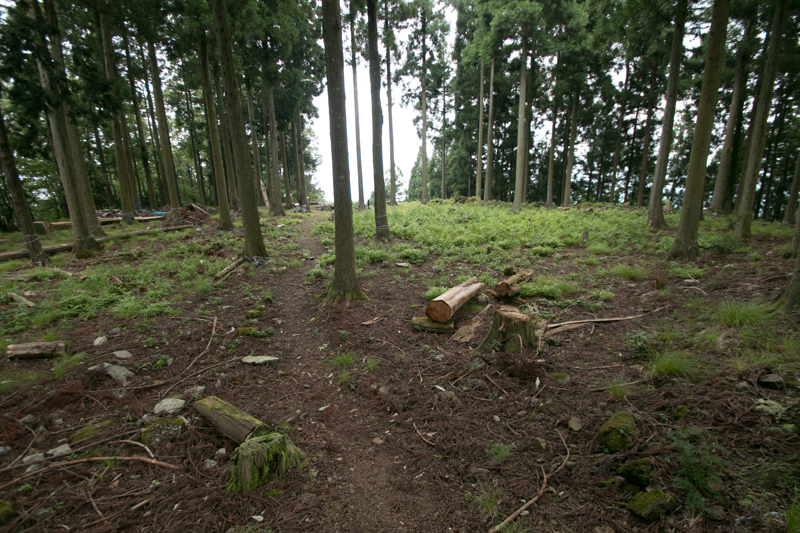 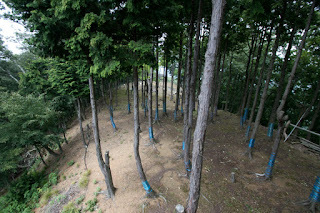 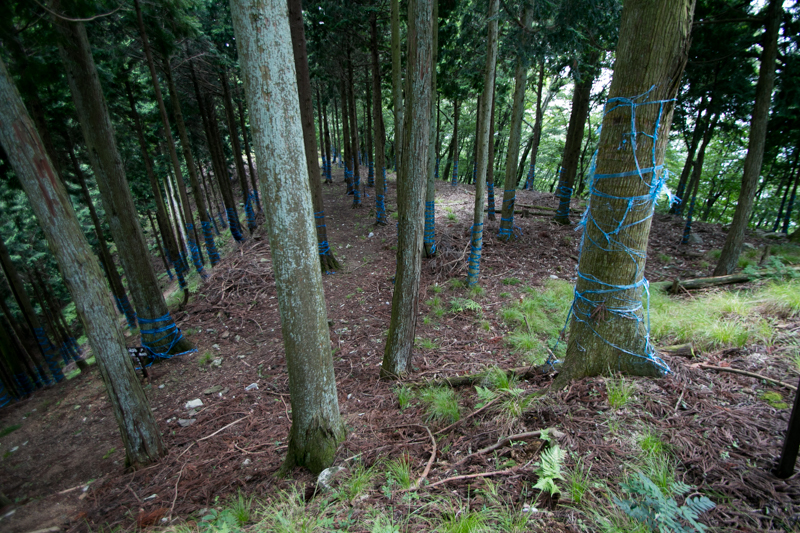 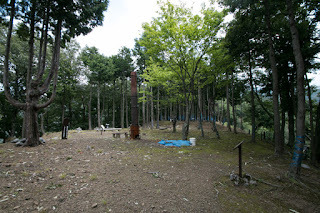 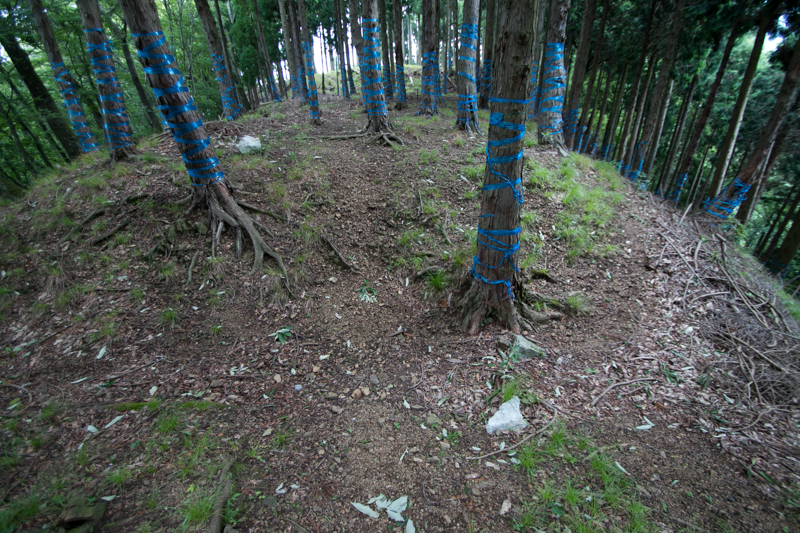 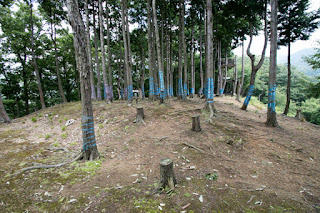 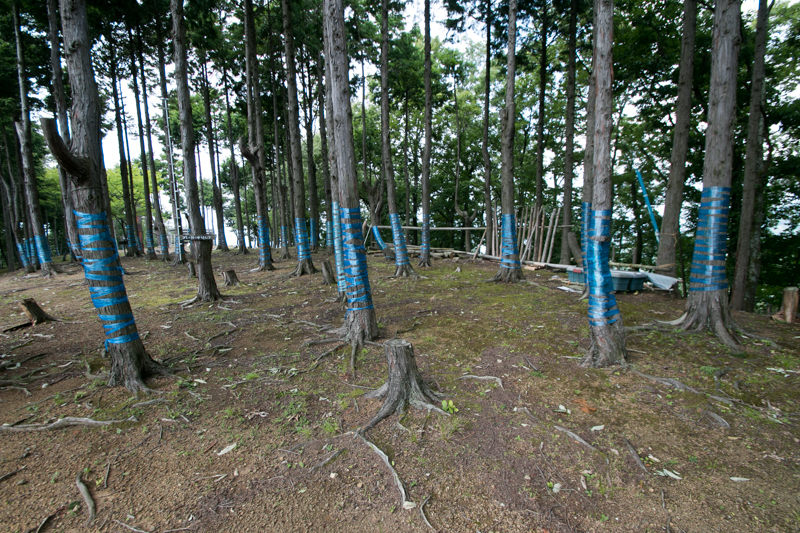 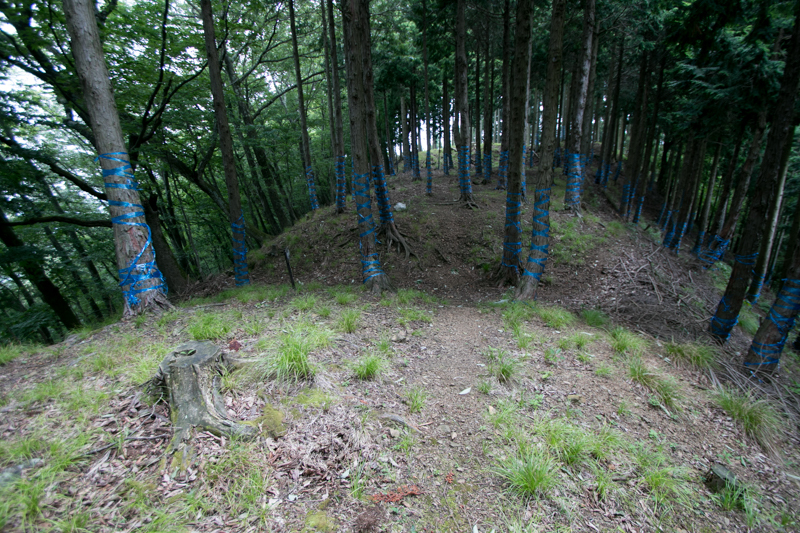 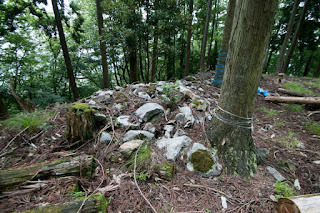 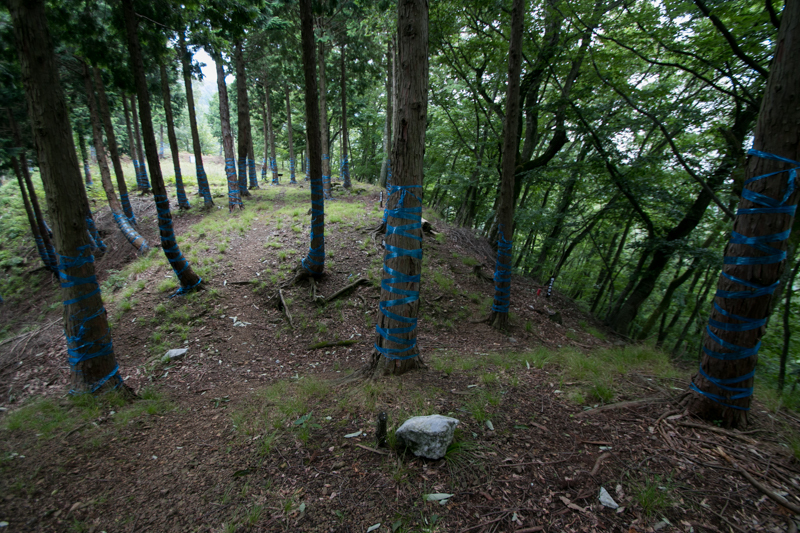 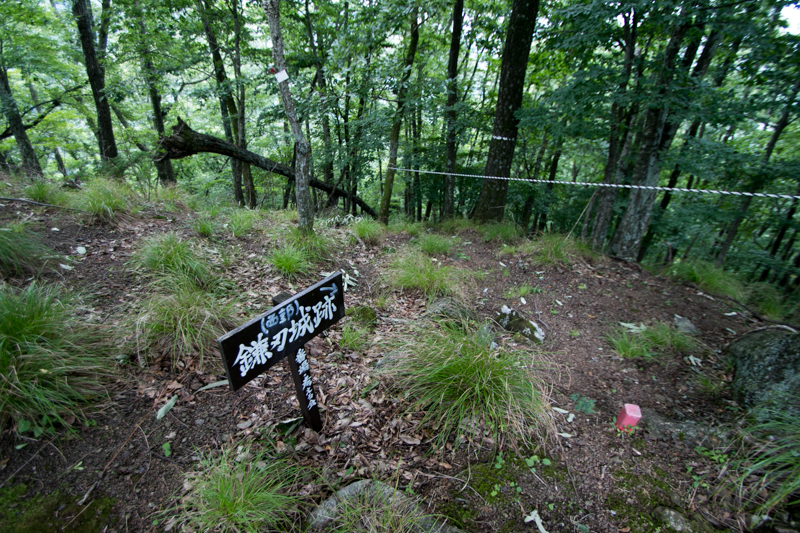 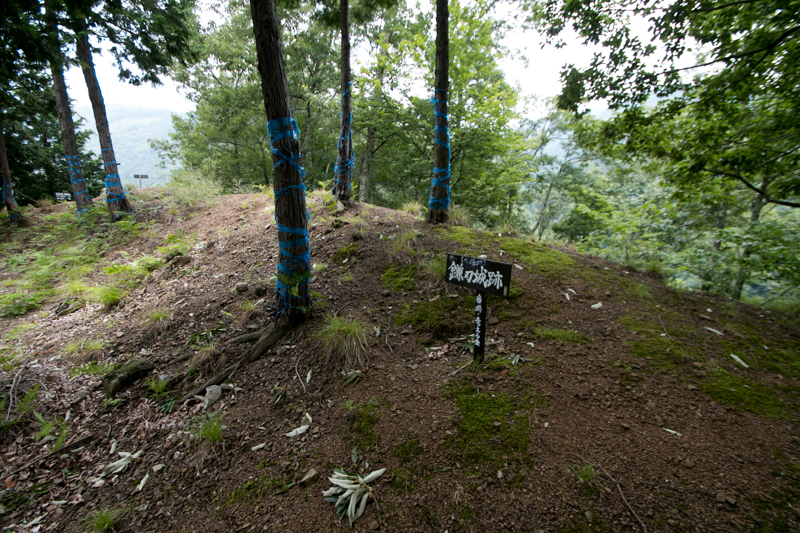 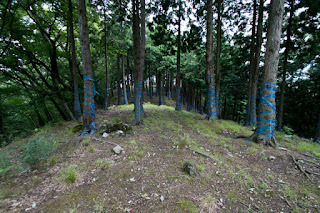 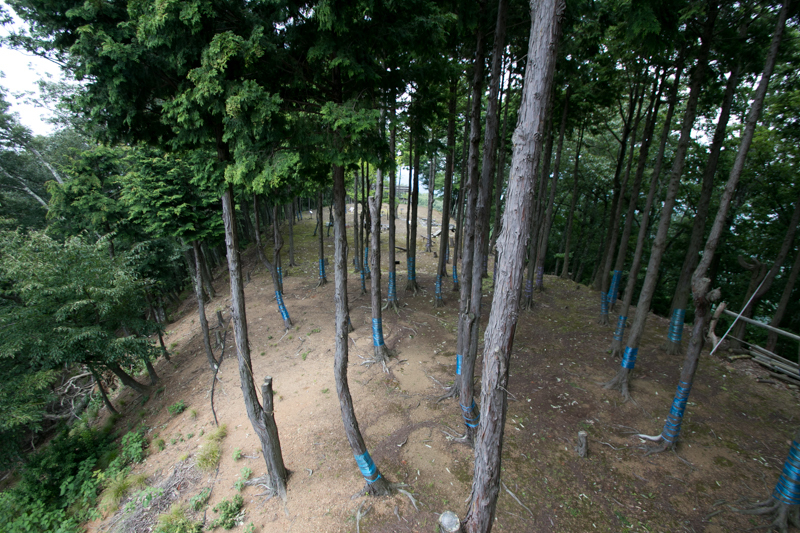 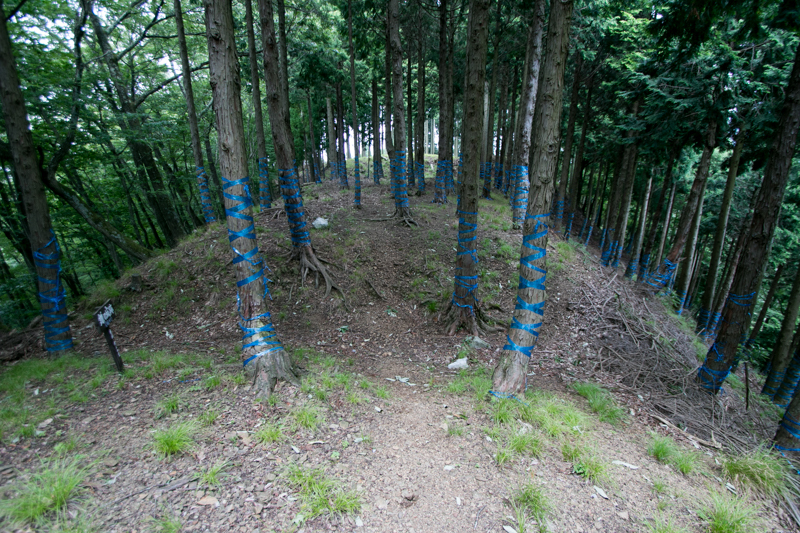 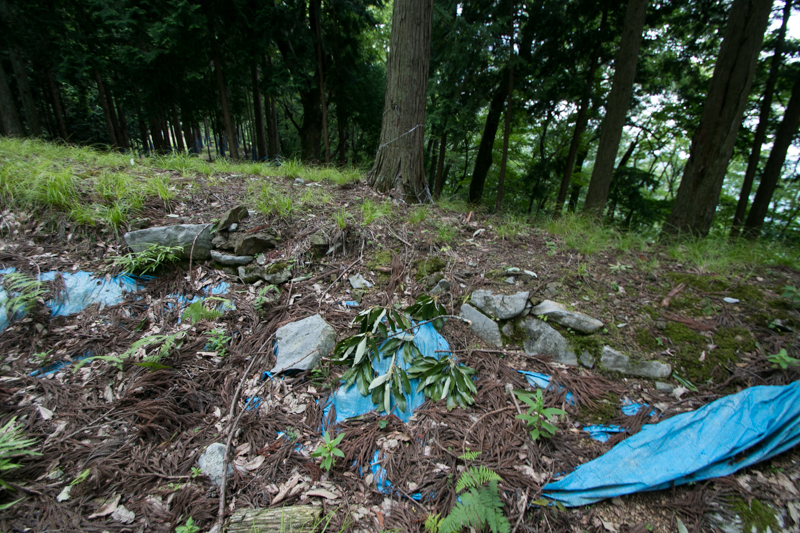 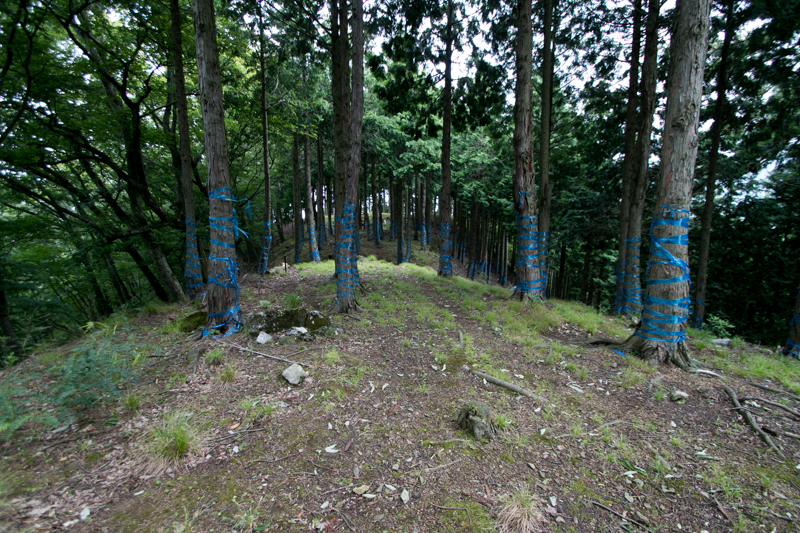 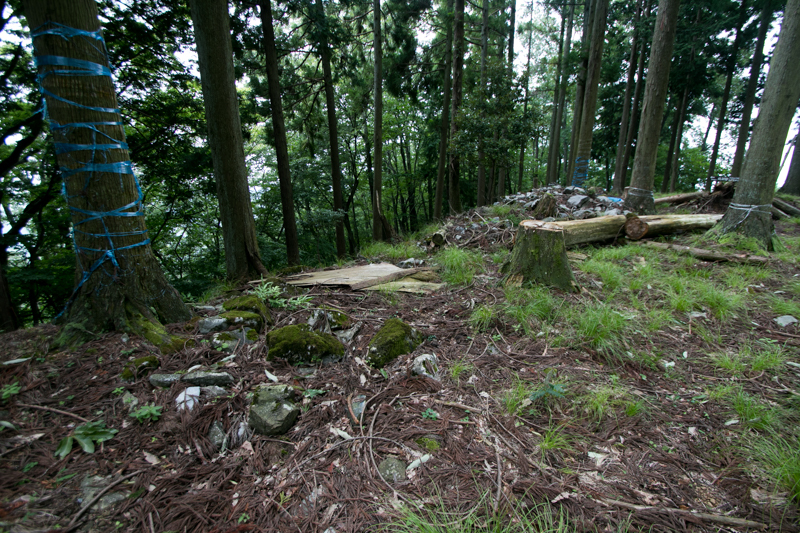 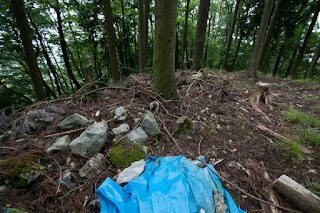 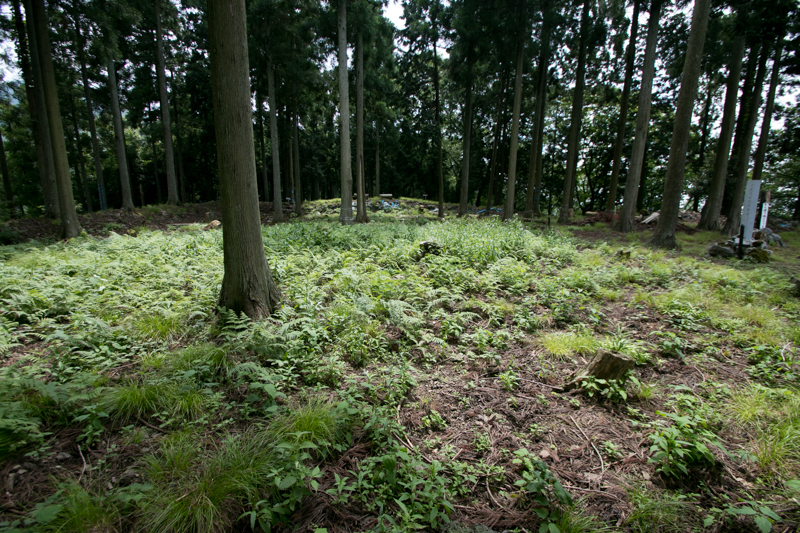 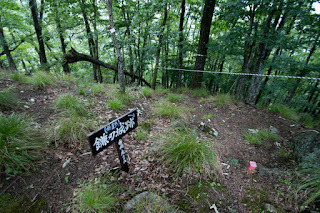 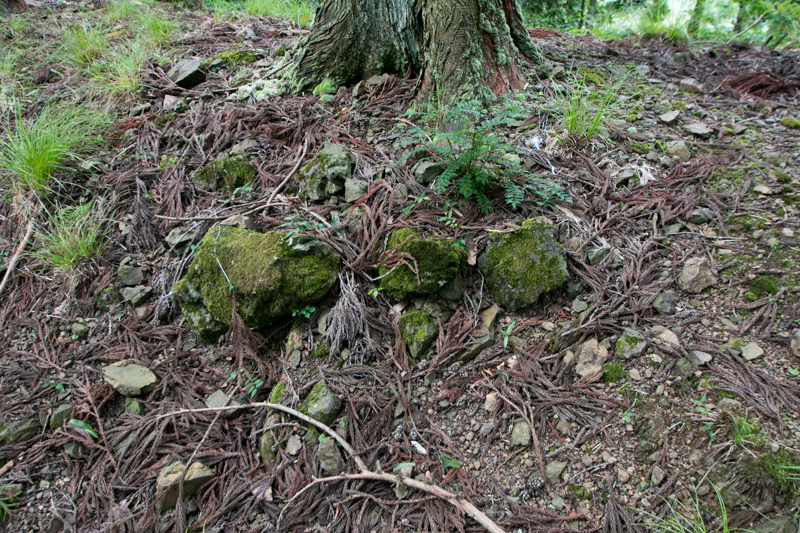 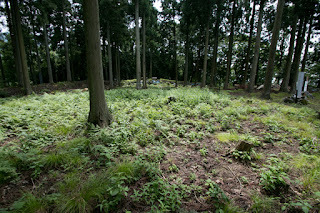 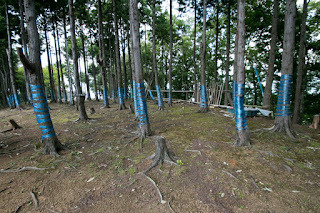 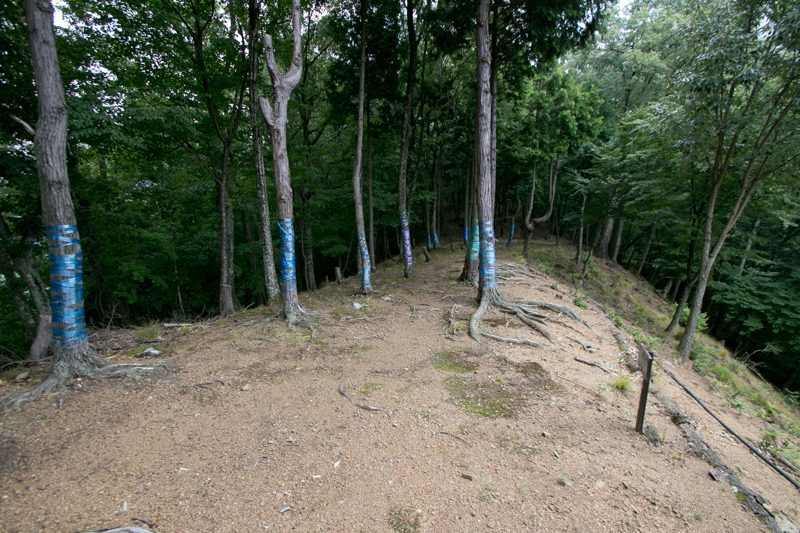 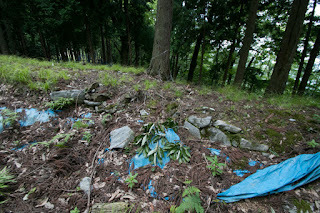 But one family of Kyogoku clan still remained at the south of Ibuki mountain and attempted their revival. Precise year is unknown but Kamaha castle was built by the latter half of 15th century by Hori clan. 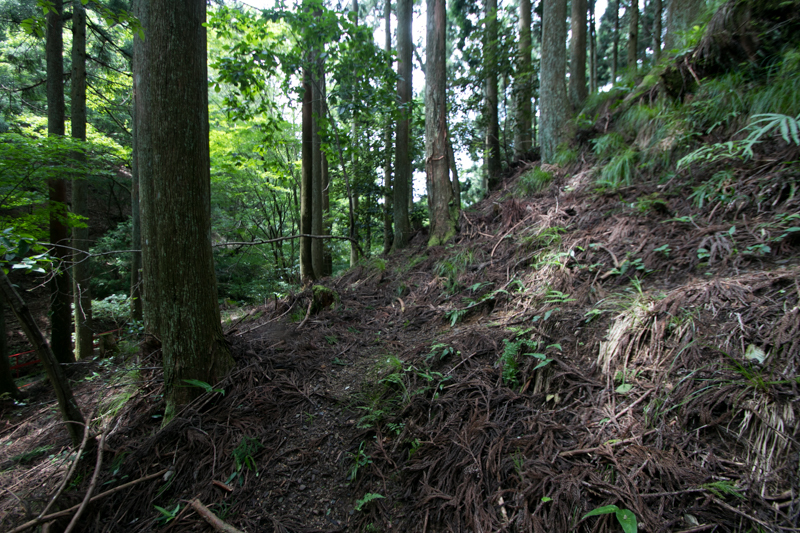 Hori clan was a local lord held current Maibara area, replacing Dohi clan which held this area at Kamakura era. 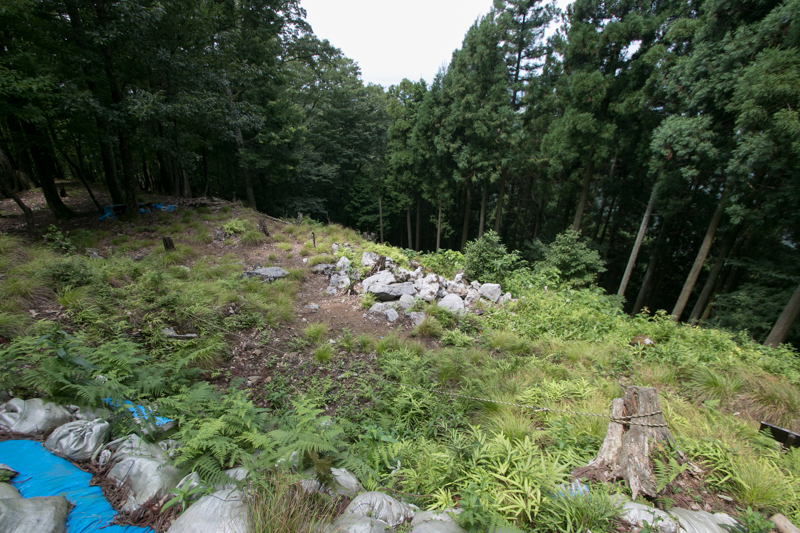 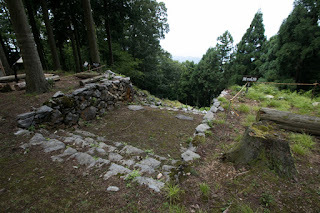 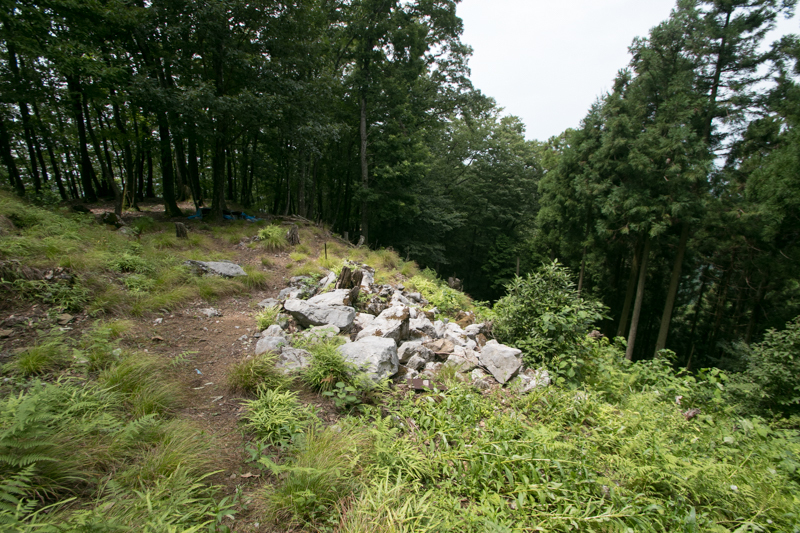 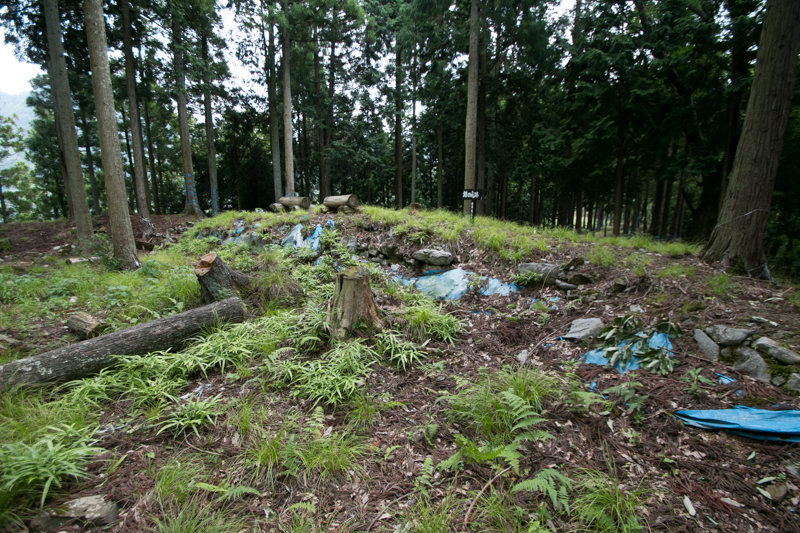 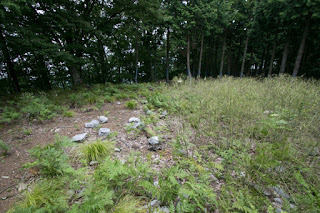 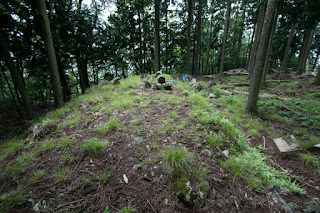 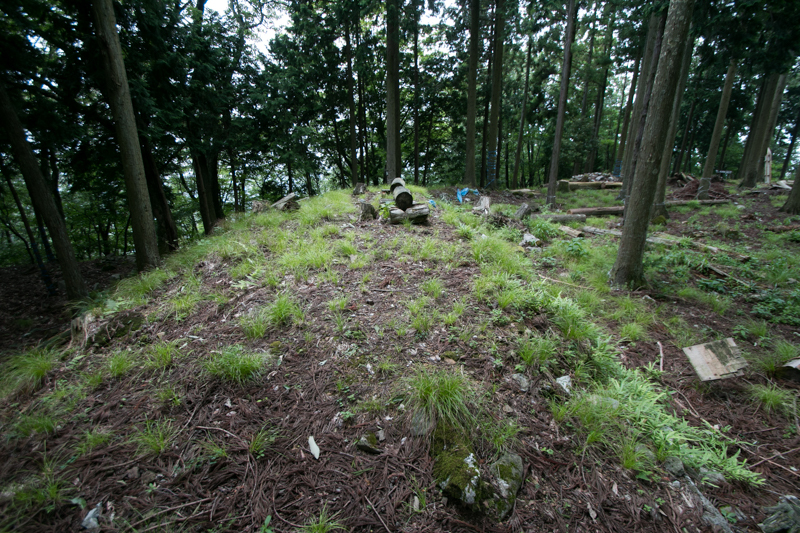 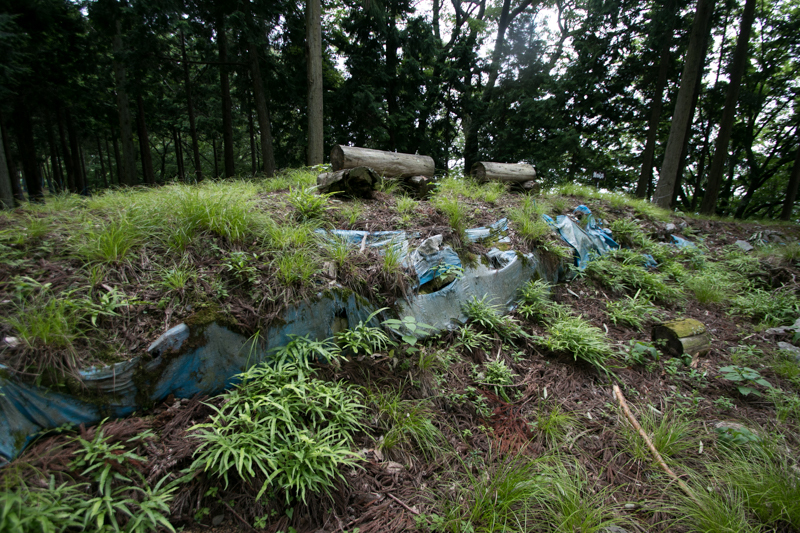 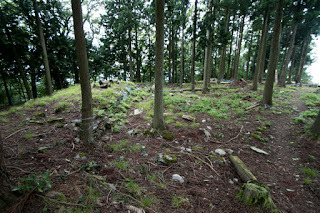 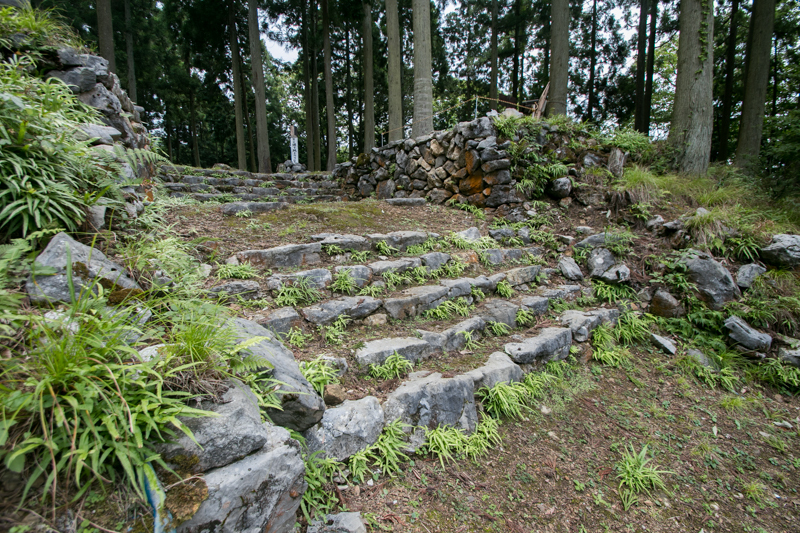 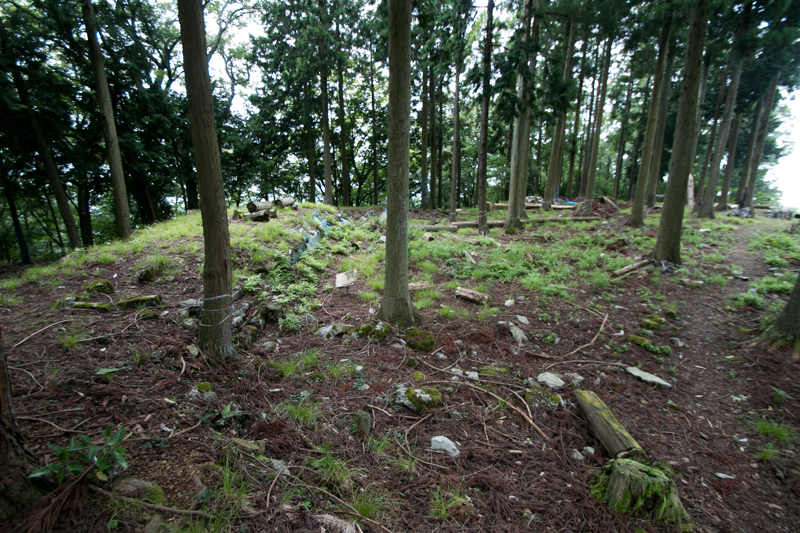 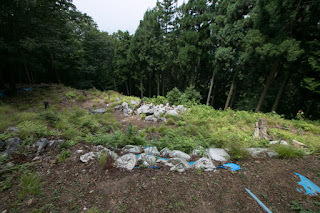 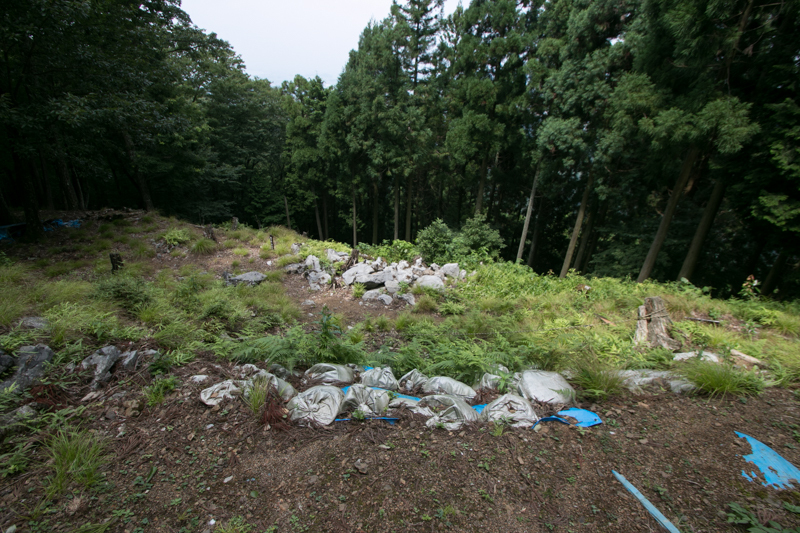 Hori clan originally held their residence at the hillside of Kamaha castle, but in turbulent situation they built Kamaha castle on the mountain preparing for Kyogoku clan and used it as their residence. 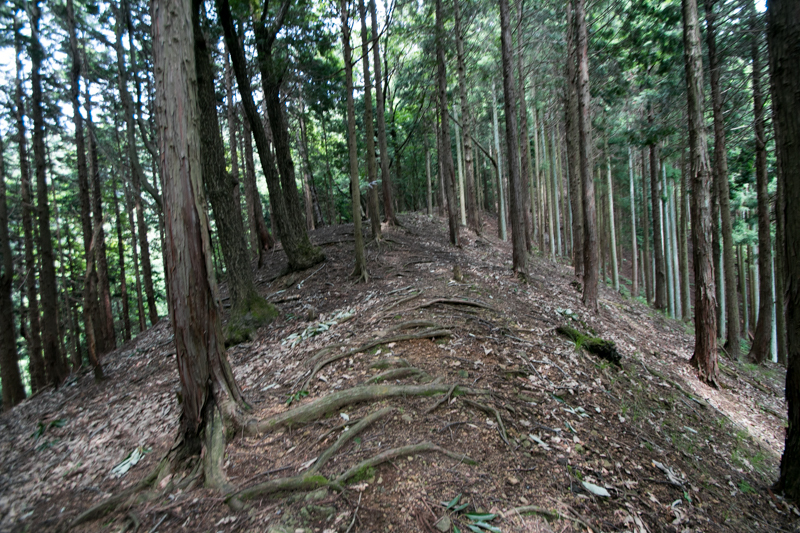 In the former half of 16th century, Hori clan participated in the alliance of local lords then supported Sukemasa Azai. 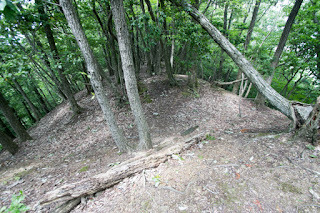 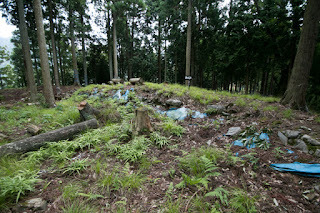 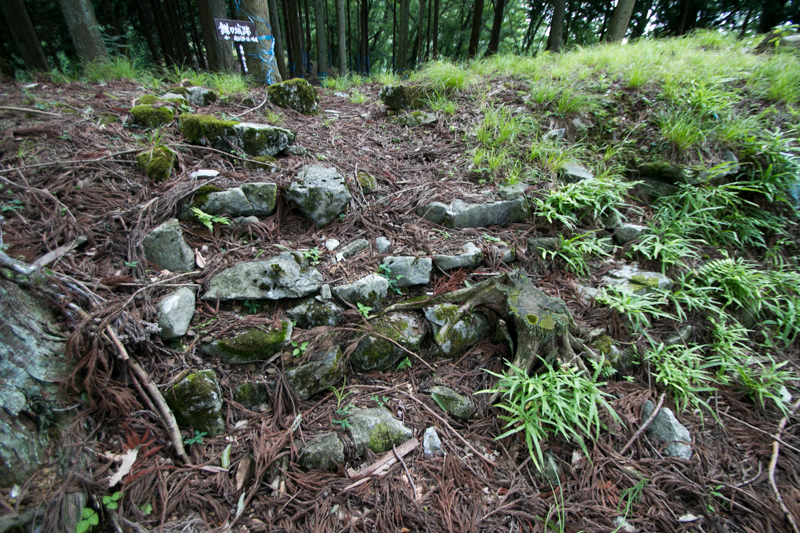 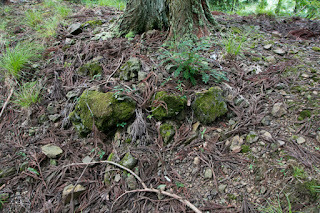 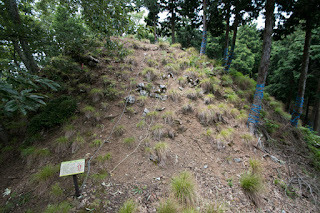 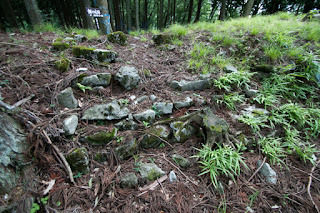 But in 1538 Kamaha castle was attacked by Sadayori Rokkaku and fell along with Sawayama castle. Furthermore, after the death of Sukemasa Azai, his son and successor Hisamasa Azai (1526-1573) could not manage the clan well then had to subordinate to Rokkaku clan. 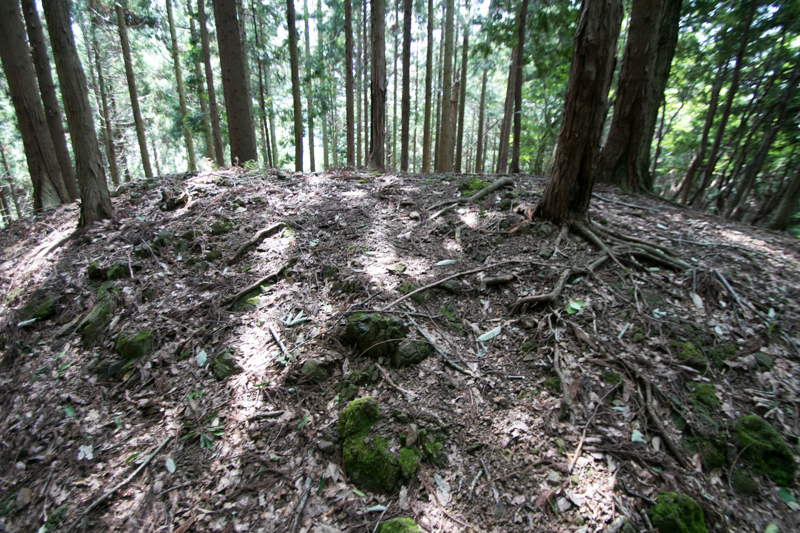 At the middle of 16th century, after the death of Sadayori Rokkaku, Rokkaku clan gradually lost their power by conflict of their retainers. Looking at this opportunity, in 1560, Nagamasa Azai (1545-1573) tried independence from Rokkaku clan and broke Rokkaku army at the battle of Norada with less soldier. 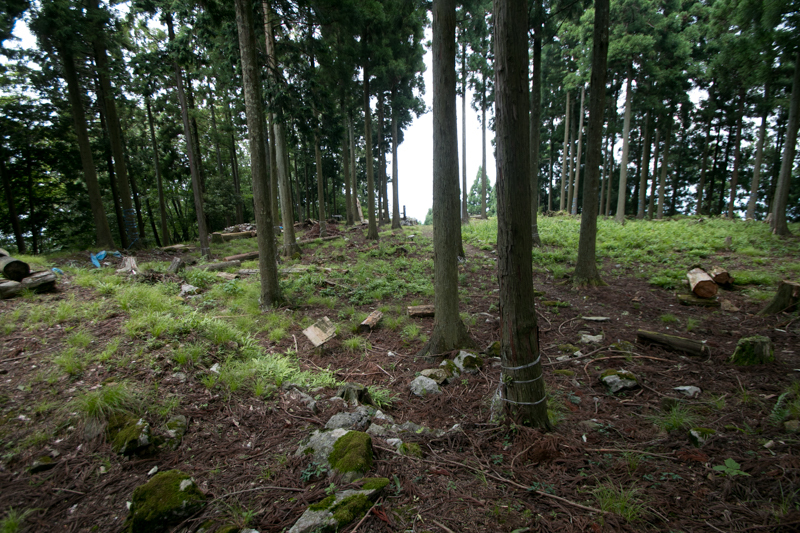 Utilizing this victory Azai clan left Rokkaku clan and became the warlord of northeastern part of Omi province. 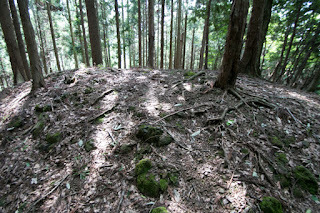 Contrary to this, after the battle of Norada, Rokkaku clan tried to proceed centralization but failed by opposition of retainers. 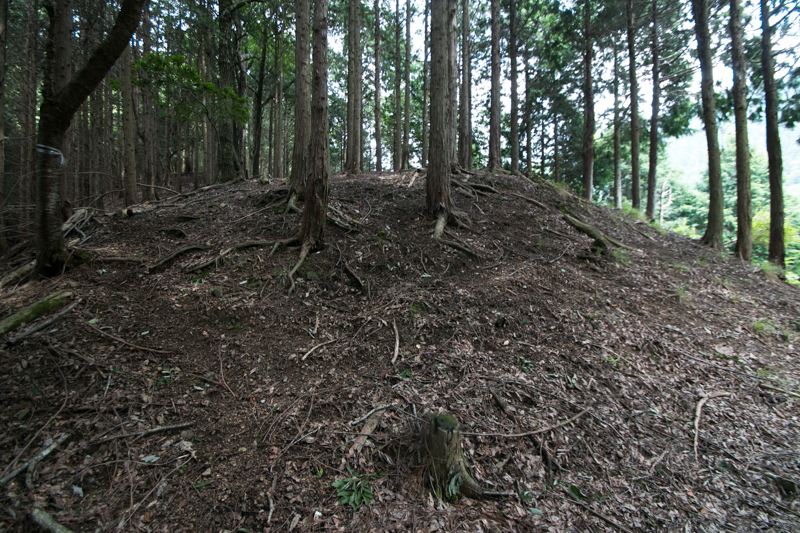 But Rokkaku clan still had larger territory and army than Azai clan, thus Azai clan had to secure recovered Sawayama castle and Kamaha castle as a front line toward Rokkaku clan. 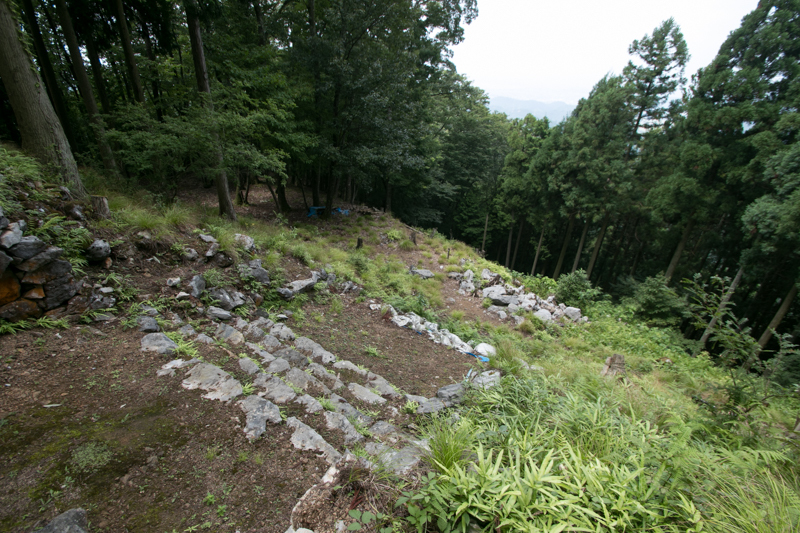 Nagamasa Azai supported Hori clan to renovate Kamaha castle by advanced technology in 1560's. 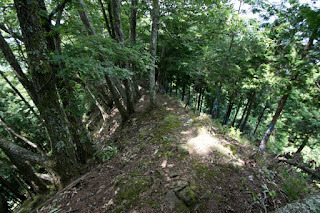 Kamaha castle is built on a narrow and long ridge of over 300 meter long. 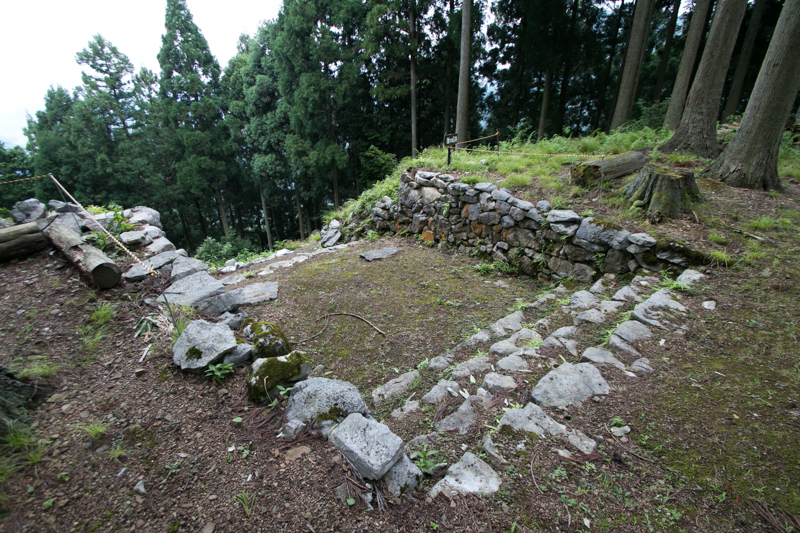 Central area of Kamaha castle is a trapezoid shaped terrace of 40 meter long and 30 meter wide, which had a basement of watchtower at its backside at southern line. 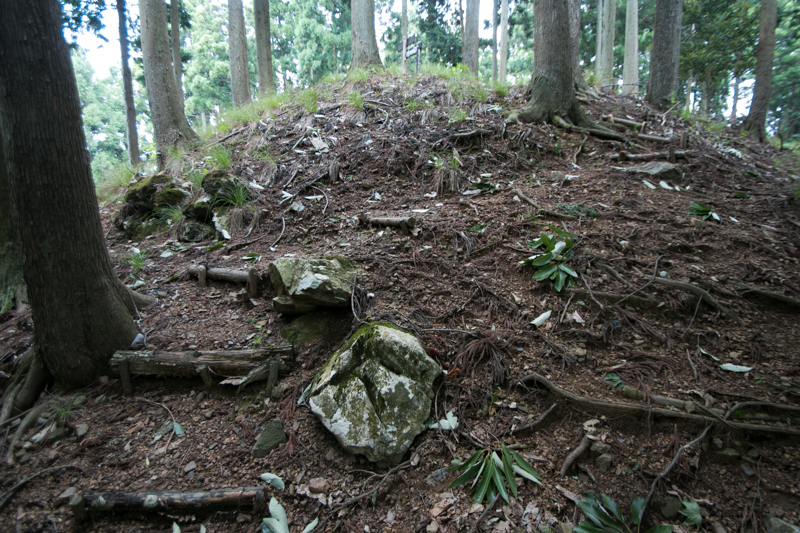 This watchtower basement might have stone walls at both outside and inside, as a reinforcement of ground and decoration. 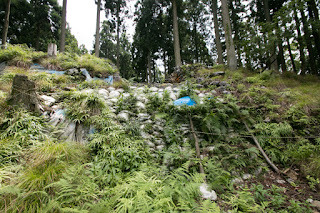 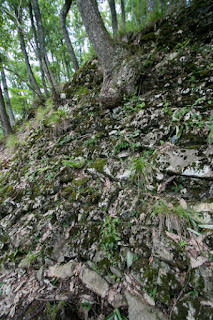 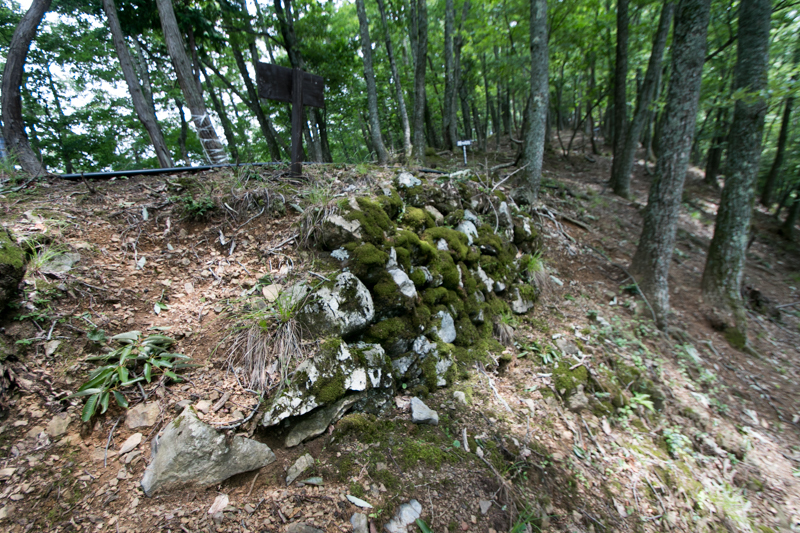 Whole wall of central area might be protected by stone wall. 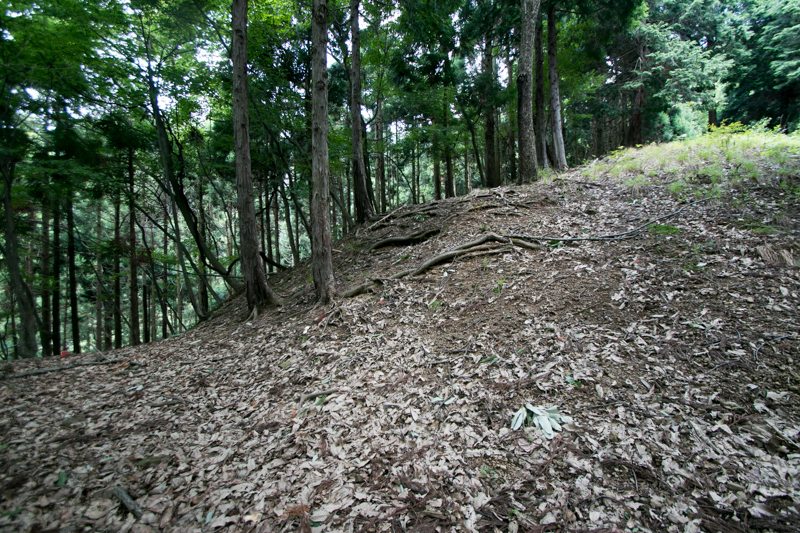 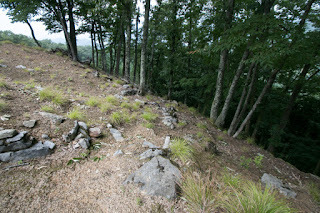 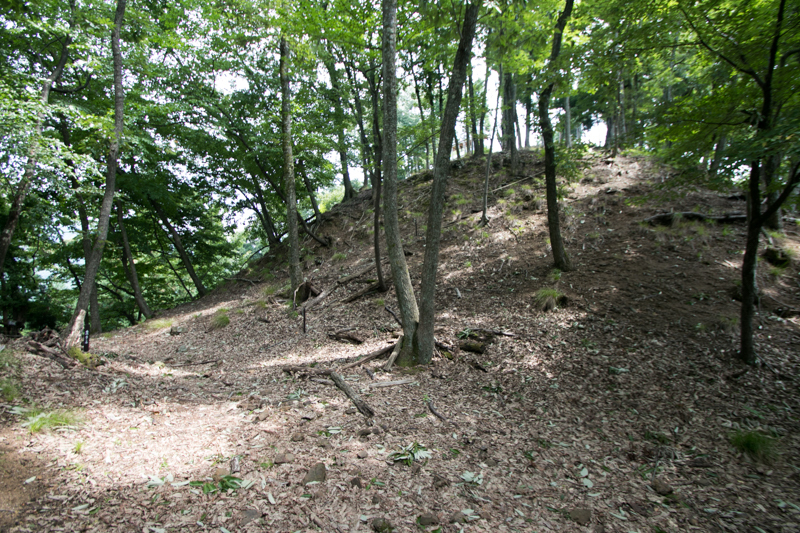 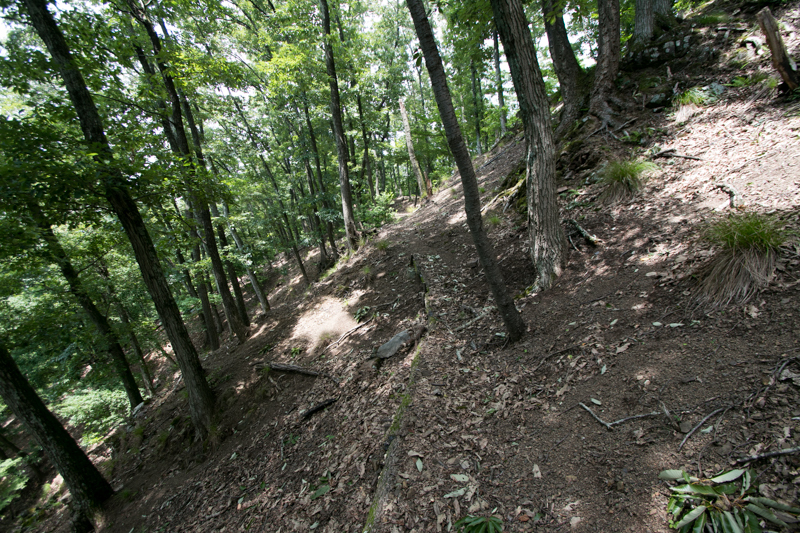 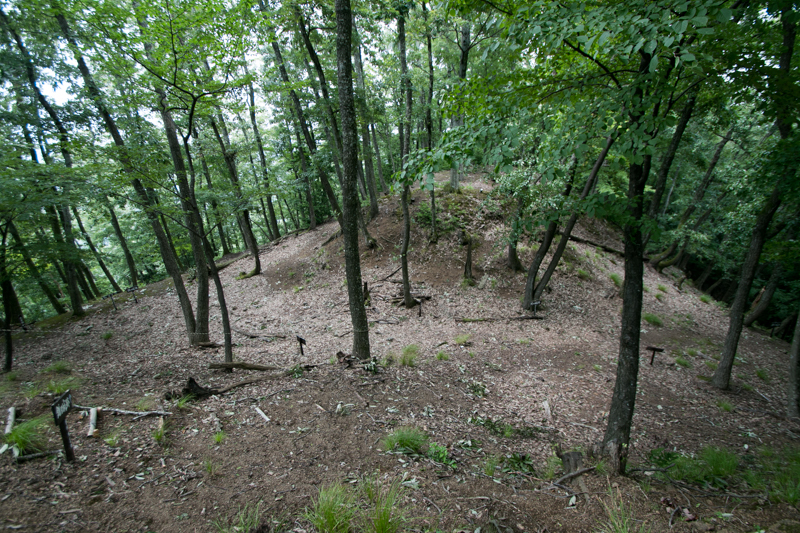 At the north of central area, terraces are built along the ridge to the tip of the ridge. 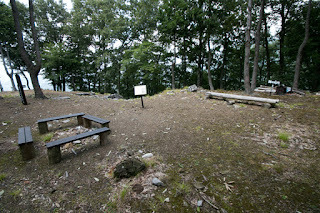 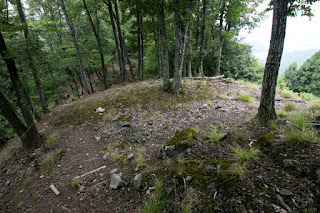 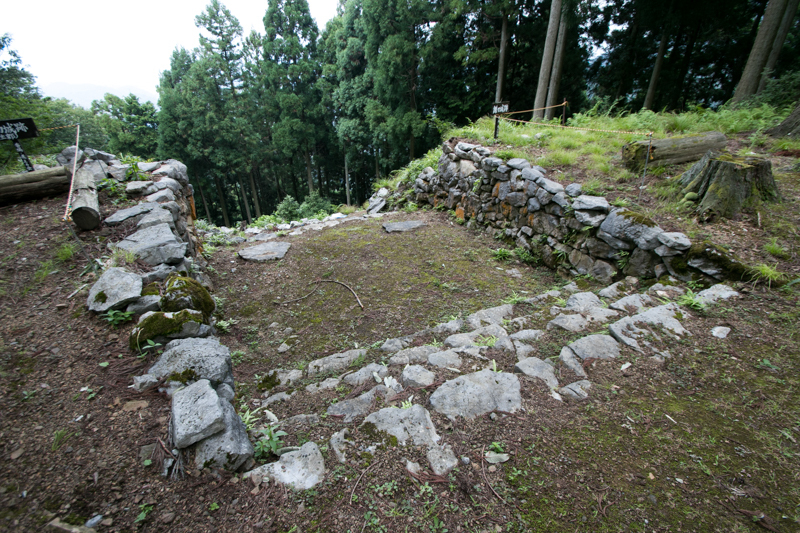 The terrace at the edge of the ridge is a square shaped terrace of about 25 meter long, might have a large building of about 20 meter long square. This building supposed to be a tower of two story with one basement floor, and exceptionally large building equivalent to small main tower of later castle, to be built at the castle of retainer. 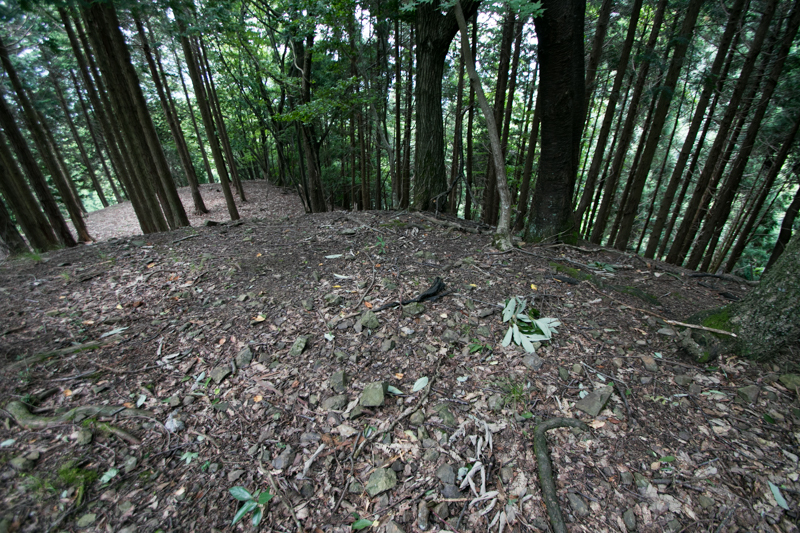 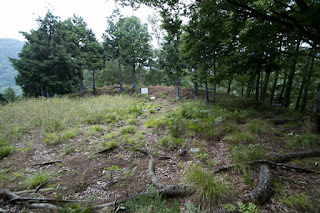 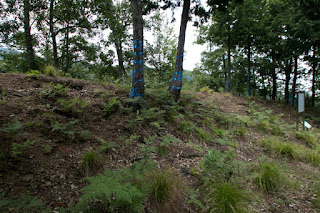 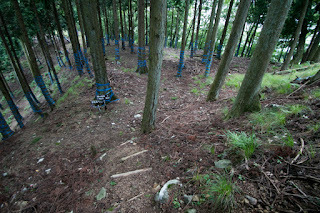 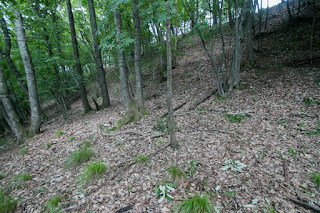 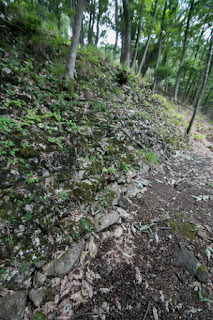 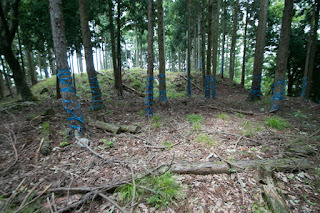 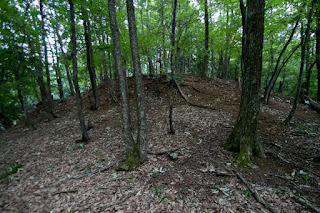 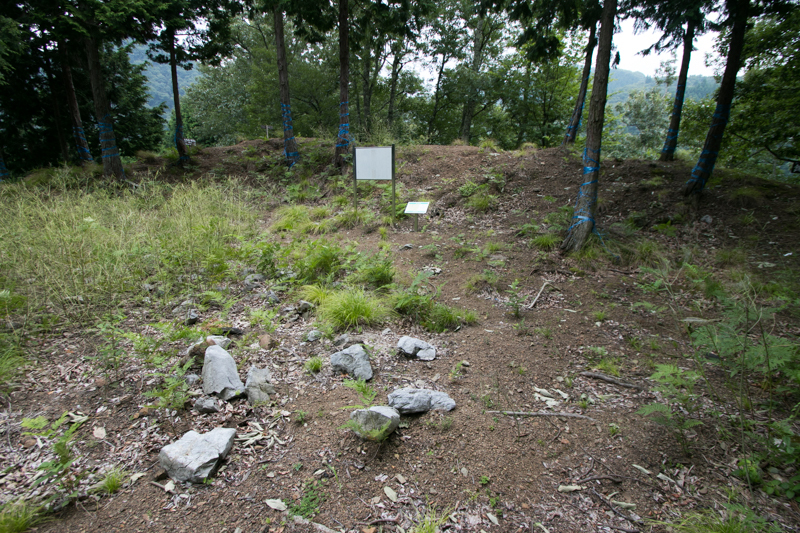 As north ridge is a main climbing road from hillside, and this building might be built as a defense line to fire the enemy from higher place. 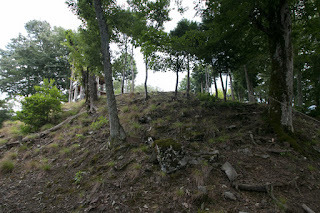 Of course this building might be seen well from hillside, and also worked as a symbol of the castle. 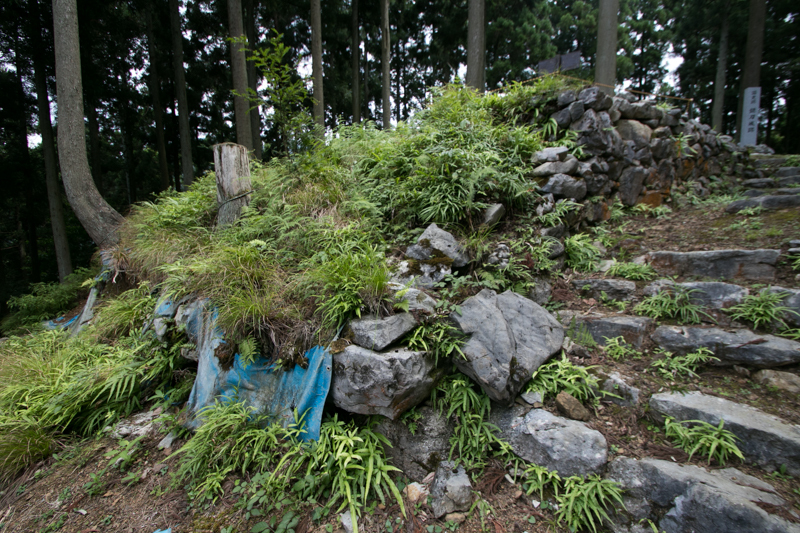 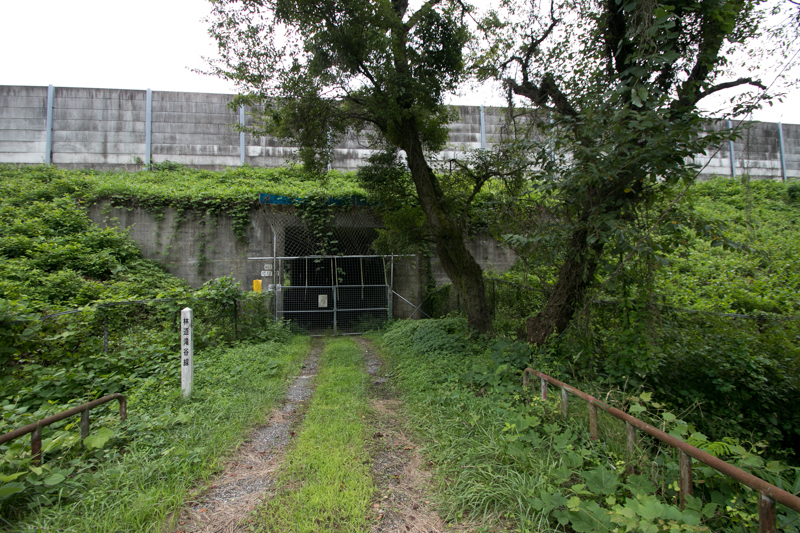 Behind this building, another Masugata style gate protected by stone walls is built as an entrance to core area. 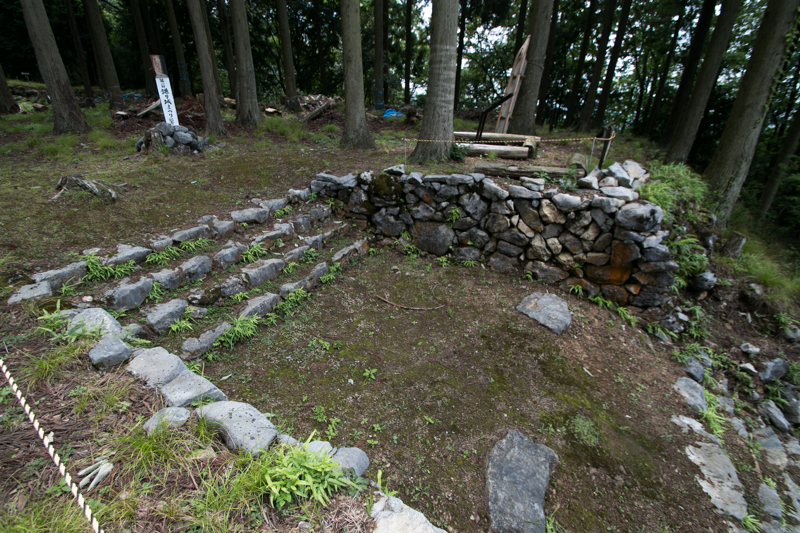 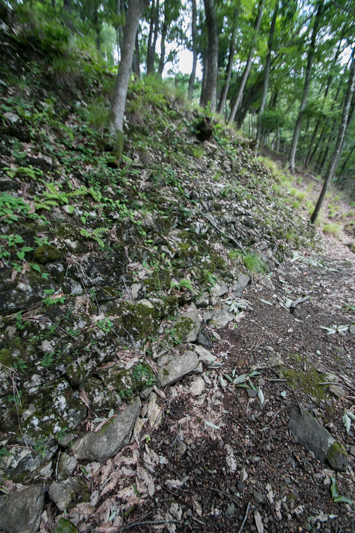 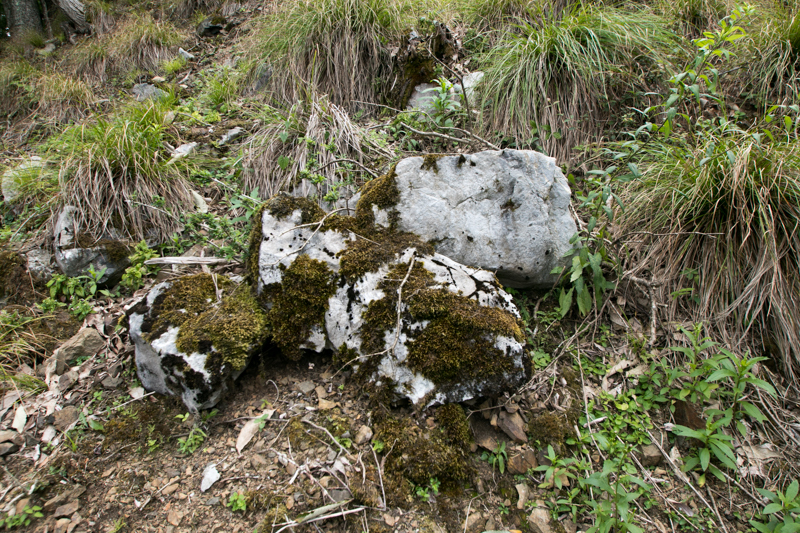 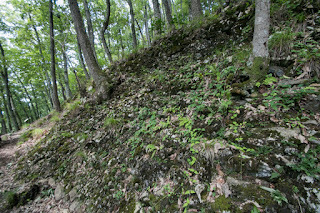 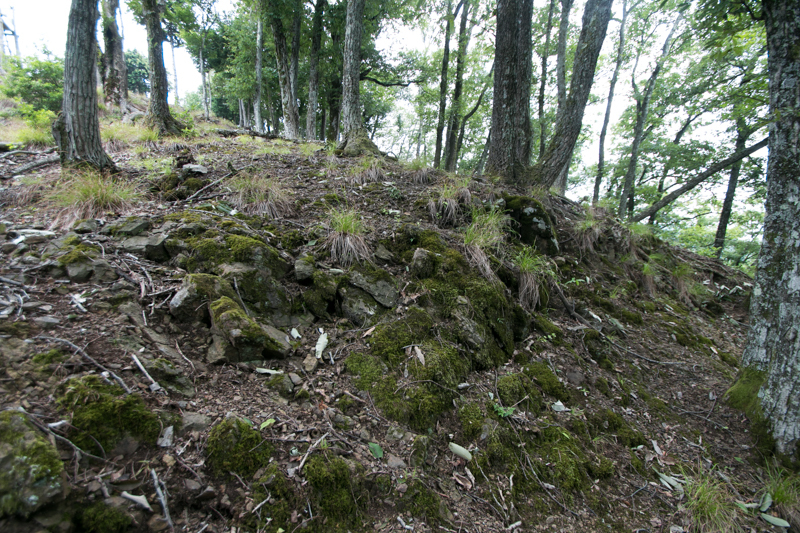 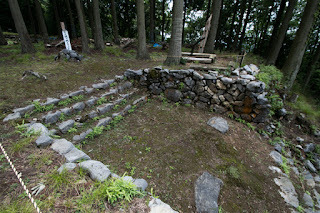 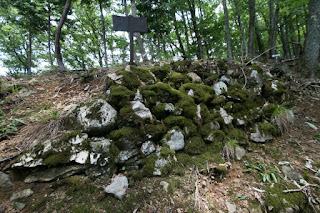 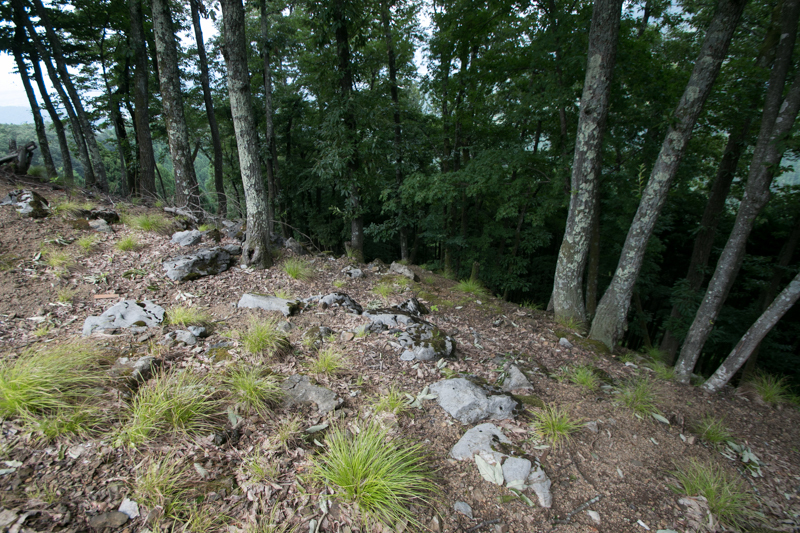 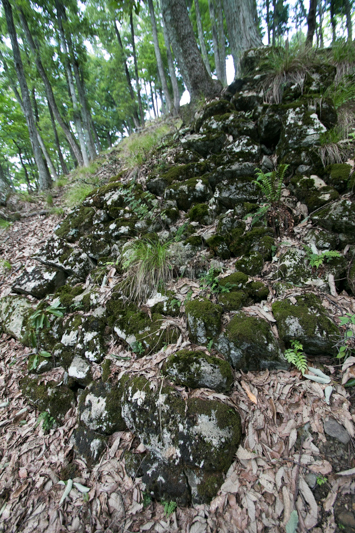 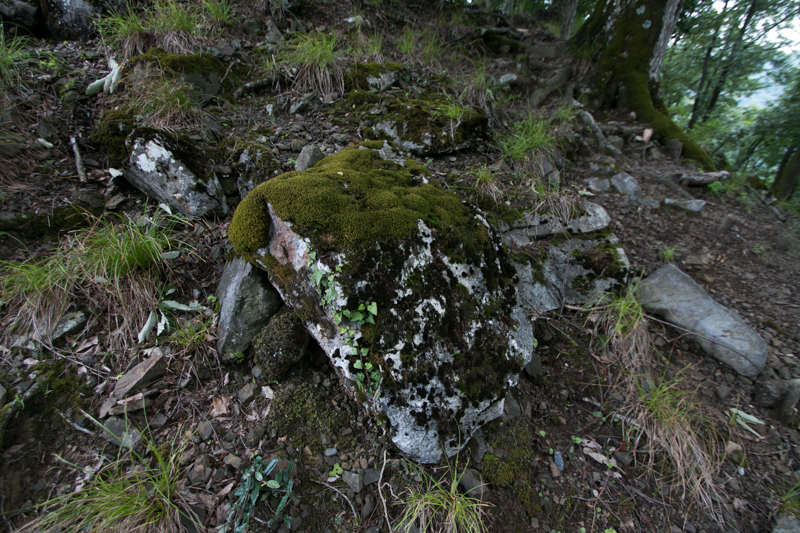 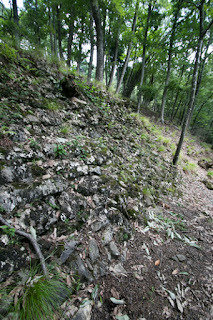 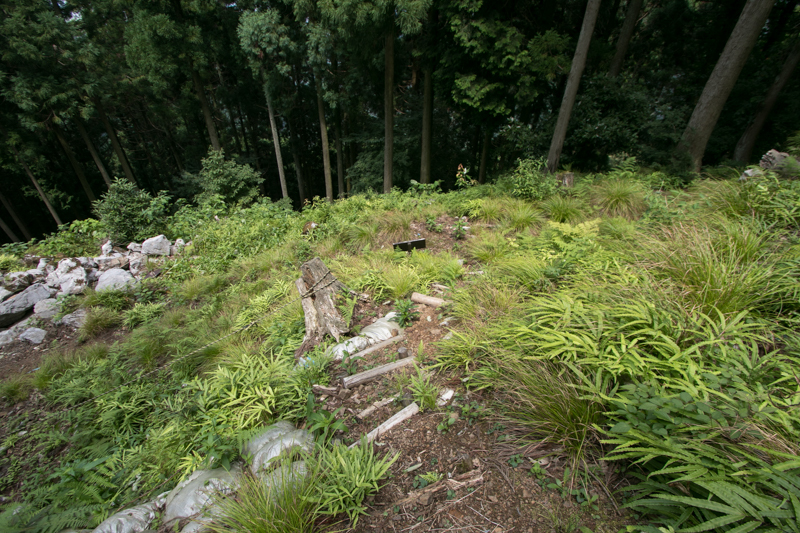 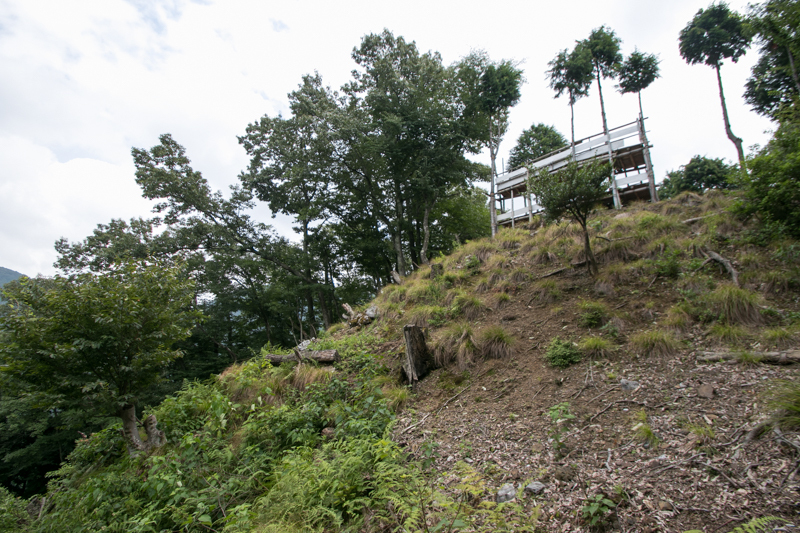 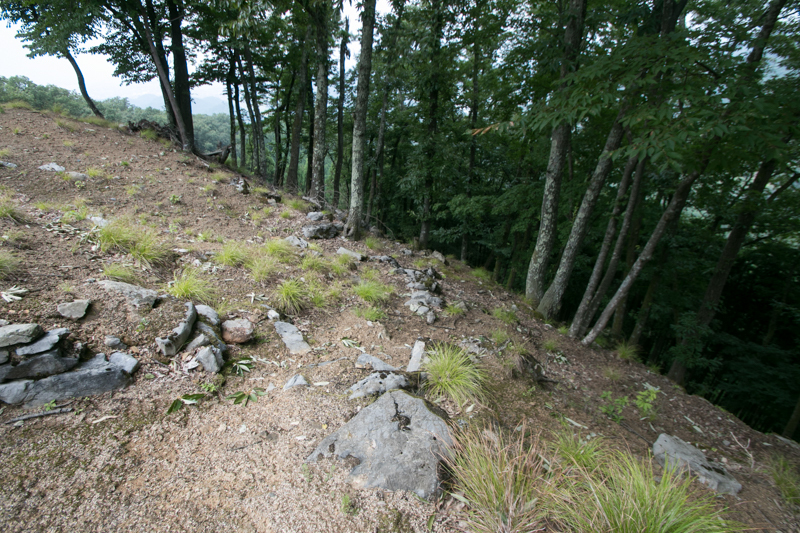 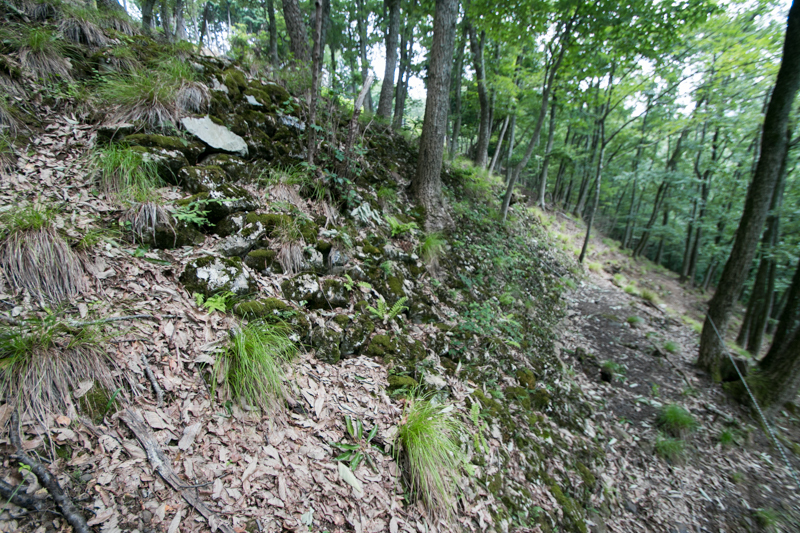 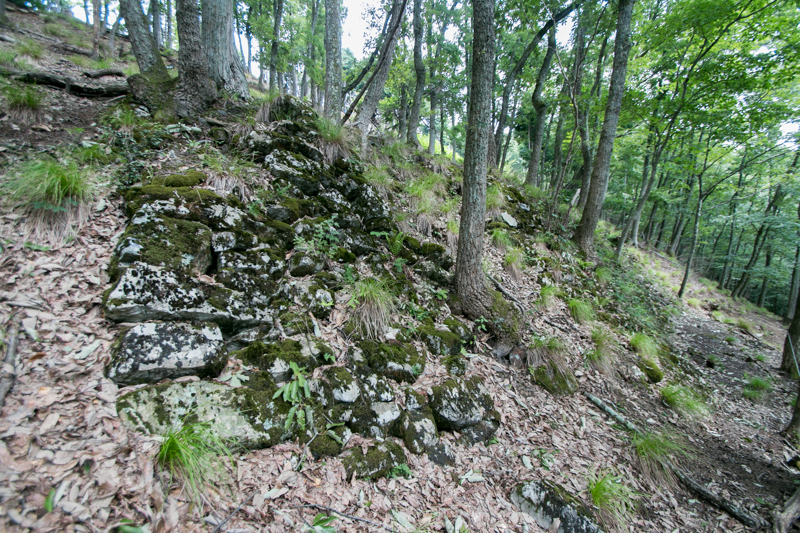 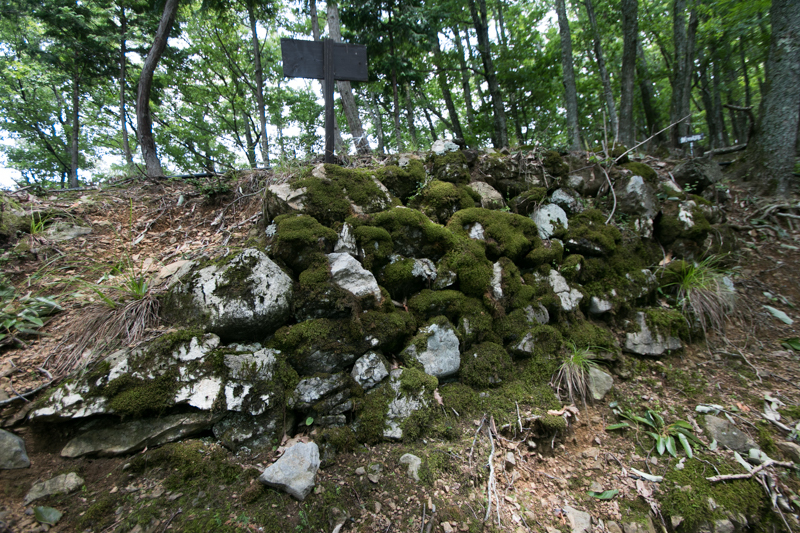 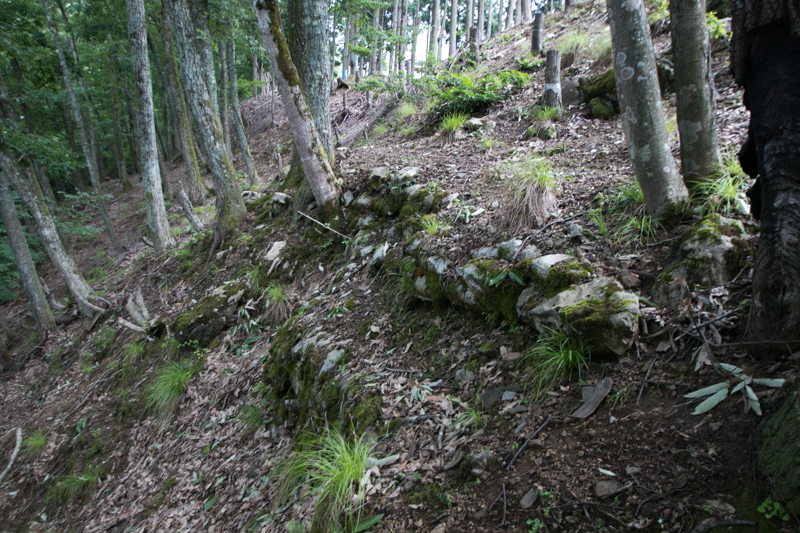 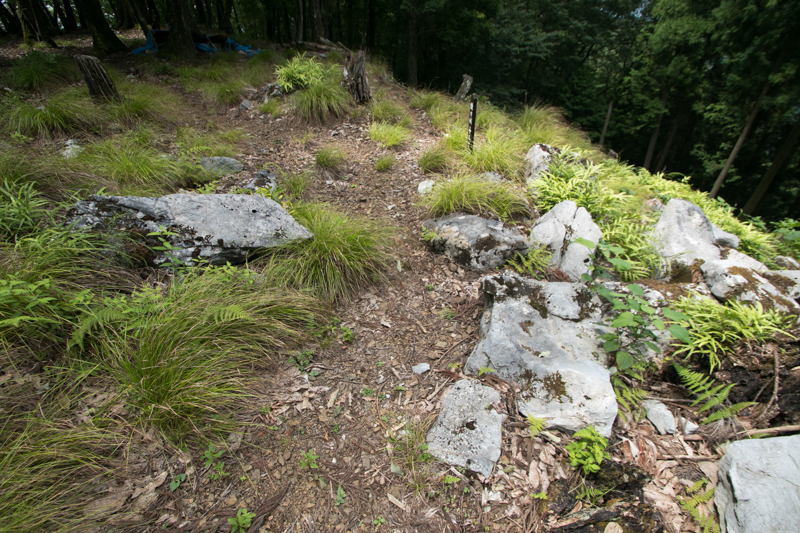 At the western slope of this core area, stone walls were built to make a terrace. 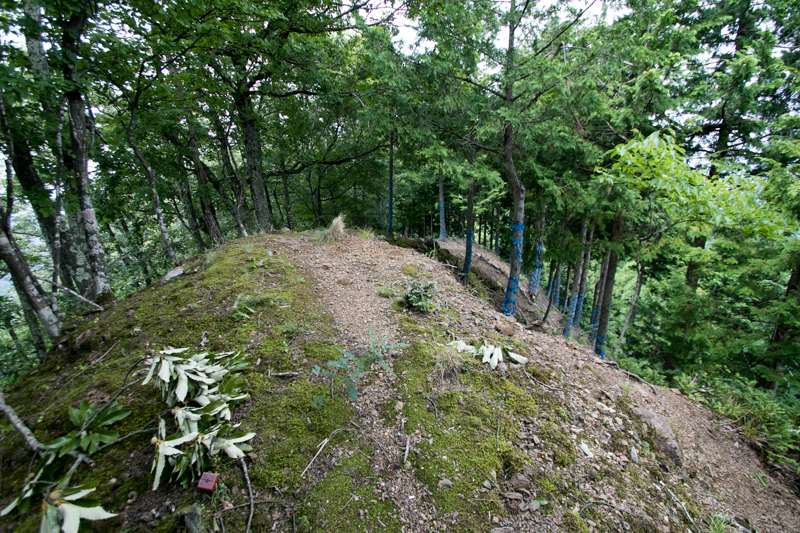 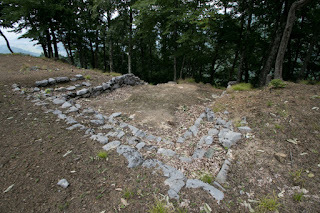 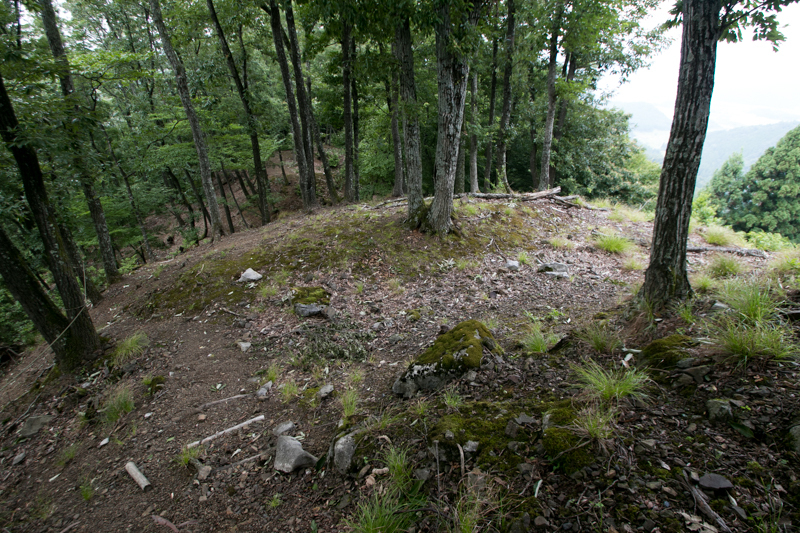 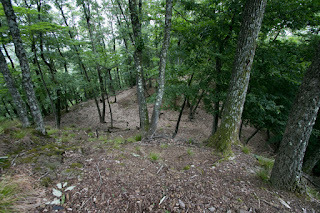 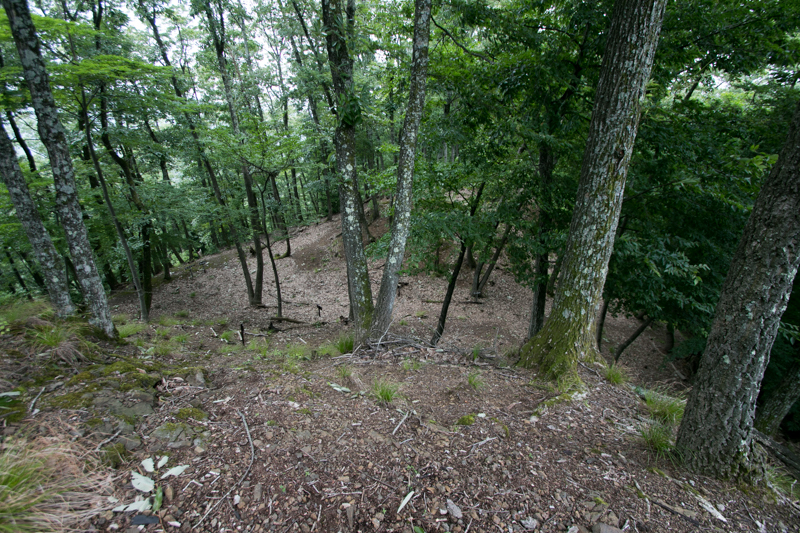 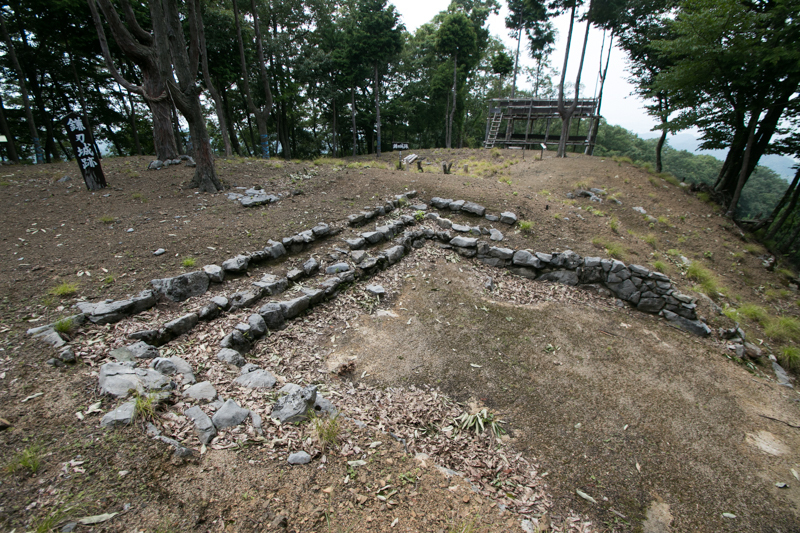 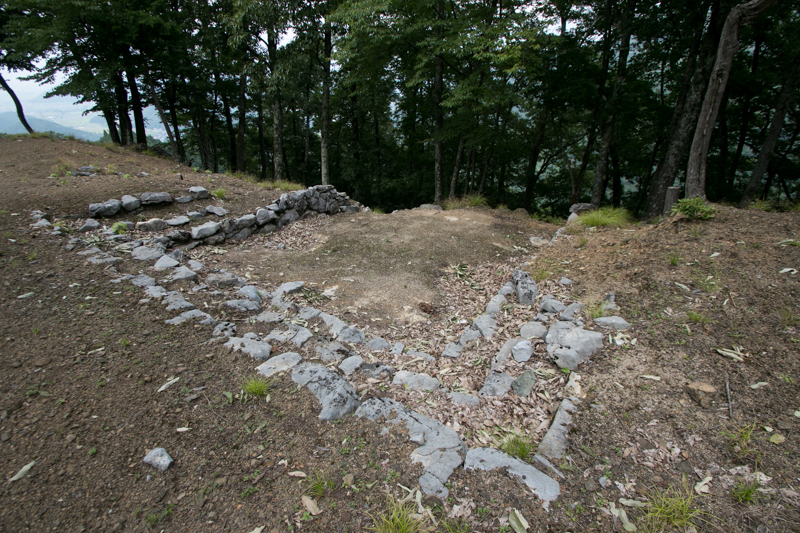 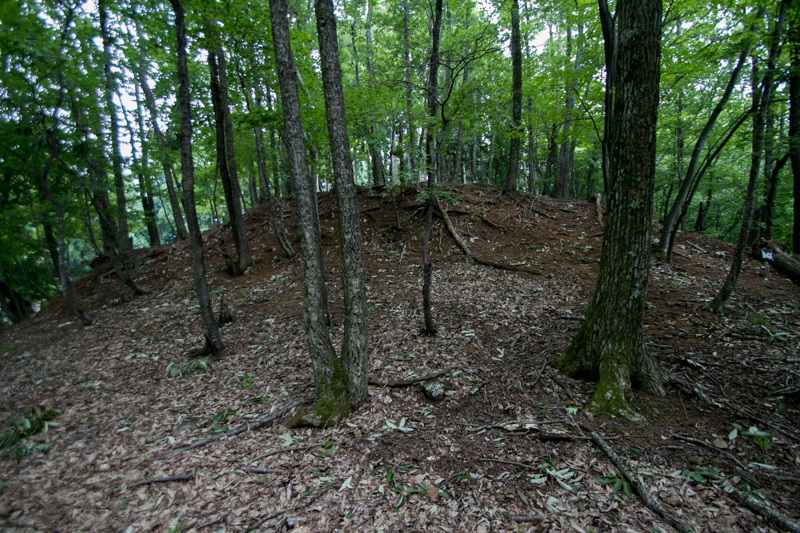 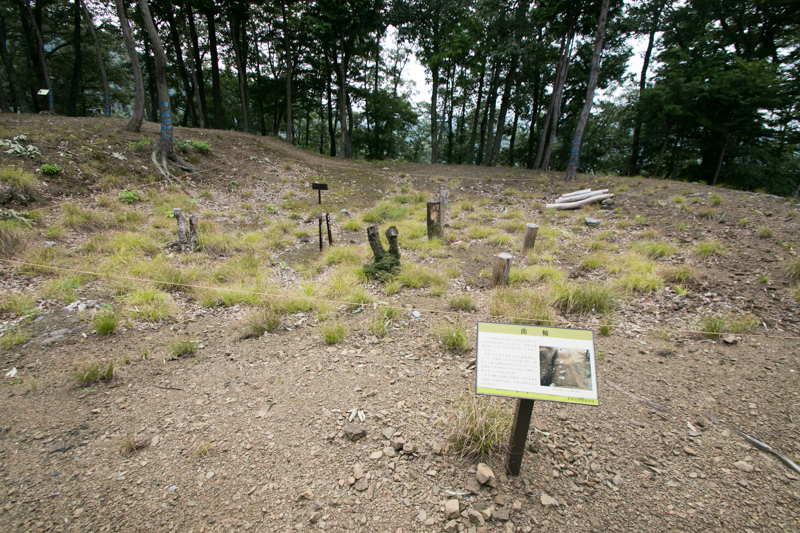 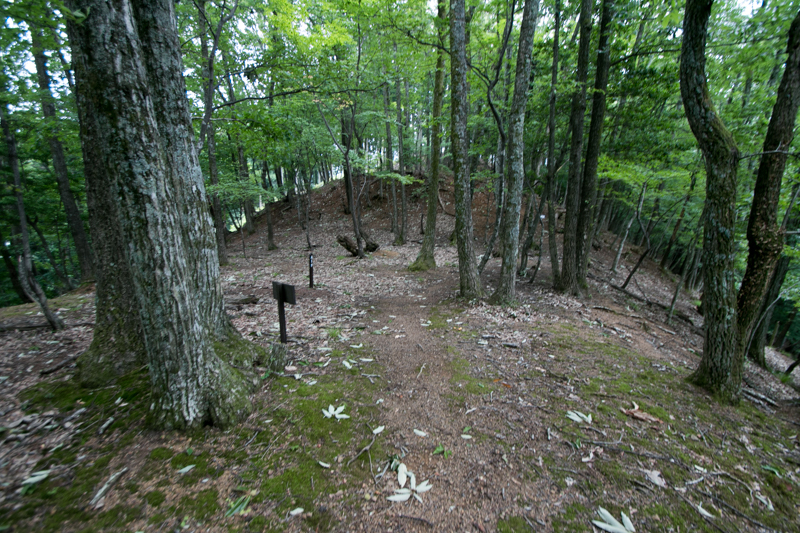 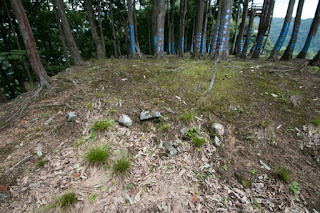 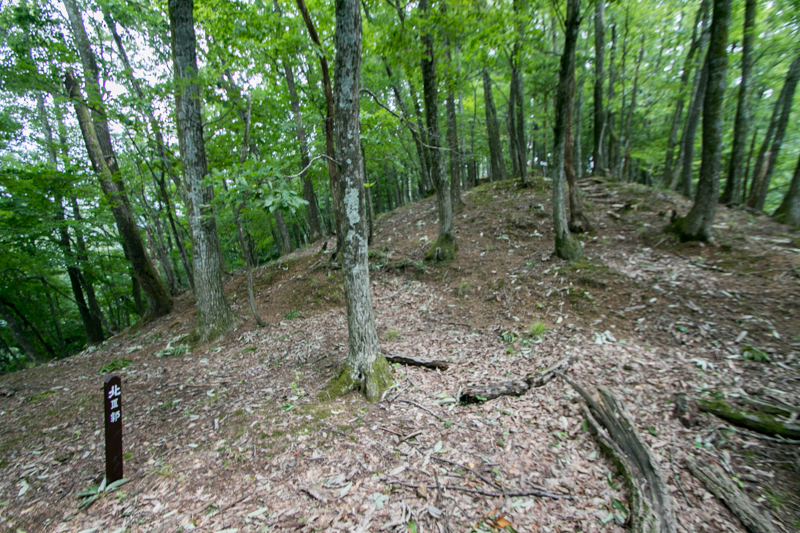 At the south of central area, two terraces were built to guard the backside of the castle. 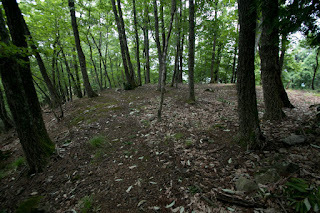 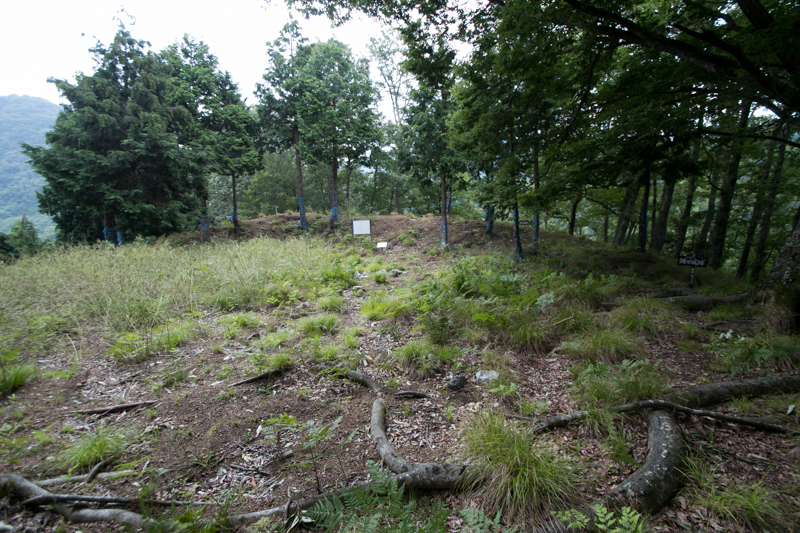 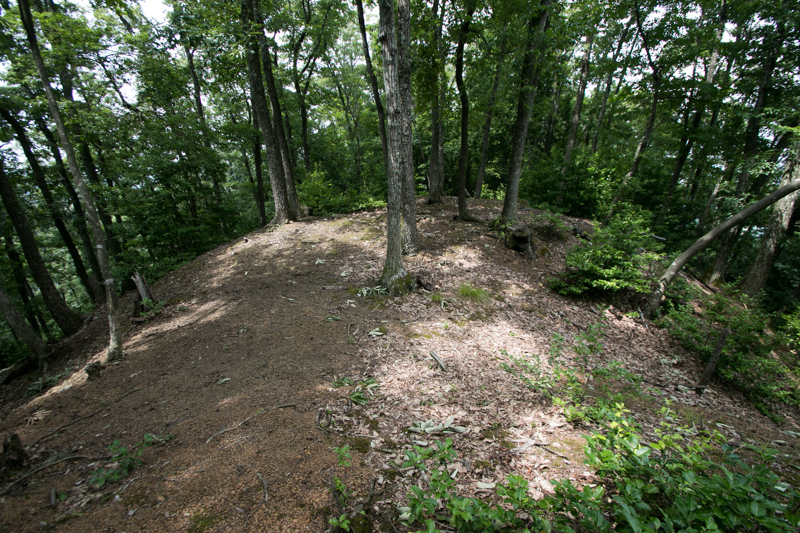 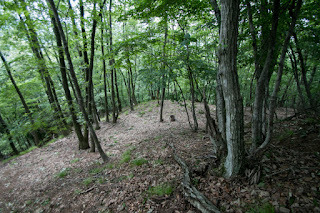 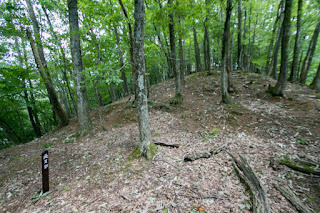 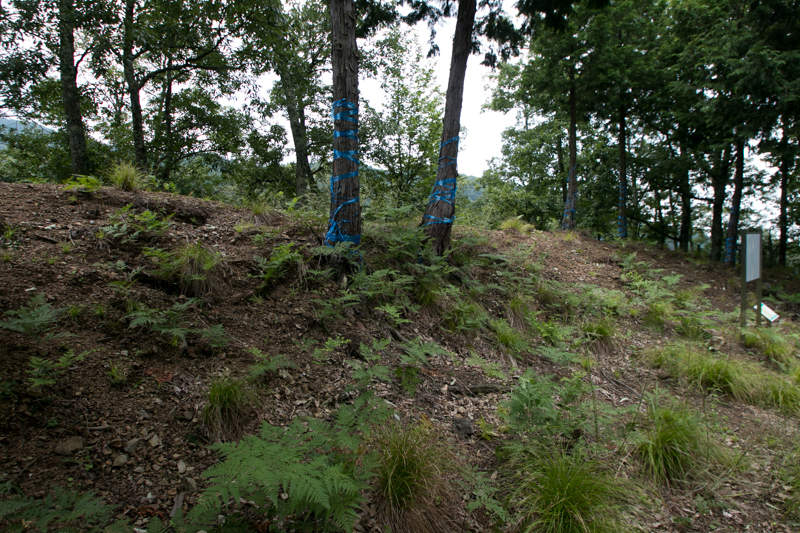 Southern one is the core area to defend southward and connecting point of western part of the castle built at steep slope goes down westward. 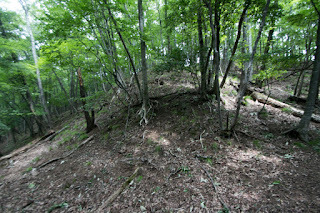 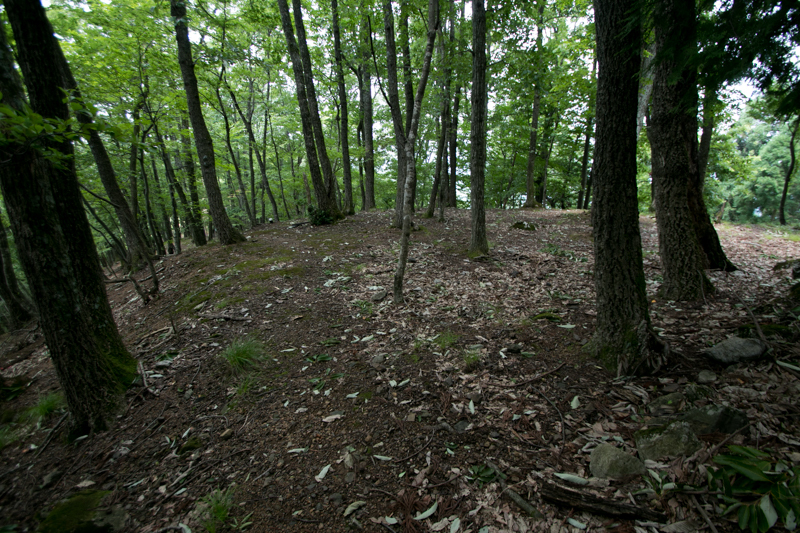 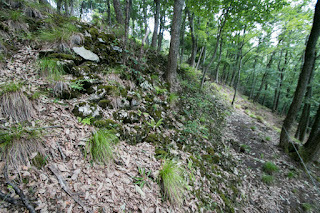 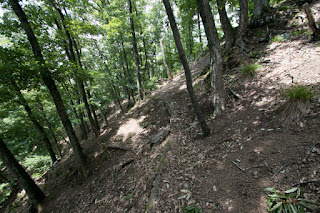 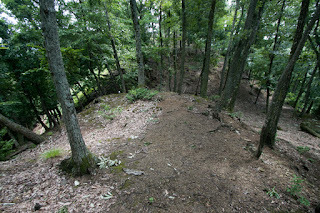 The south half of this area is also protected by the line of stone wall and deep dry moat. 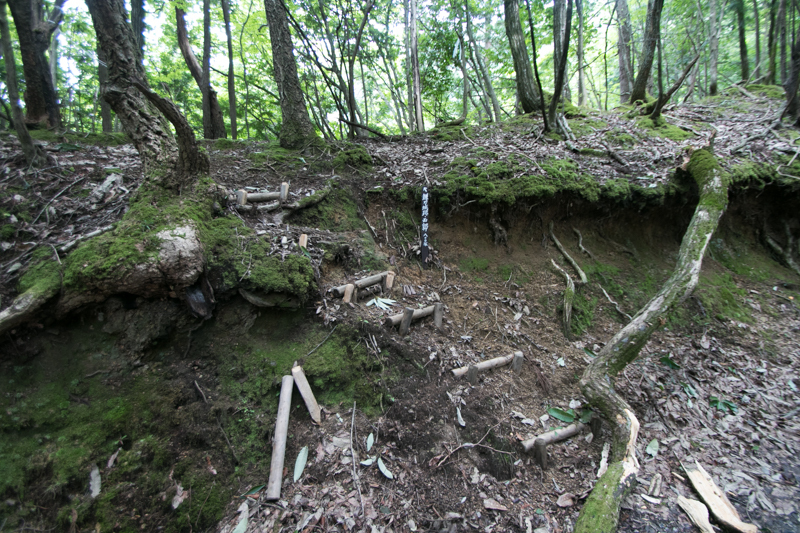 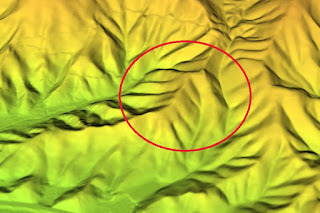 As this area is connected to the higher backside mountains by narrow ridge, this ridge is securely protected by multiple layered dry moats. 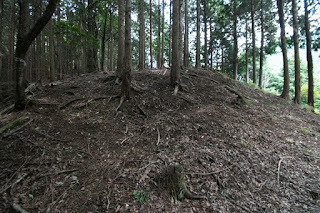 Considering the age of renovation in 1560's, Kamaha castle is built with an advanced technology same as Odani castle, Originally Rokkaku clan and Azai clan preceded in castle technology such as usage of stone walls, and especially Azai clan changed the technology accepted from Rokkaku clan to more practical one. Later central ruler Nobunaga Oda studied the technology of Azai clan and further evolved it and formed the style of modern castle. 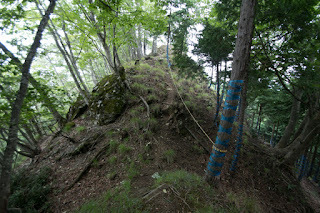 Utilizing Kamaha castle and Sawayama castle, the border of Rokkaku clan and Azai clan seemed stable. 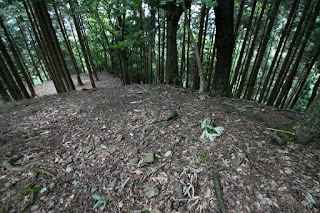 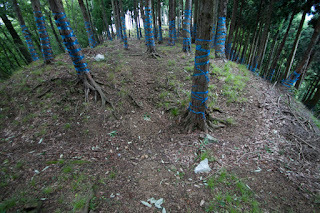 Hori clan became an important retainer of Azai clan at border area, then proceeded into the border to Mino province and built Matsuoyama castle as a border fort. But the enemy of Azai clan came from different direction. In 1568, Nobunaga Oda (1534-1582) who was the local lord of Owari province (western part of Aichi prefecture) but captured Mino province (Gifu prefecture), allied with Nagamasa then marched to the capital Kyoto city. 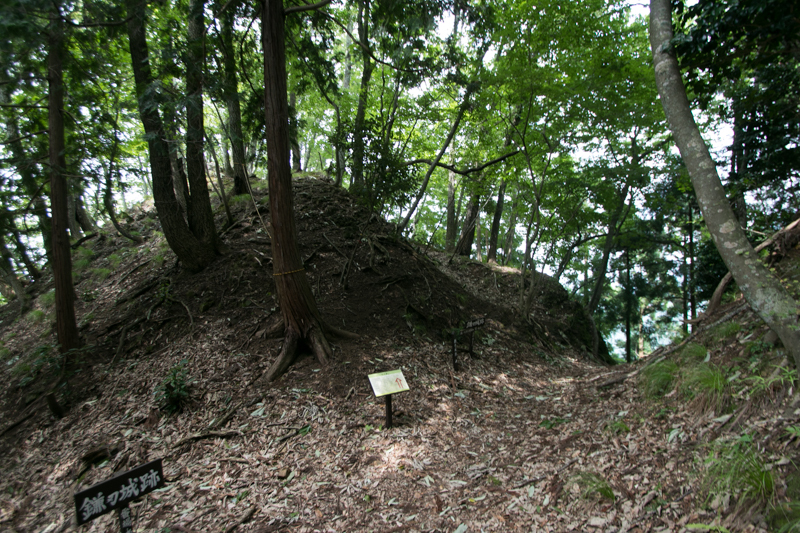 Nobunaga easily broke Rokkaku army and fell their main base Kannonji castle, then entered into Kyoto city and established their own government. 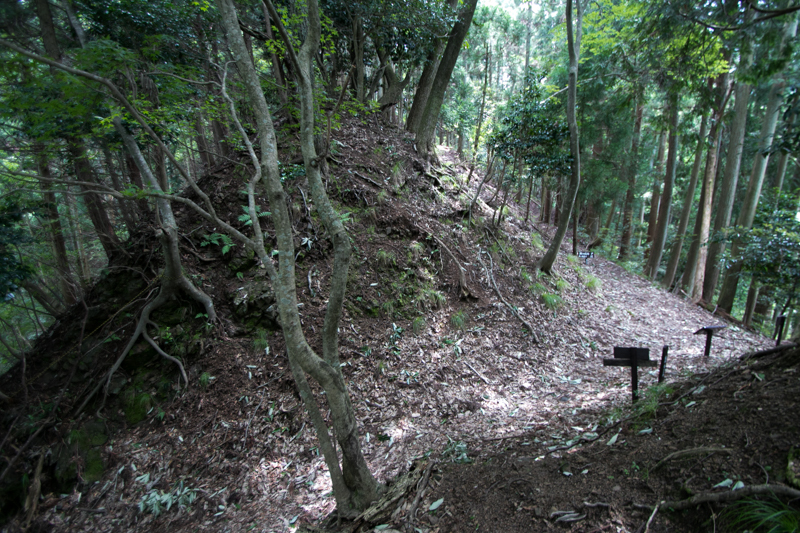 However, in 1570, Nobunaga marched to Echizen province to subjugate Asakura clan did not follow to Nobunaga. 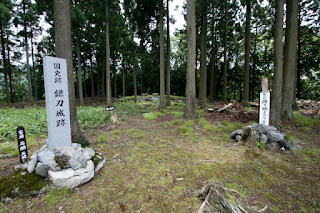 Nagamasa Azai wavered between the alliance with Nobunaga and obligation to Asakura clan, but finally broke with Nobunaga and supported Asakura clan. 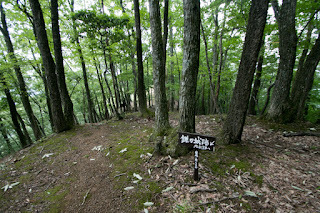 Nobunaga barely returned from Echizen province started struggle with Azai clan. 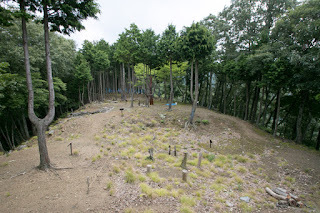 At this time, under the recommendation from Shigeharu Takenaka (1544-1579), an acquaintance of Hori clan and staff of Hideyoshi Hashiba (1537-1598, later Hideyoshi Toyotomi) who was the general of Oda army, Hori clan changed to Oda clan. 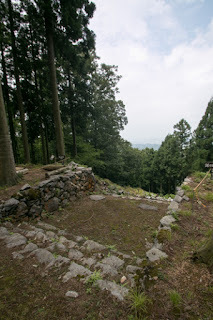 Because of the change of Hori clan, Nobunaga could keep the connection route between Kyoto city and his main base Gifu castle (Gifu prefecture), and built defense line against Azai clan. 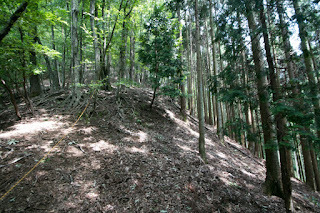 Looking at the change of Hori clan, Nagamasa had to keep supply line for Sawayama castle then fought against Oda army at Anegawa. 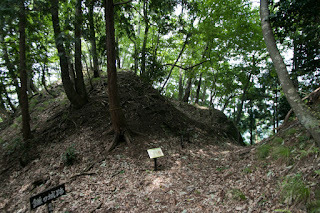 But at this battle of Anegawa Nagamasa was finally broken by Nobunaga, then later Sawayama castle became isolated also surrendered to Nobunaga. 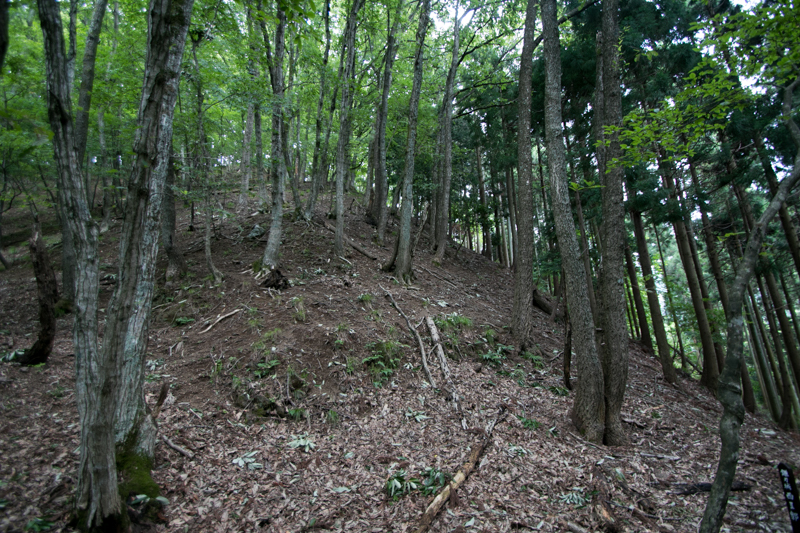 In response to this Azai army attacked Kamaha castle several times, but Hori clan and Hideyoshi Hashiba cooperatively rejected this attack. 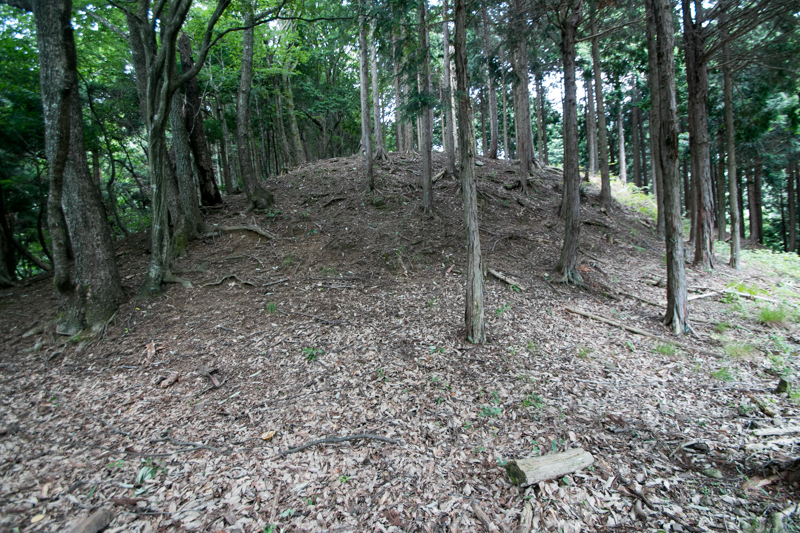 In 1573, Nobunaga ruined Asakura clan at first next siege Odani castle then ruined Nagamasa Azai. 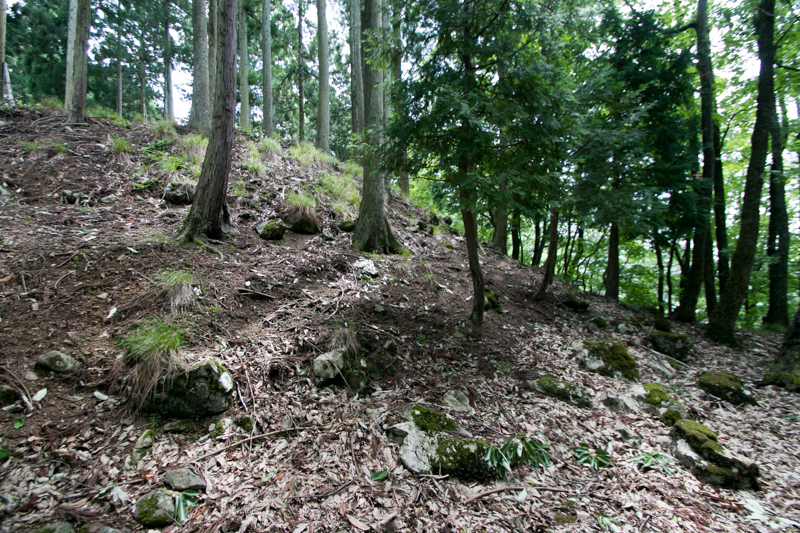 Hori clan once kept their territory but was attached as a retainer of Hideyoshi Hashiba who became the lord of former Azai territory. 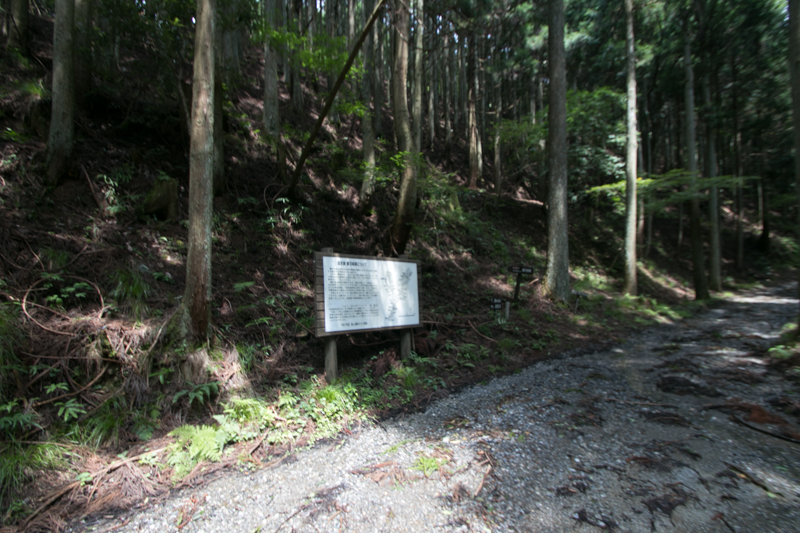 Hori clan became dissatisfied with their position and conflicted with Hideyoshi, and was finally expelled in 1574. 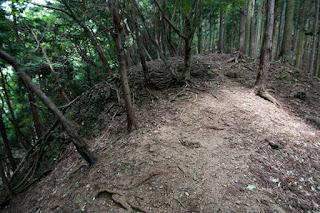 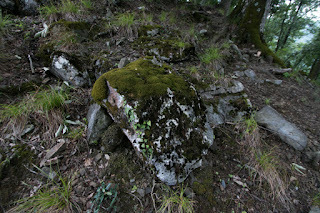 At this time Kamaha castle was abolished and broken, as this area was not a border any more. 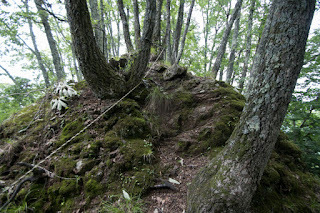 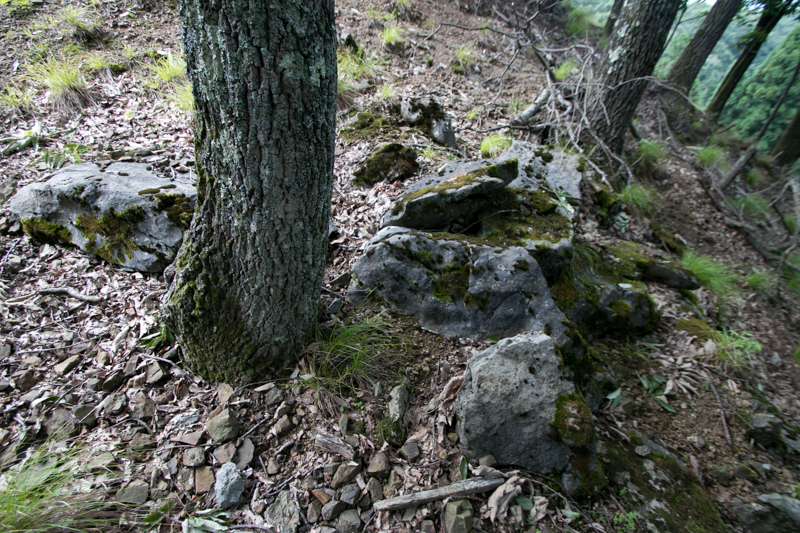 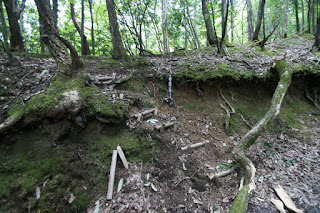 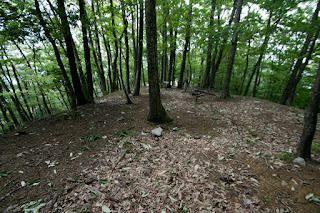 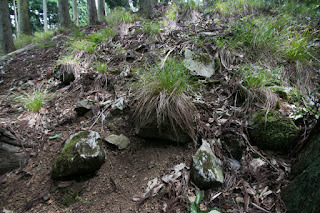 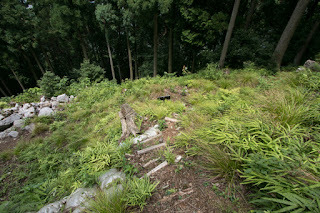 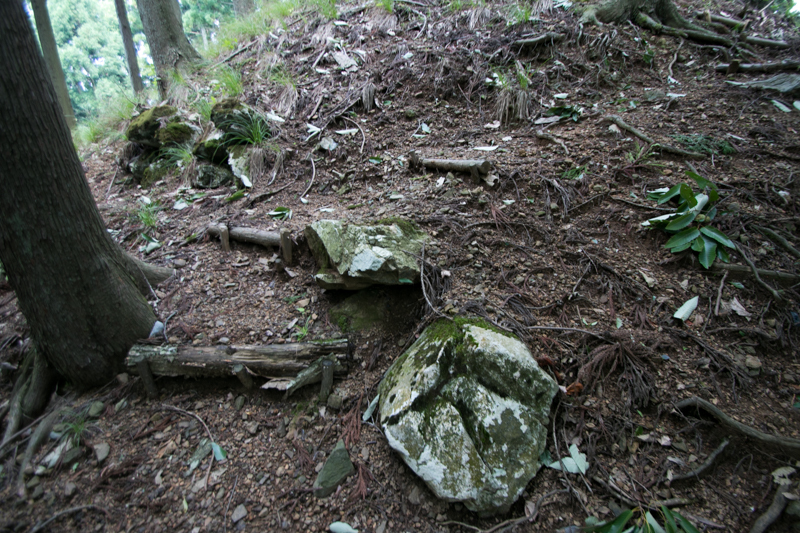 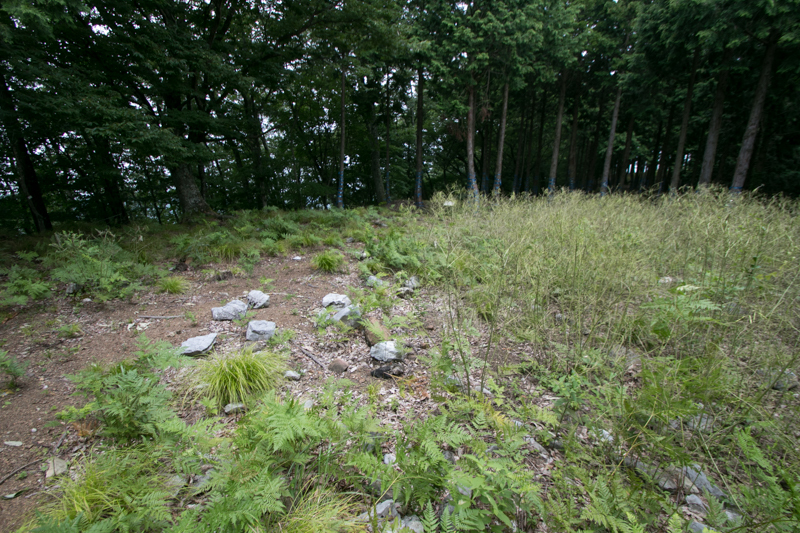 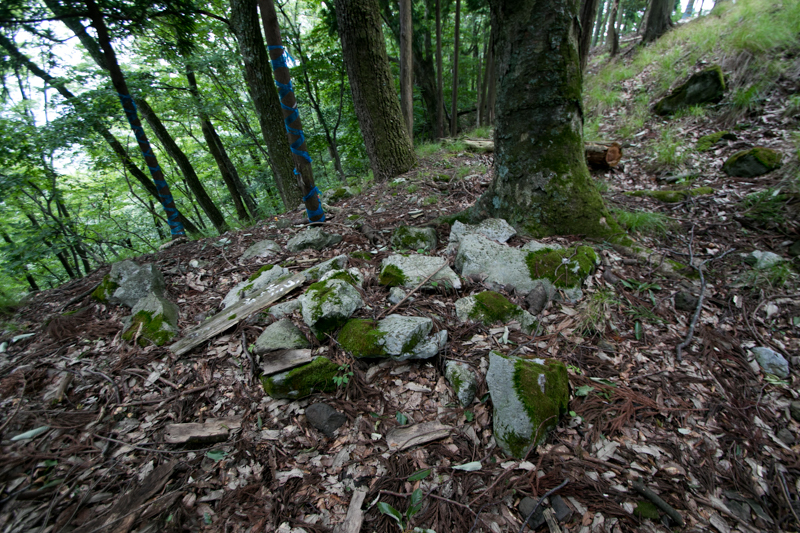 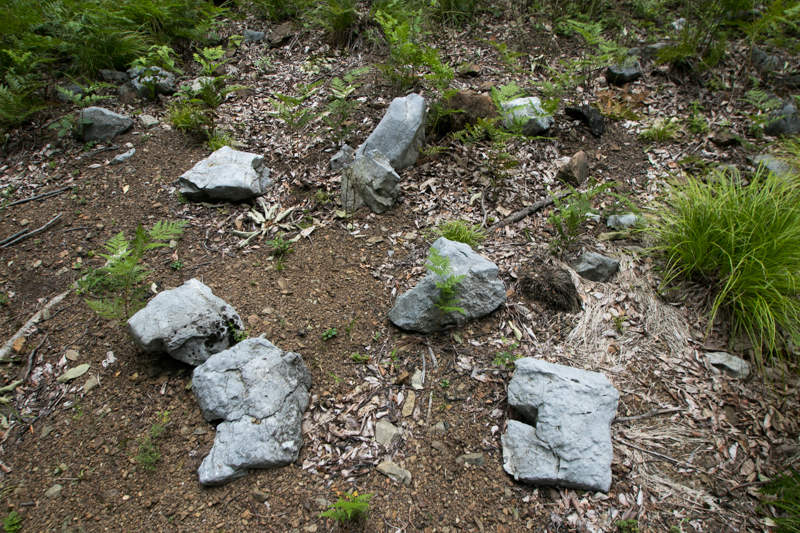 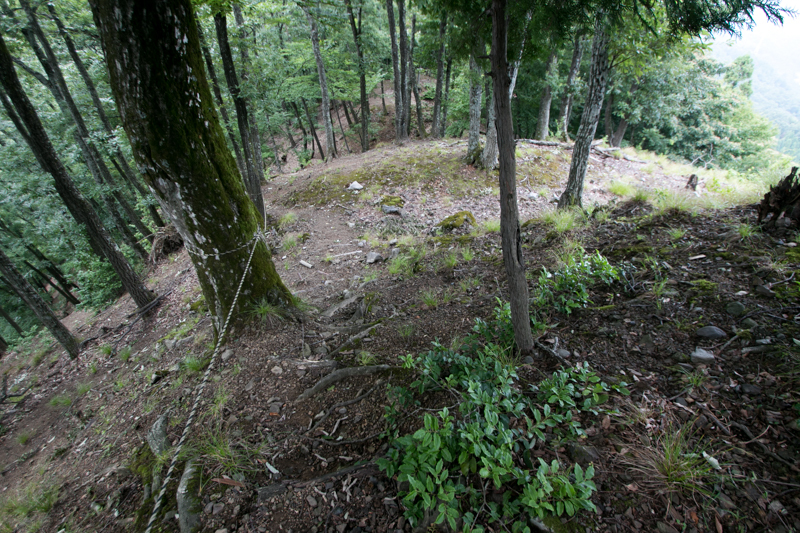 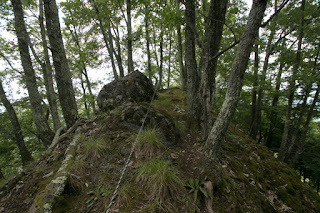 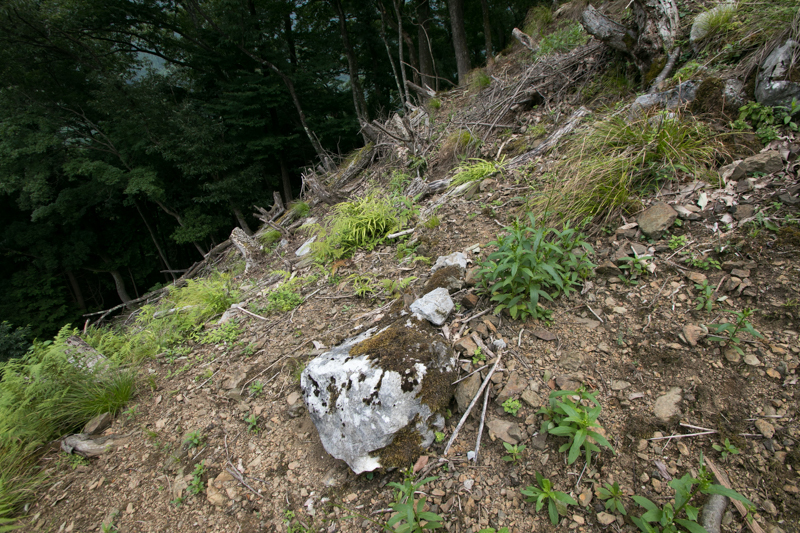 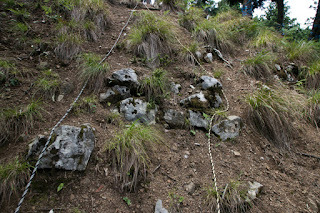 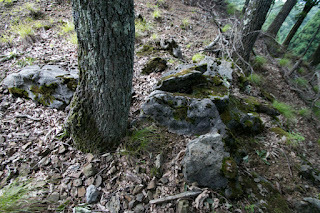 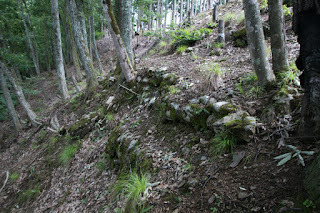 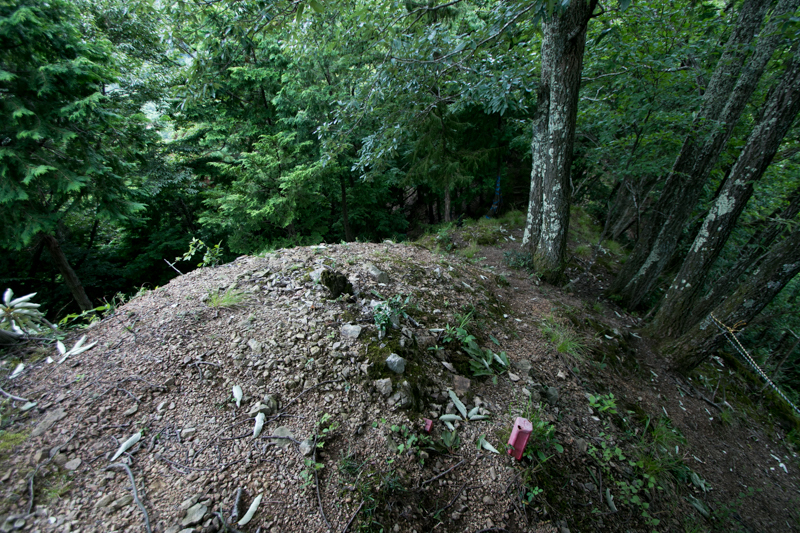 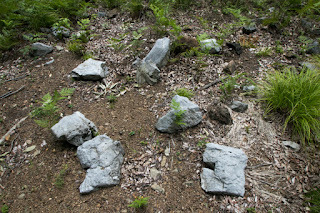 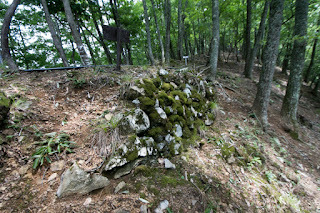 Now all building was lost but structure of the castle well remain on the mountain with broken stone walls. Innovative elements of Kamaha castle shows geographical importance of Kamaha castle, and also a subtle situation of Hori clan affected by strong warlords and finally disappeared into the history. Prominent view of Lake Biwako from the front gate of central area might be the same as 450 years ago when Kamaha castle was just at battlefront. 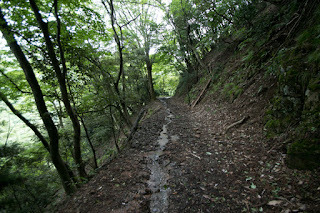 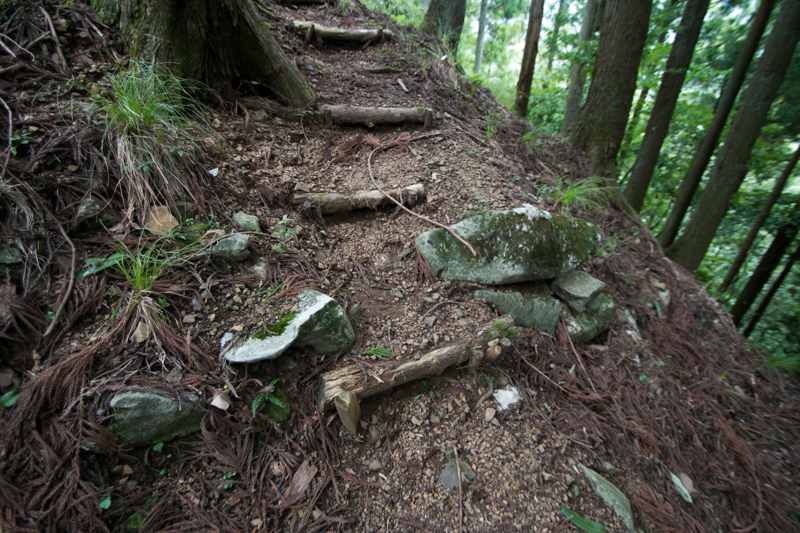 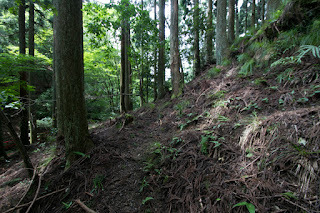 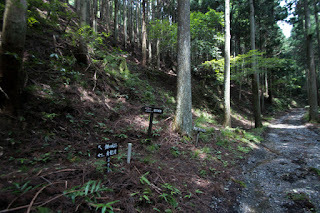 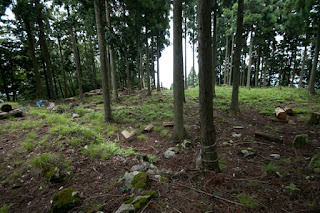 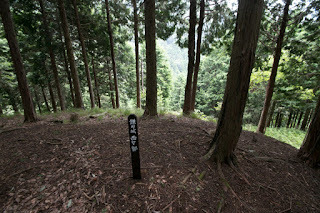 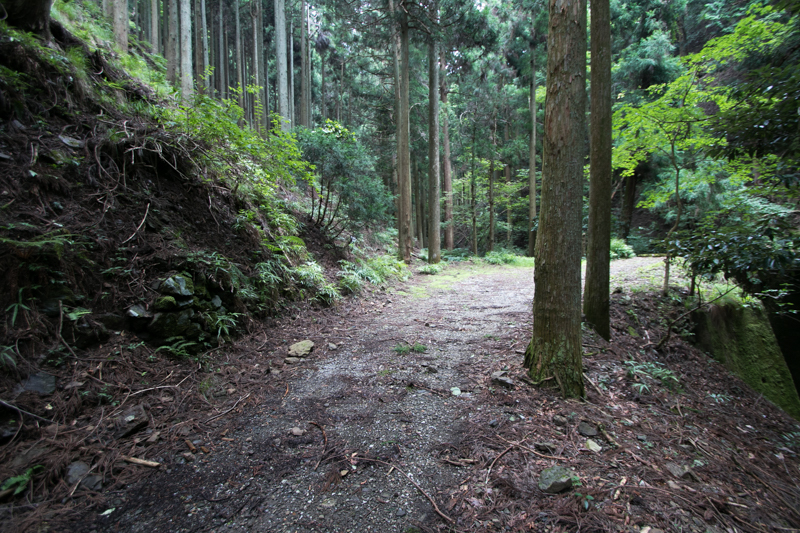 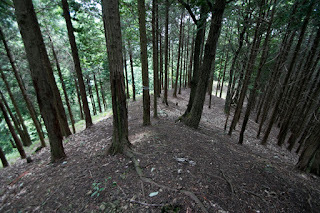 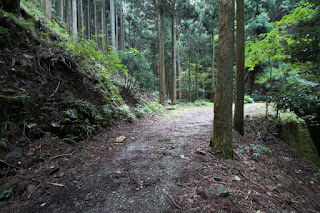 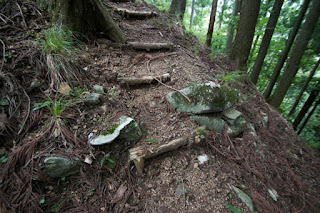 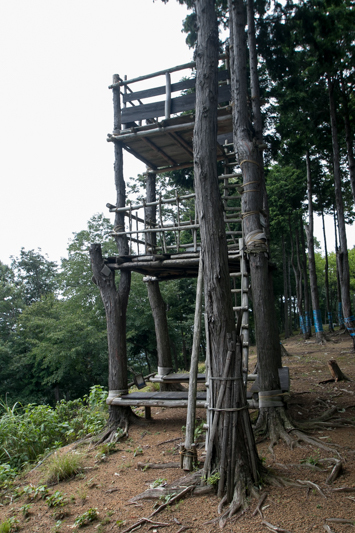 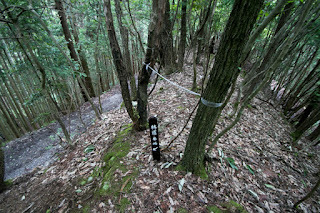 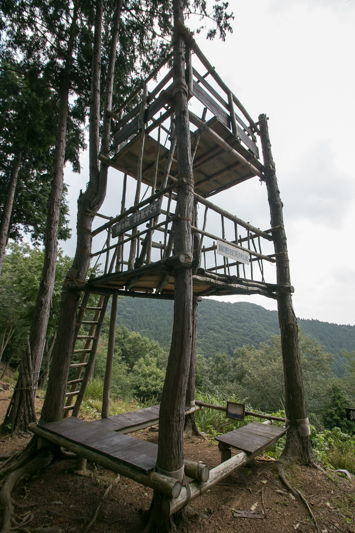 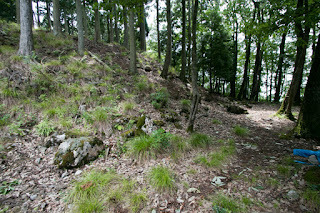 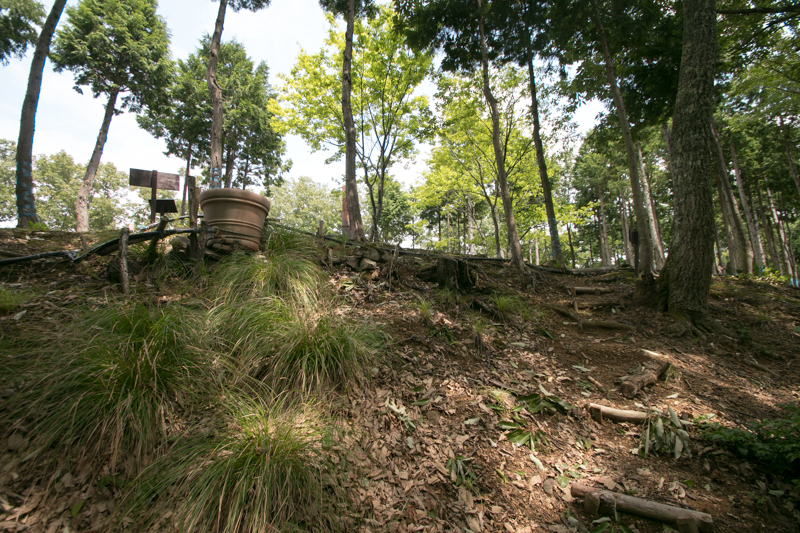 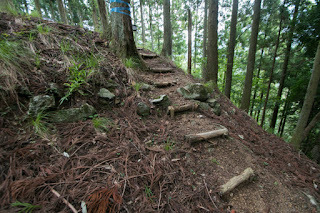 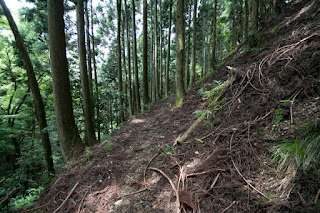 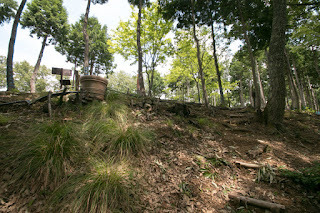 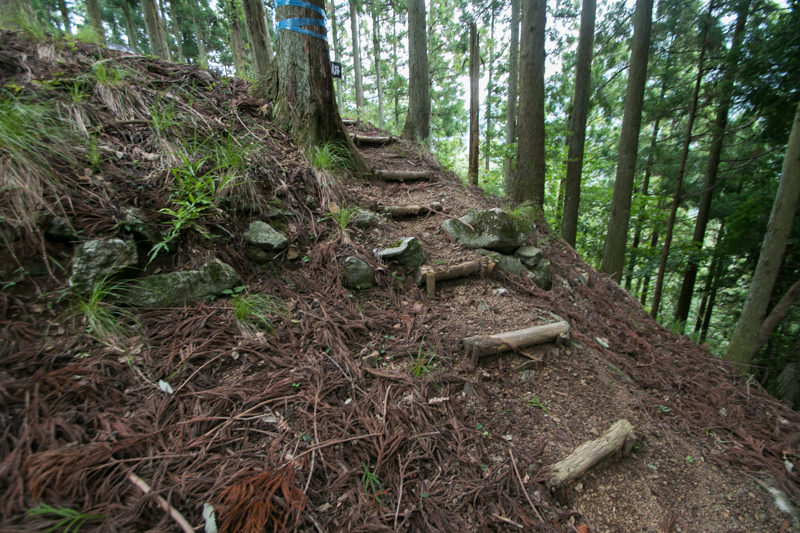 45 minutes walk from south edge of Banba town via Takitani-Rindo forest road to hilltop castle. 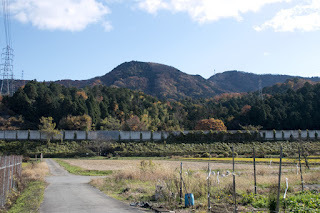 Banba town itself is accessible by bus from JR West Maihara station. 10 minutes drive from Meishin Expressway Maibara interchange to Banba town (it is difficult to drive up forest road by car).